Mt Elizabeth Station was our next stop on the Gibb but only a one night stop over to access the Munja Track. 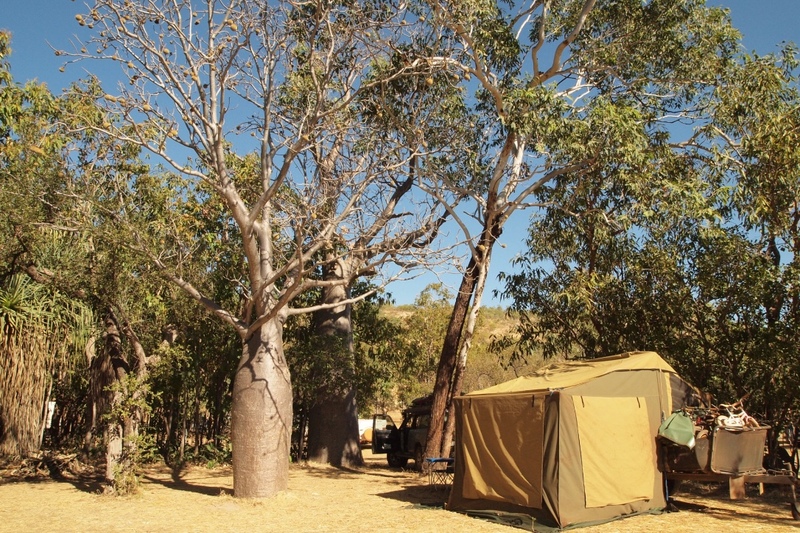 The camping at Mt Elizabeth station is well spread out with nice grassy sites and some large shady trees we had a great spot in the corner where we could watch some wallabies jumping thru the bush. 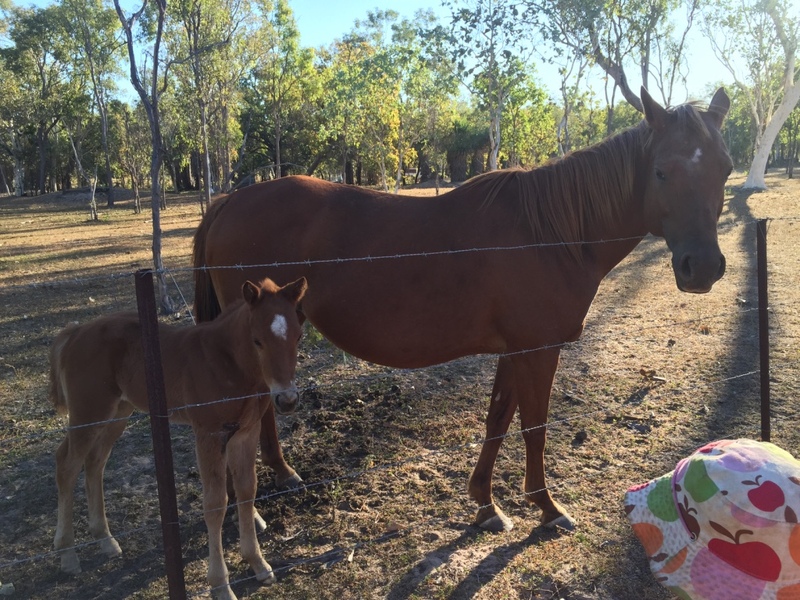 The highlight at Mt Elizabeth was a horse and her gorgeous two week old foal. 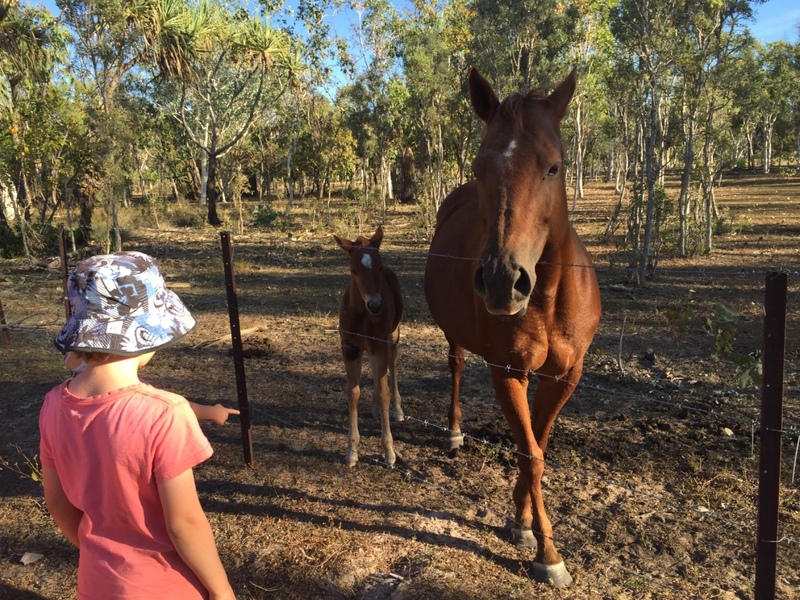 We didn’t have any veggies or fresh fruit to share with the horse – but they loved our apple cores. 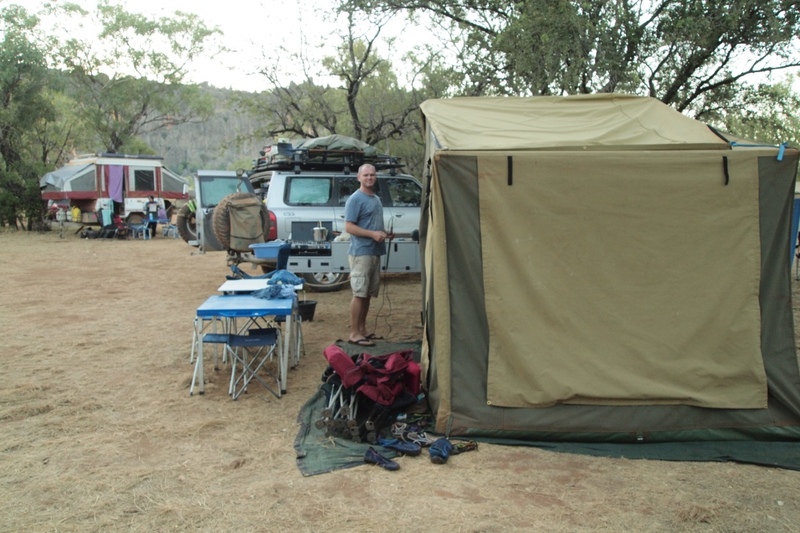 We only camped one night at Mt Elizabeth before heading off onto the Munja track. 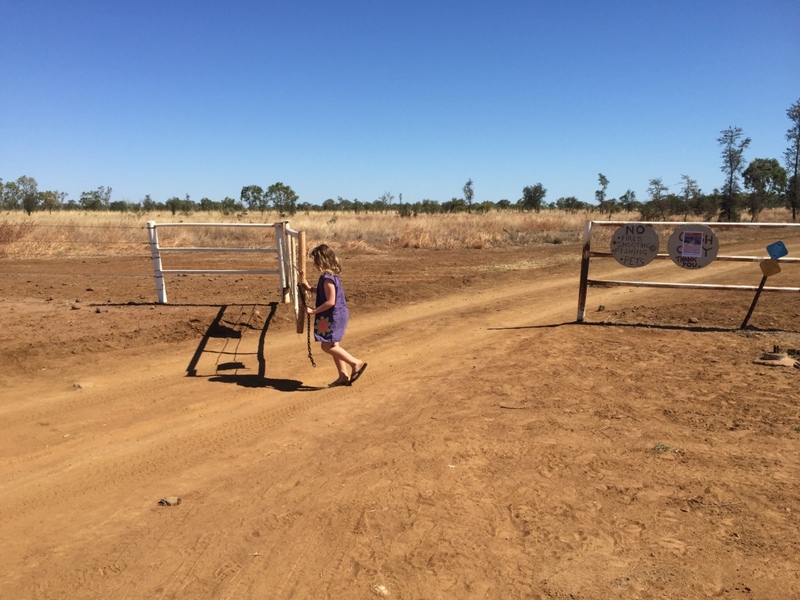 After paying our fee for access to the track we received the track notes and key to the gate and head off on an adventure down the remote Munja track. 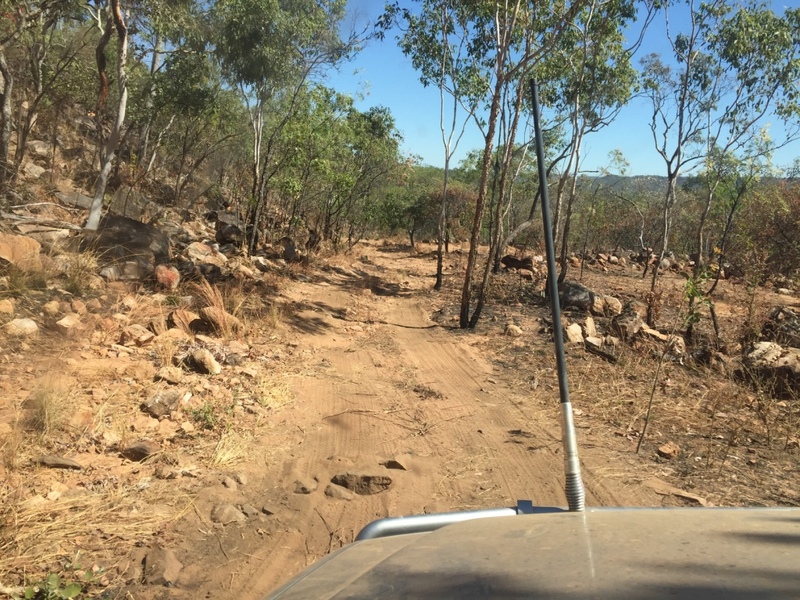 Being four wheel drive enthusiasts we were keen to get off the tourist trail and onto a real ‘off road’ track. 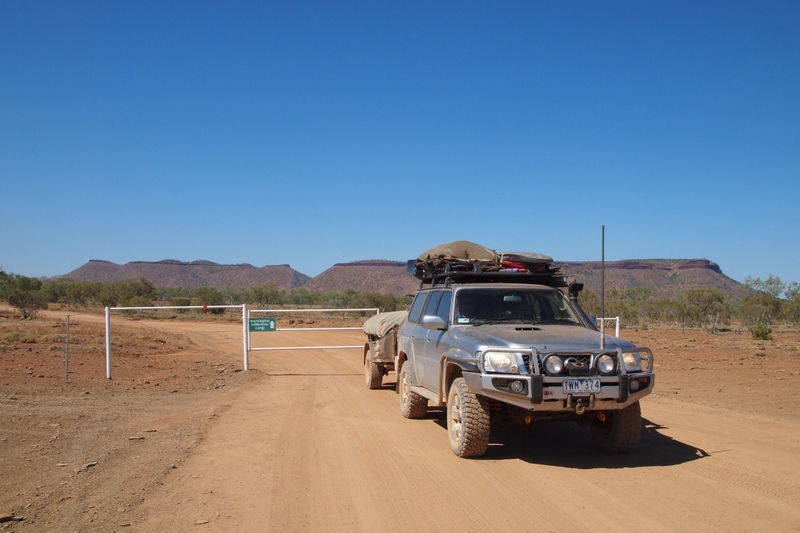 The Munja track is a 480km 4×4 track from Mt Elizabeth station following the Calder River over rocky hills and down to Walcott Inlet where the Calder, Charnley and Isdell rivers meet the ocean. We were told “there is nothing much down there unless you like to fish” but we wanted to visit for the view and the journey. 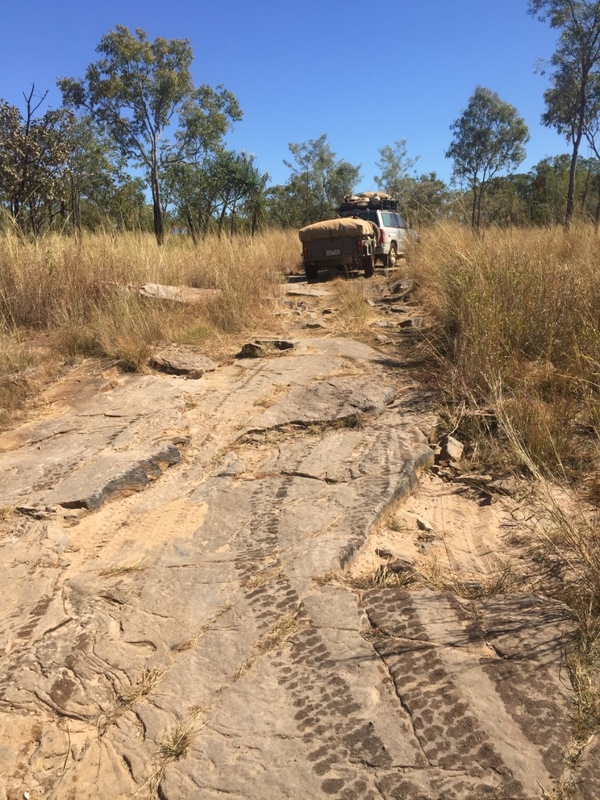 The track is recommended for high clearance 4×4 and off road campers only as parts are considered very difficult and rocky, there are multiple river and creek crossings and jump ups…according to the track notes…we weren’t quite sure what these entailed…but we would soon find out. 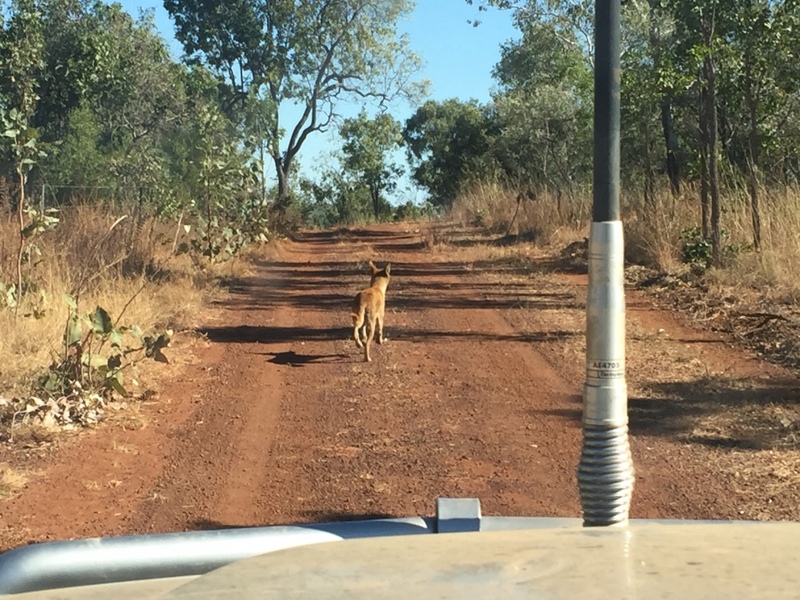 The first part of the track follows the station fenceline and not far along we met up with a dingo who ran along ahead of us for 5km we stopped to let him run off but he stayed on the track until finally jumping the fence. 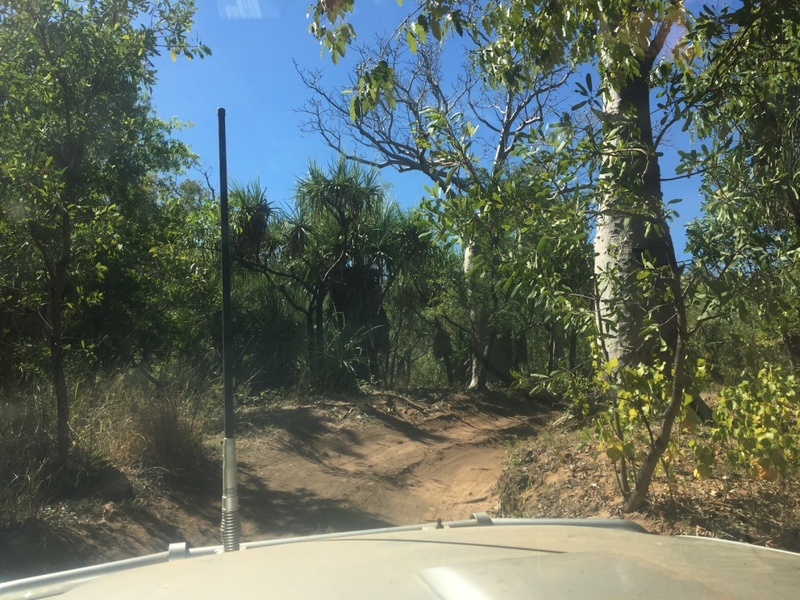 The Munja Track covers across the Ngarinyin Country and we are so grateful for the opportunity to visit and enjoy this country. 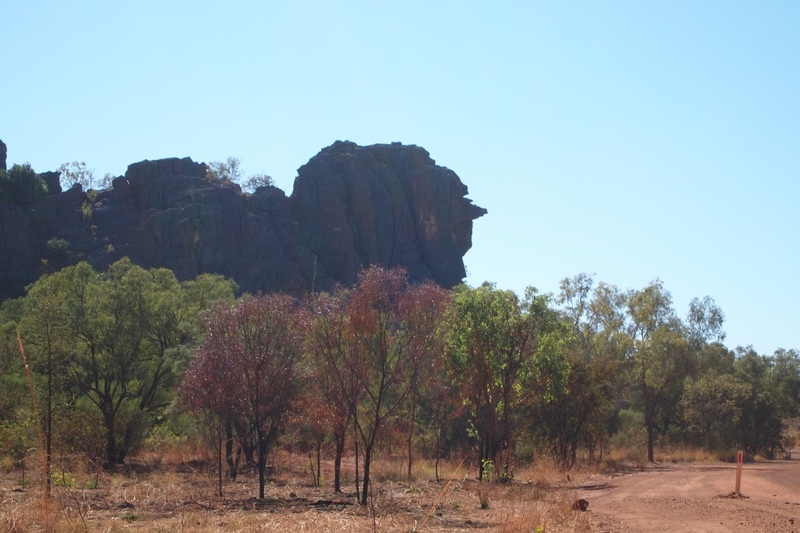 The track passed thru some beautiful countryside and there were lots of rocky out crops and interesting rock formations along the road. There were also lots of cattle grazing and lying around and some intimidating looking bulls with huge horns. 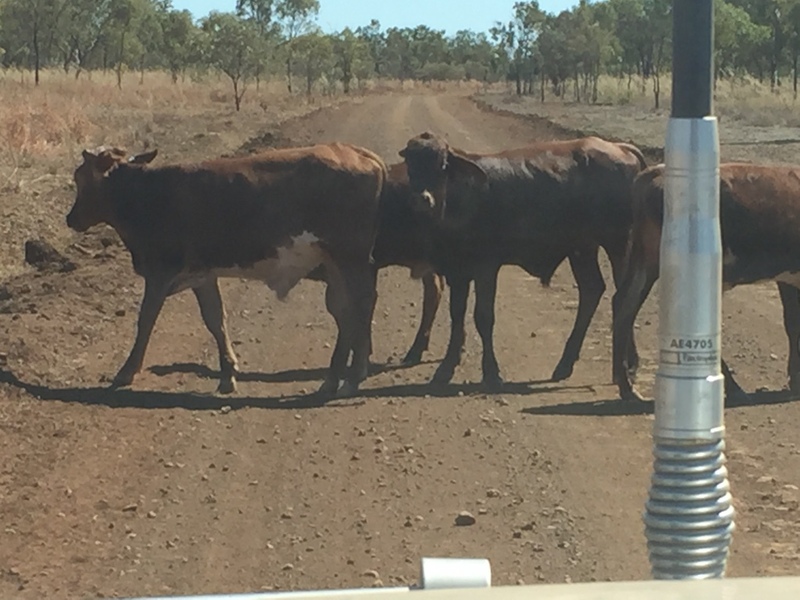 They would sometimes stand on the track giving us a stern look but they quickly ran away as the Patrol’s bull bar approached. 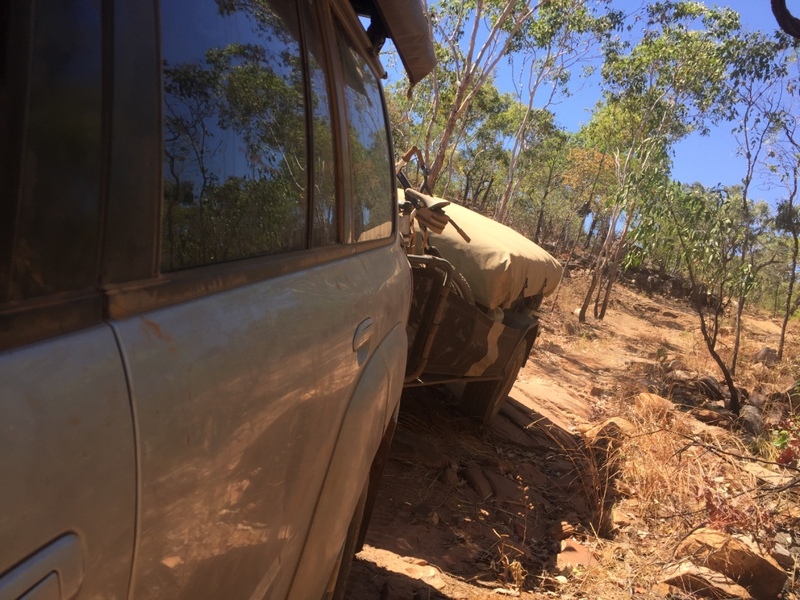 After a few creek crossings, a muddy tropical patch and got to the first jump up called ‘Magpie Jump-Up’…this was a steep rocky climb which curved around the hillside some patches looked daunting but the Patrol just crawled along in low range 1st and Tambo followed. (thankfully) We were averaging about 10km an hour, enjoying the scenery with some easier track between the rough rocky sections. 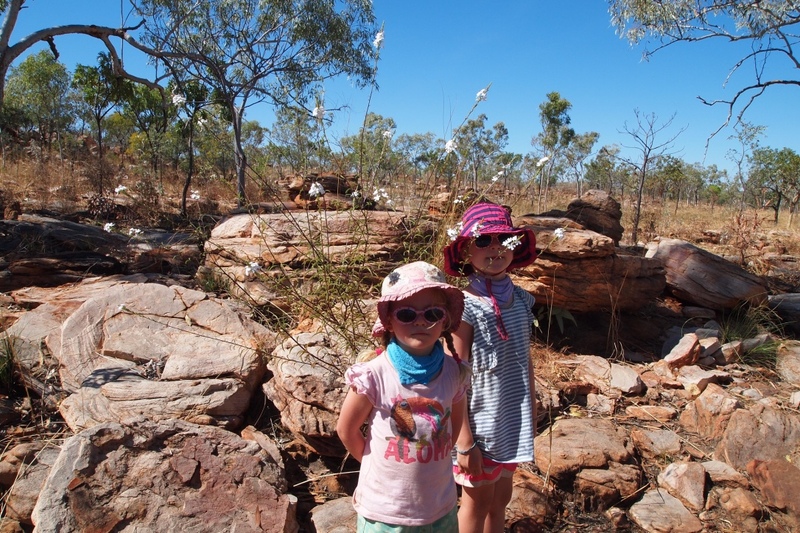 Along the bumpy track we stopped to look at some rocks and caves and found indigenous rock art. 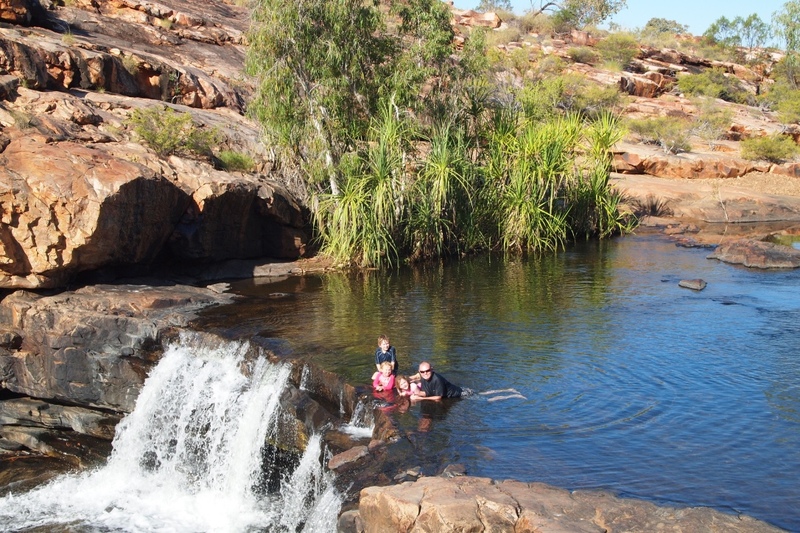 The Kimberley has so many beautiful locations with fresh water creeks and billabongs it is no wonder that it was home to many indigenous communities and the evidence of their ancestors and culture is recorded on so many rocks. 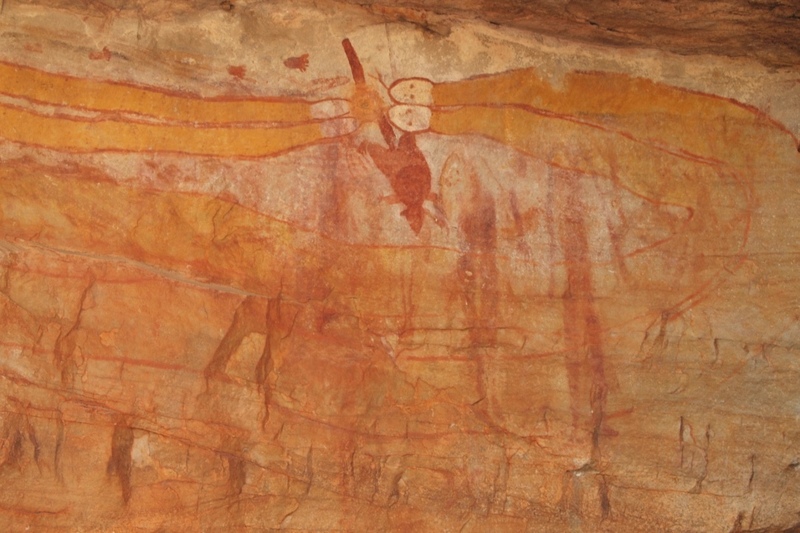 At our lunch spot we met a man who has helped open the track over the last few years and he directed us to some fabulous rock art. 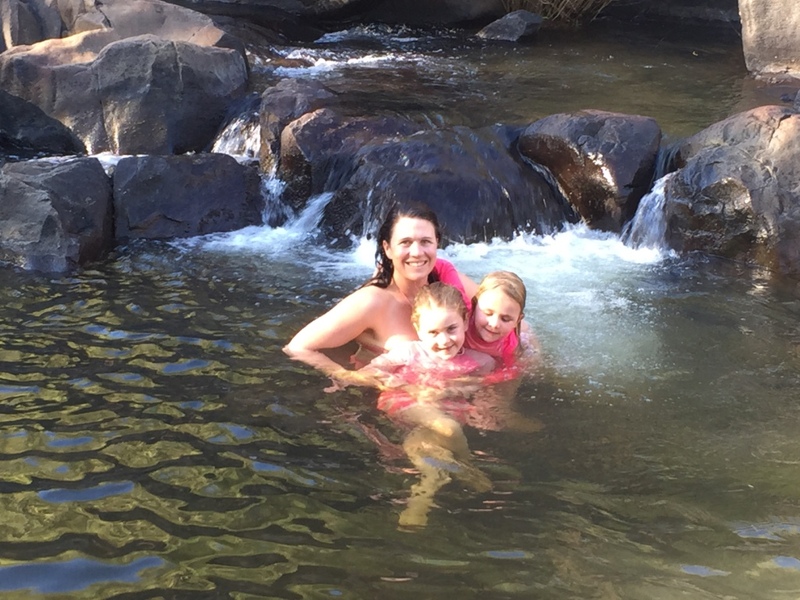 After quite a big day driving we decided to stop and camp at Pearson’s Creek just in time to have a swim in the last of the afternoon sunshine. 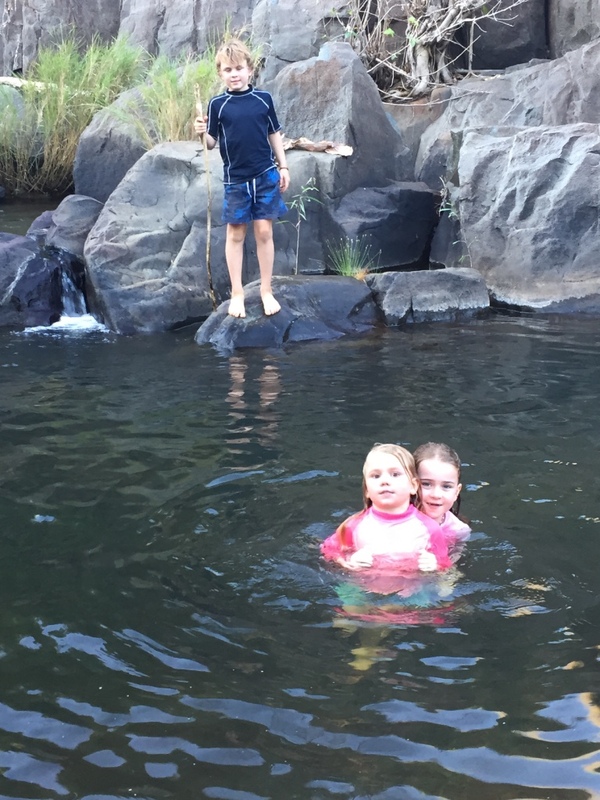 The creek was shallow but a pleasant enough dip after most of the day driving. 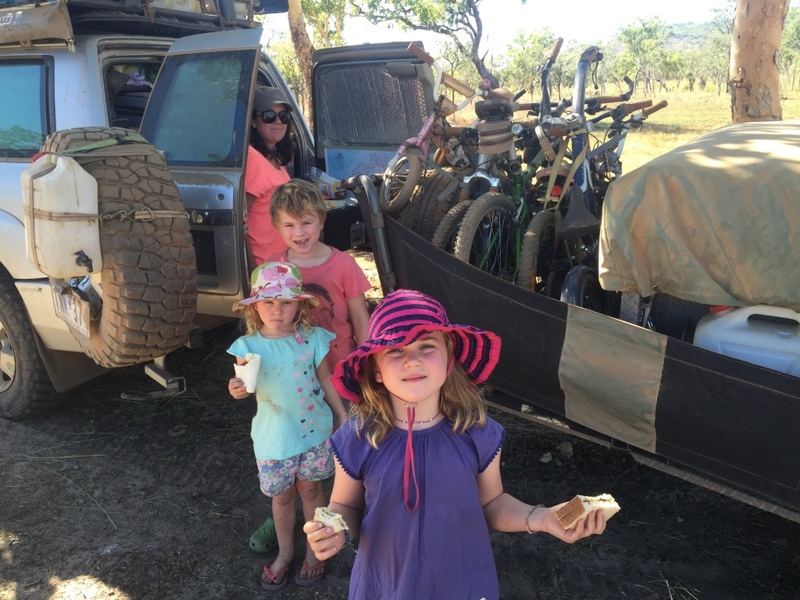 We set up camp whilst the kids collected wood for the fire. 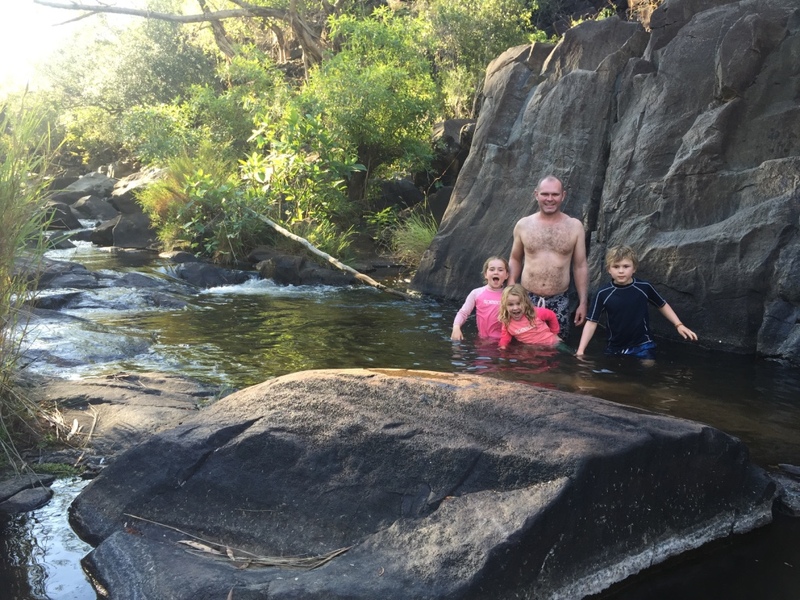 There was only us and one other couple camped along the creek – we felt a bit guilty about spoiling their serenity with our three kids! 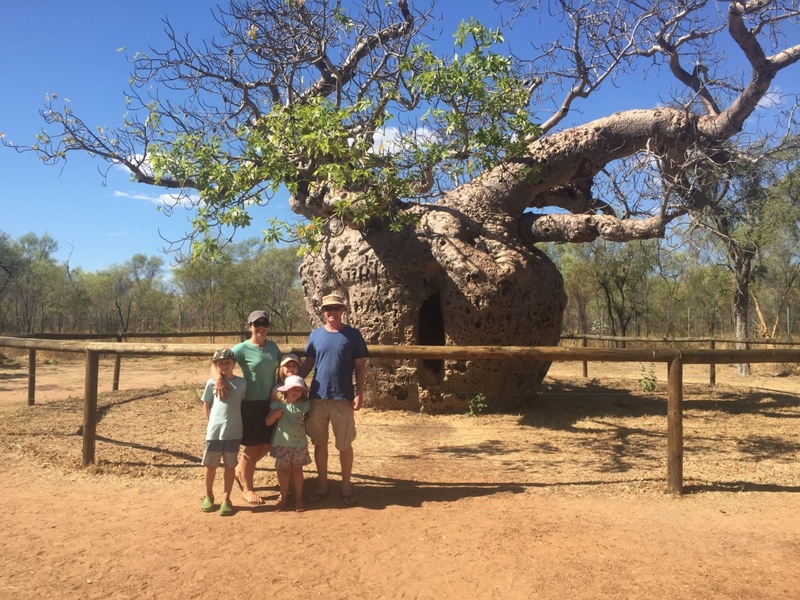 It was great being back in the bush without the crowds. We all enjoyed early dinner and marshmallows by the fire. 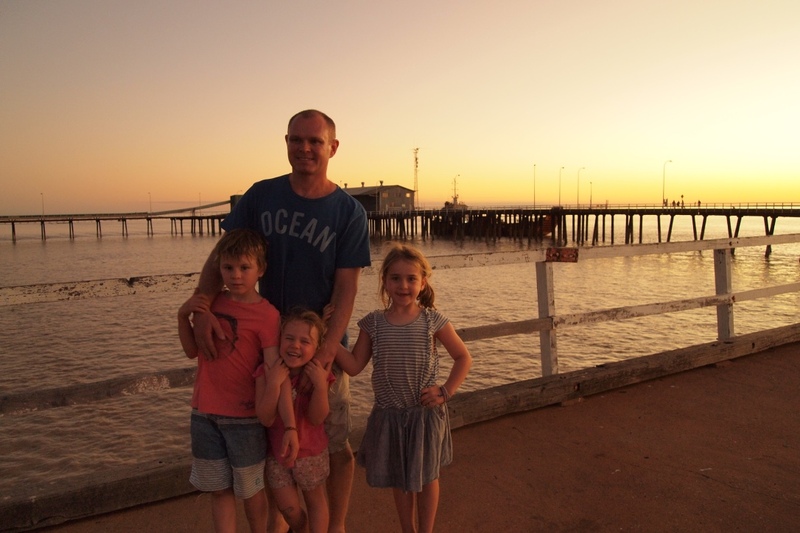 Our neighbours Peter and Linda came over for a drink and a chat after the kids went to bed. 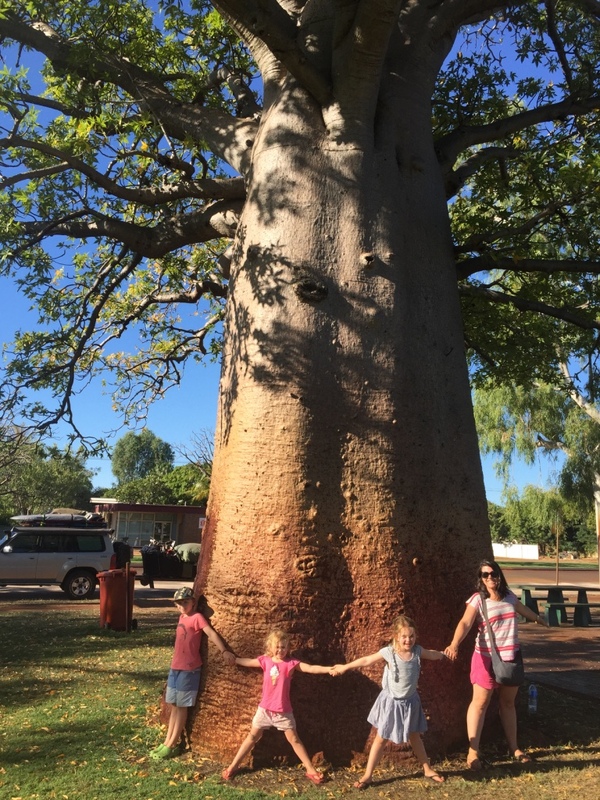 The 88km drive out of Mornington is fantastic…gorgeous mountain views and boab tress – however with the long driveways and side trips to gorges we had used much more fuel than we initially expected luckily our next stop Mt Barnett sold food and fuel. 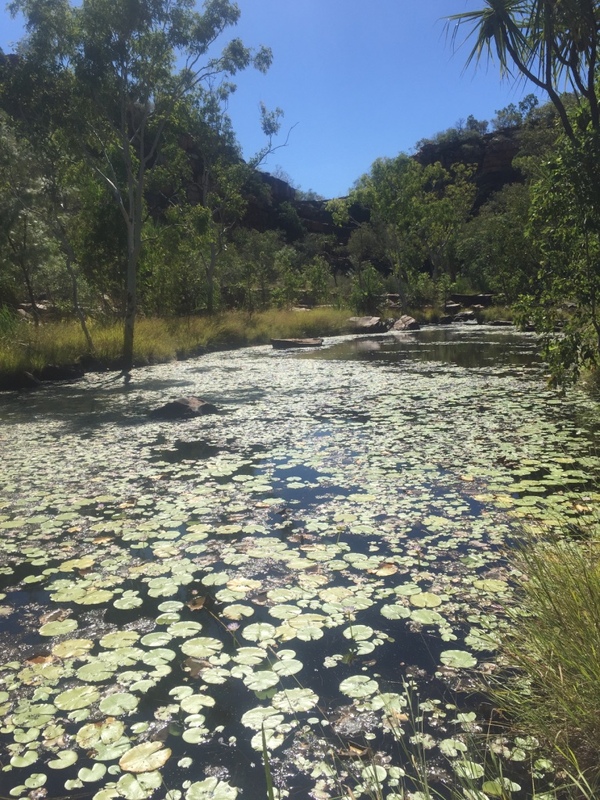 On the way to Mt Barnett we drove into Adocks Gorge for a lunch stop and found a beautiful lilly covered billabong and a short walk to a pretty gorge. 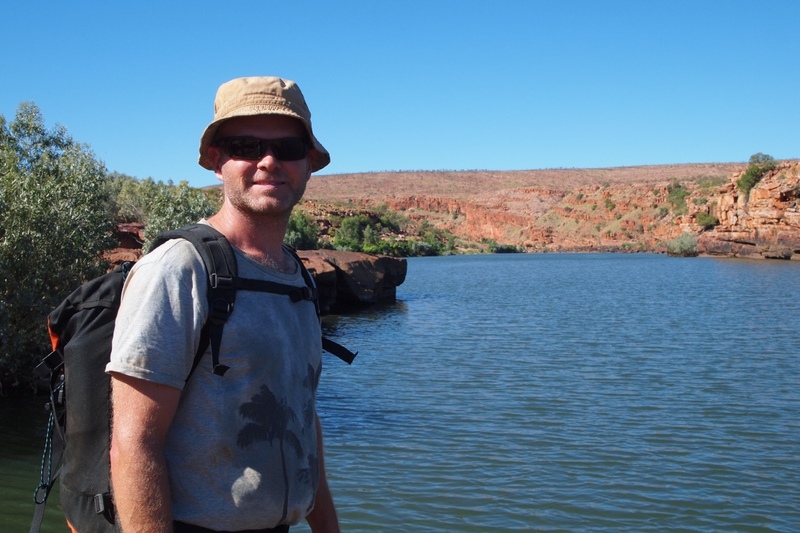 We decided not to swim as Aaron spotted a small croc (we think just a freshie) and we were keen to get to Mt Barnett. 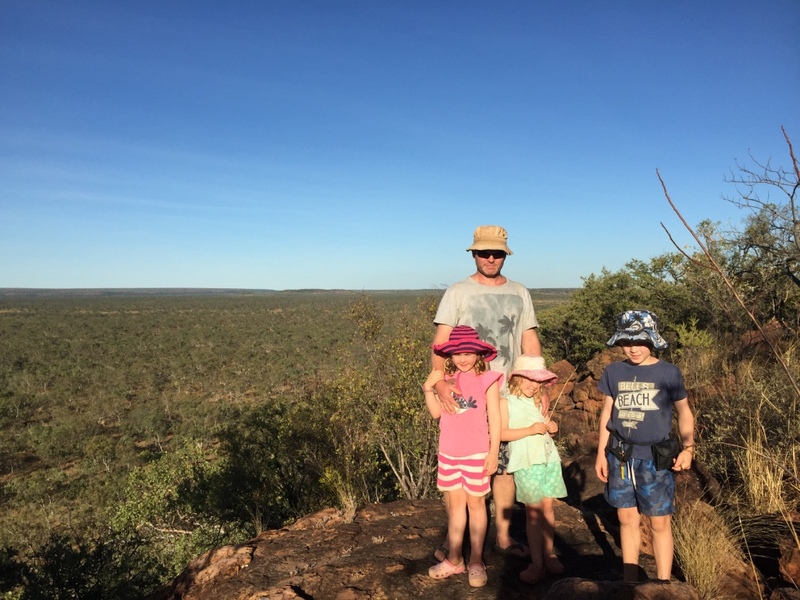 When we arrived at Mt Barnett Andrew filled the car with fuel at the cheaper $2.09 per litre whilst the kids and I restocked some essential food items. We had heard that a couple of weeks earlier the station had run out of fuel and the camp ground was overflowing with travellers needing to refuel and waiting for the tanker. 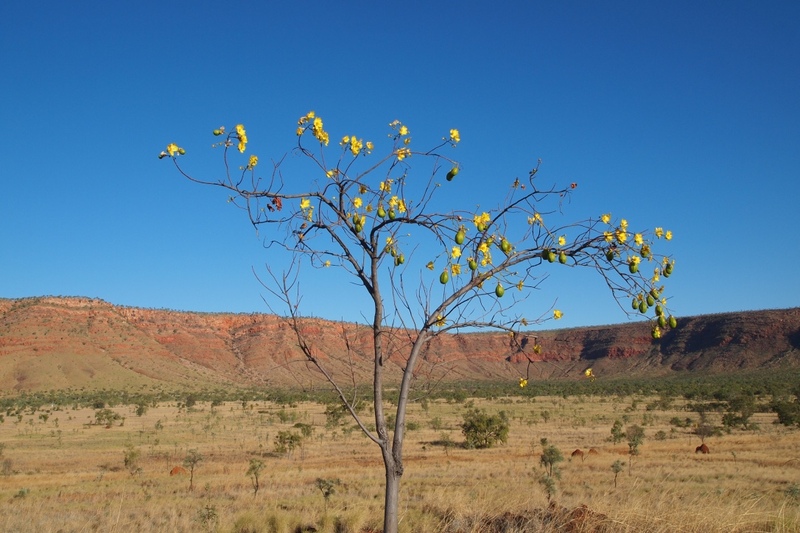 The Mt Barnett station Roadhouse is owned by the Kupungarri Indigenous Community. 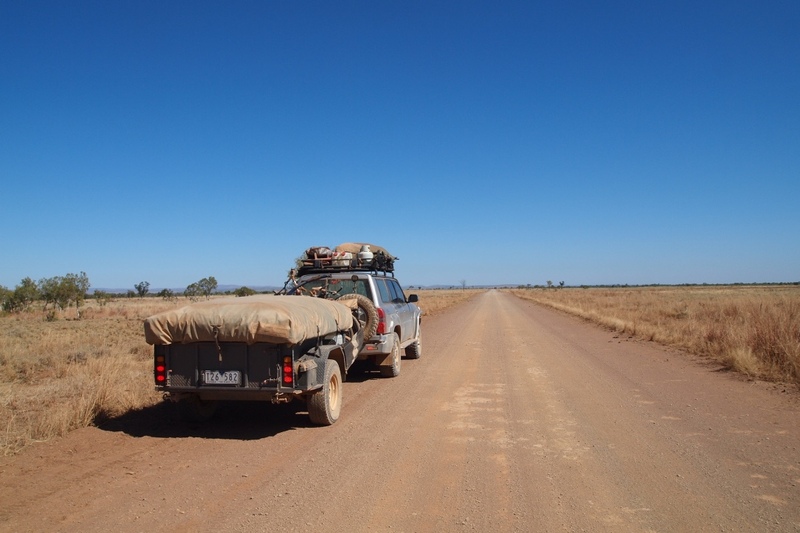 (the traditional owners of the station land) and the shop is a huge benefit to all passing travellers. It’s a good general store with basic staples and quite a range of fresh produce – we were able to buy watermelon!. The store was constantly busy whilst we were there and they quickly sold out of fresh items despite it all being very pricey which is expected given the remote location. 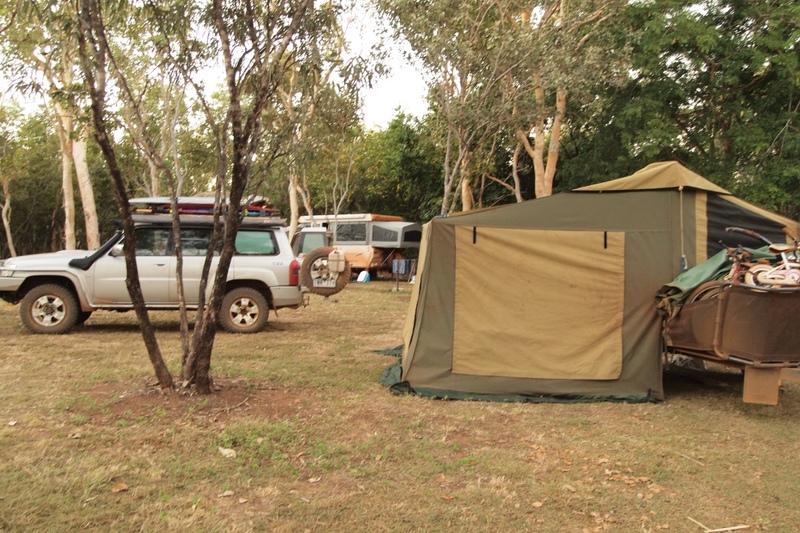 Mt Barnett camp ground is 7km from the road house is nestled on the banks of the Manning River. A really beautiful spot regrettably in order to provide toilets and showers for the masses of tourists they run a generator in the camp from 630am to 9pm which can be heard across most the camping area. We found a spot as far away from the droning generator as possible. Bianca doing the barrel washing! 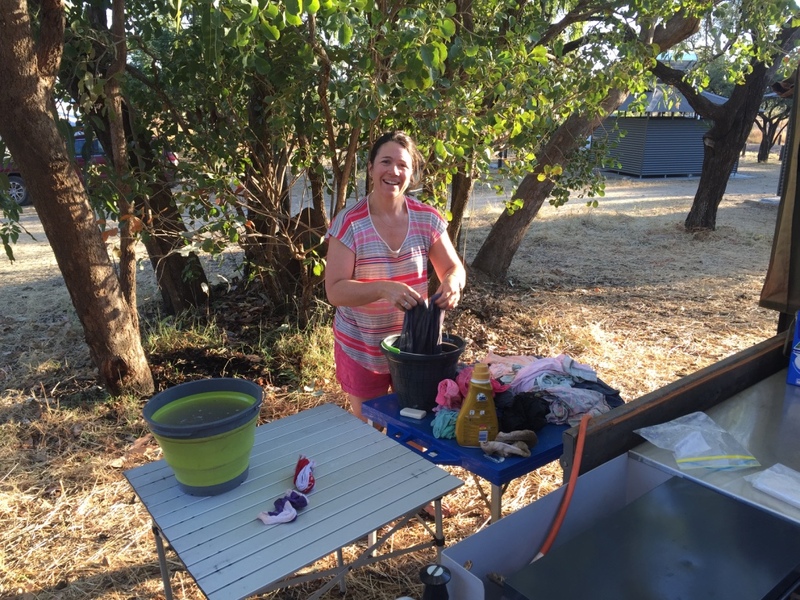 We saw our friends again and I borrowed Emma’s’ camping washing machine – aka barrel with a lid– Bianca, Aaron and Holly were all able to help with the washing! 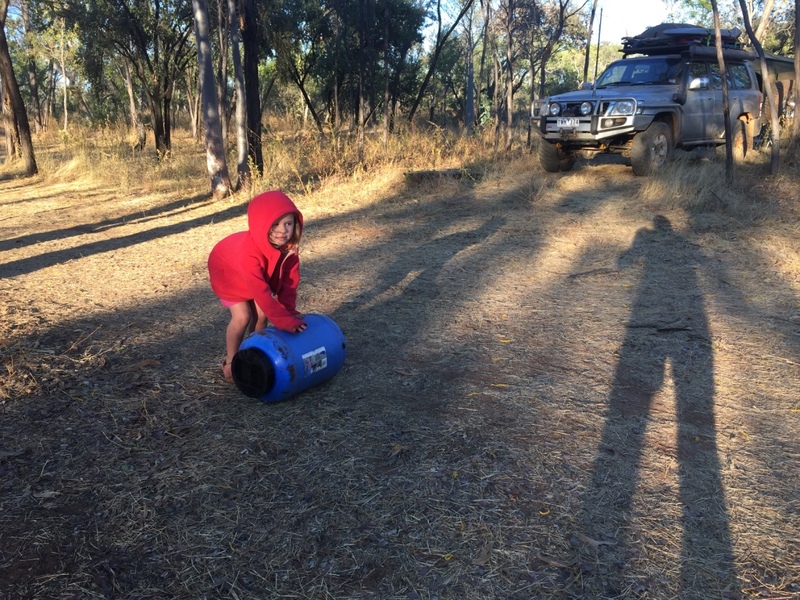 A great idea for long camping trips off road where there aren’t any washing machines. 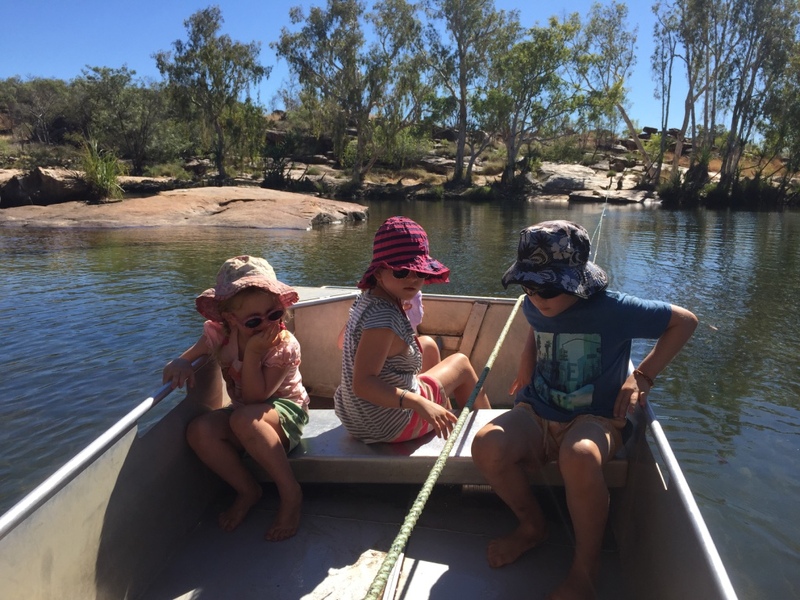 The walk starts with a boat on a rope pulley crossing over Manning River, which the children thought was fabulous and then it was a 2.8km walk across the hills and down into the gorge. 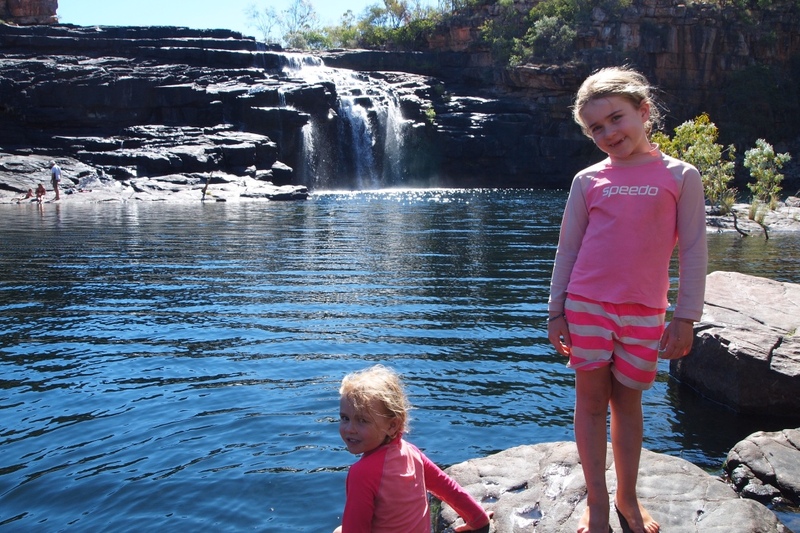 It was really hot poor Holly had a blood nose on the way, Bianca fell over and we were all feeling pretty hot by the time we arrived at the gorge but it was well worth the effort another stunning gorge. 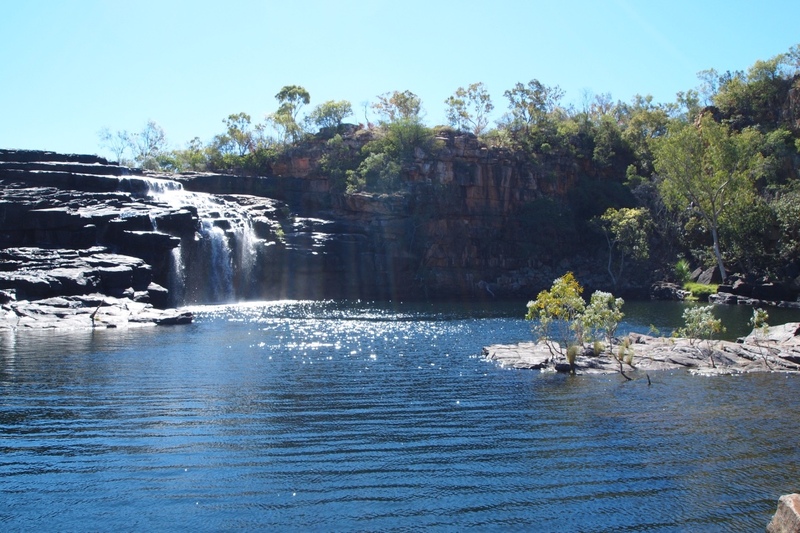 Manning Gorge has a huge 55m waterfall with a large deep pool it was fairly busy but the pool was huge. Aaron again enjoyed jumping from some big rocks. 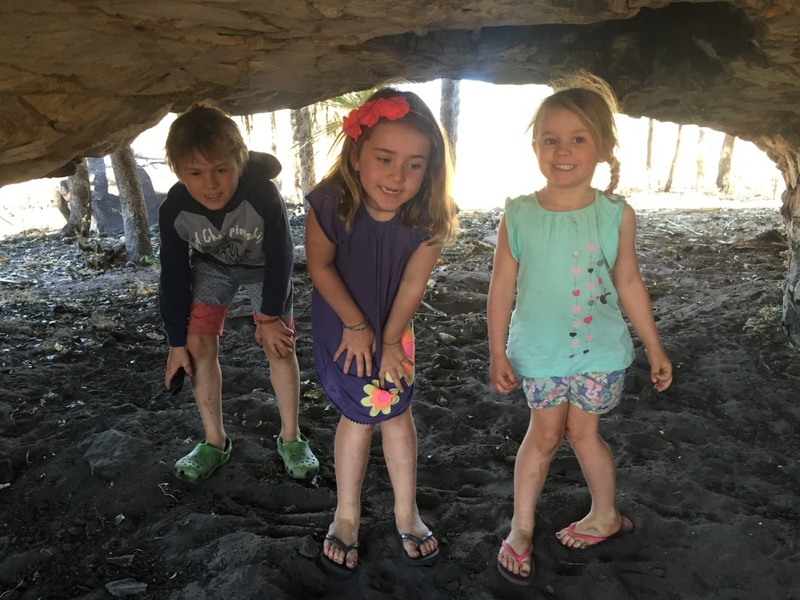 We all had a great time swimming and exploring. 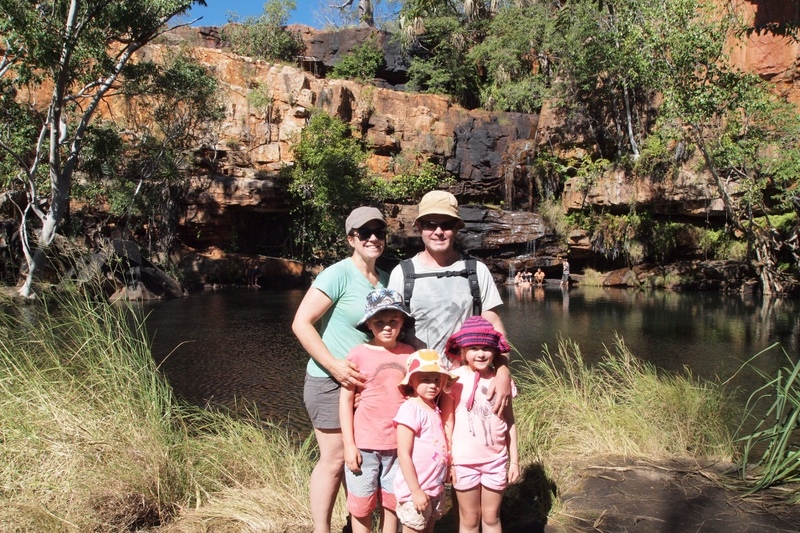 Whilst at the Gorge we met a family from Melbourne, with three sons, living in Broome but on holiday. 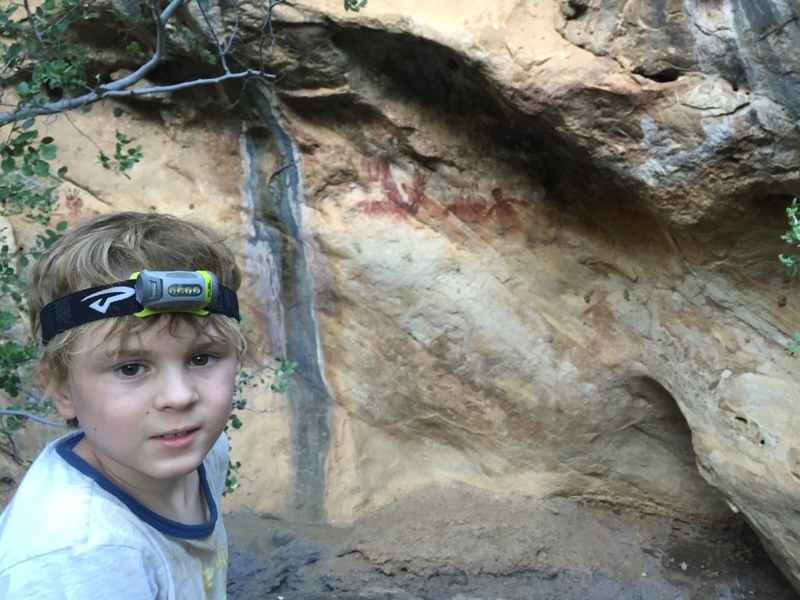 Aaron had a great time exploring the rocks looking for lizards and swimming with their older boys and later that night they came over for marshmallows’ by our little fire. 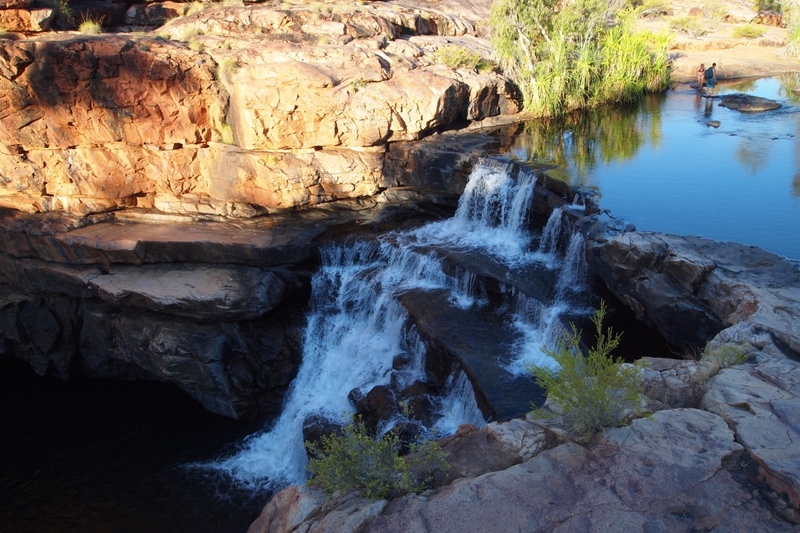 Another day and another beautiful gorge – the Kimberley is full of treasures. 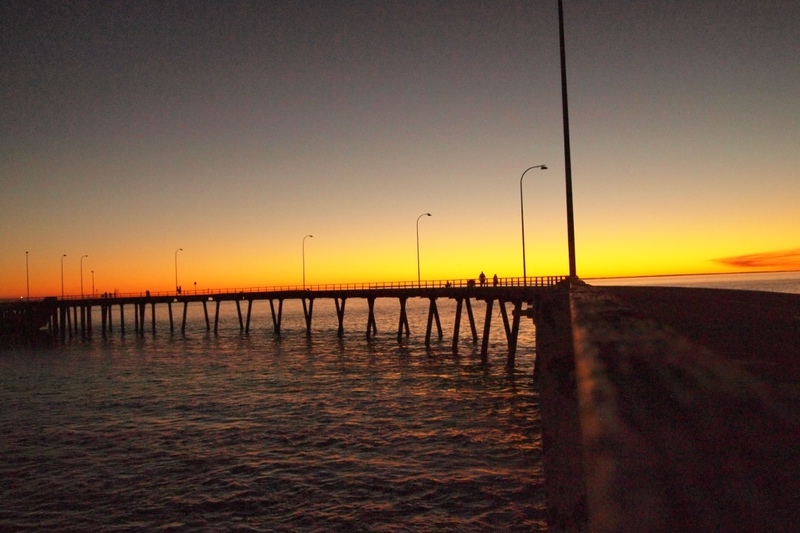 We are so very lucky to be in this amazing part of Australia – together! The next day after we packed and set off we decided to drive back to Galvins Gorge 14km west on the Gibb. 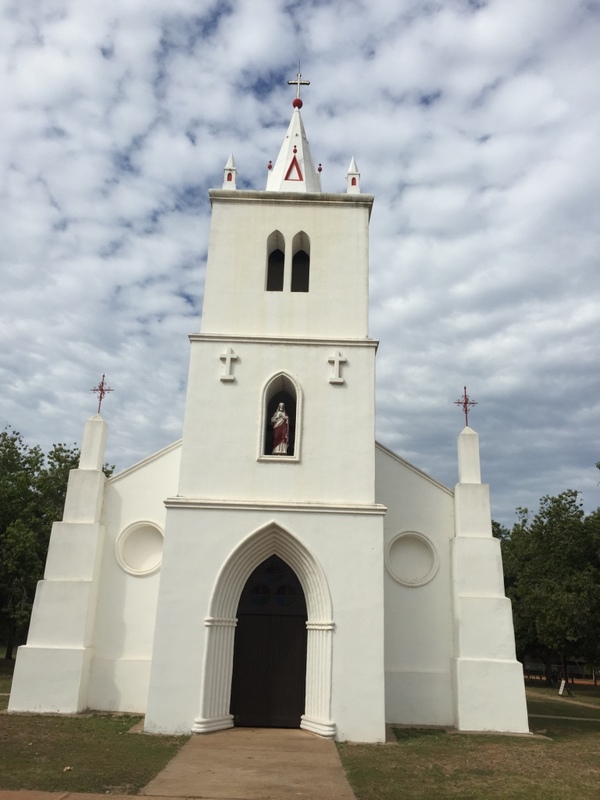 We had driven past on our way to Mt Barnett but we were advised it was worth a quick visit. 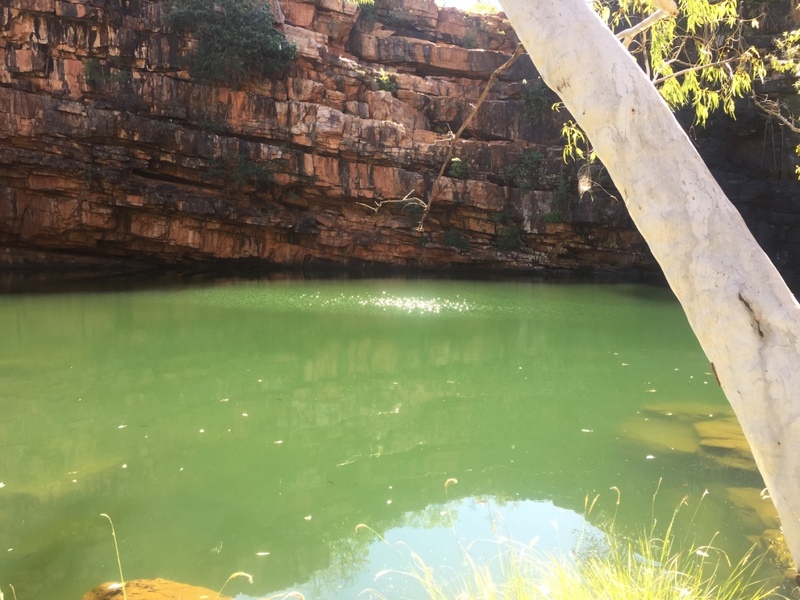 This gorge is a short walk off the Gibb RR and on the way in Aaron Holly and Bianca we excited to see a beautiful water monitor lazing in the sunshine. 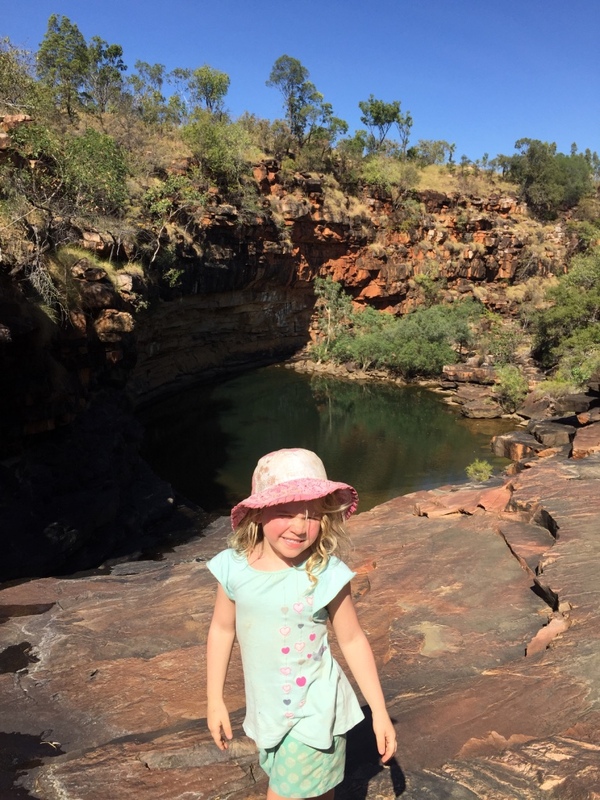 The gorge was yet another beautiful spot with a small trickle of a waterfall and on the right we found a black footed rock wallaby jumping around and there was a beautiful Wandjina painting. 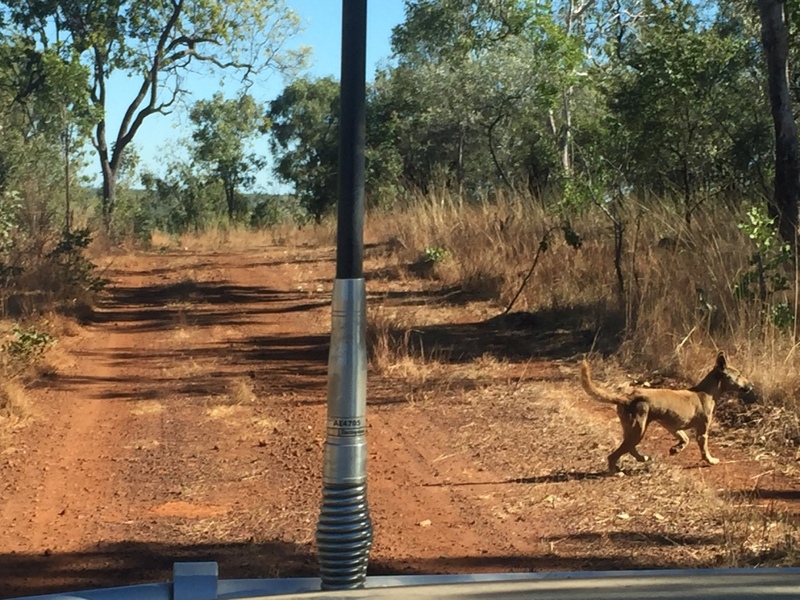 After a quick swim we headed back to the Patrol and onto the next stop. 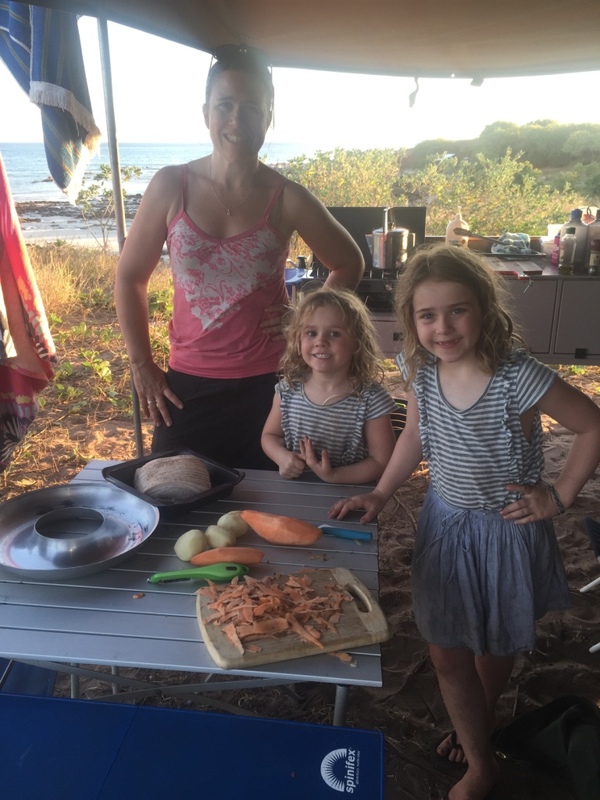 We set a camper trailer record getting up dressed, breakfast, packed and on the road by 7am!! 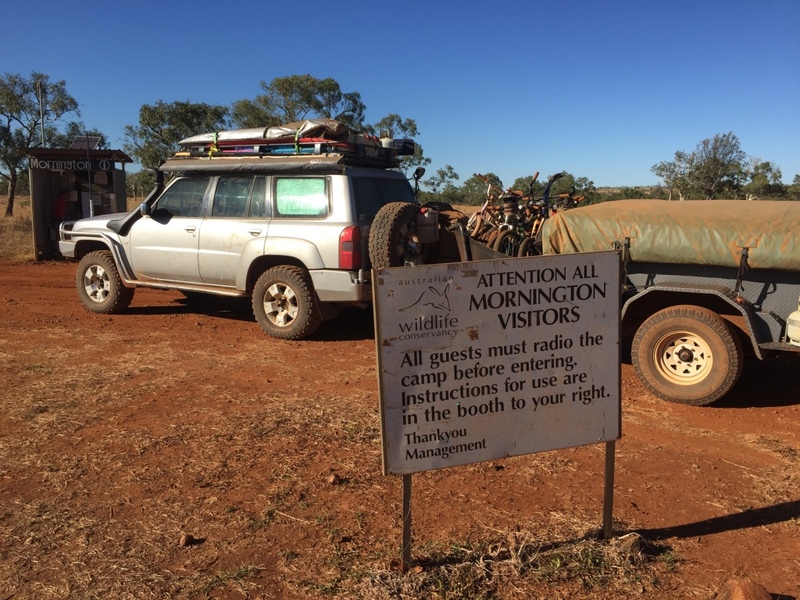 And arrived at the Mornington Wilderness Camp gate, 50km from Charnley, by 745am and we got the okay to travel the 88km into the camp. 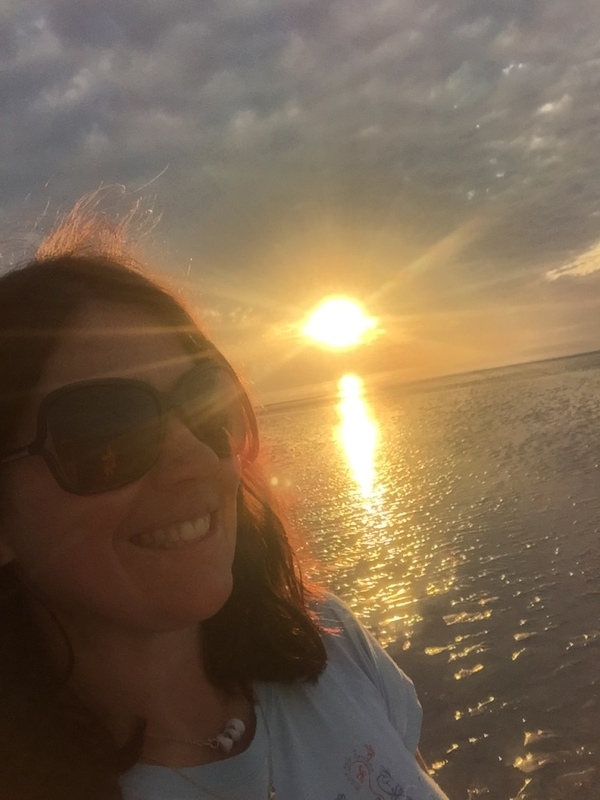 (Thanks to Emma) Mornington is part of the Australian Wildlife Conservancy which is a non for profit organisation working to try and save wildlife habitats and help Australia’s endangered species. 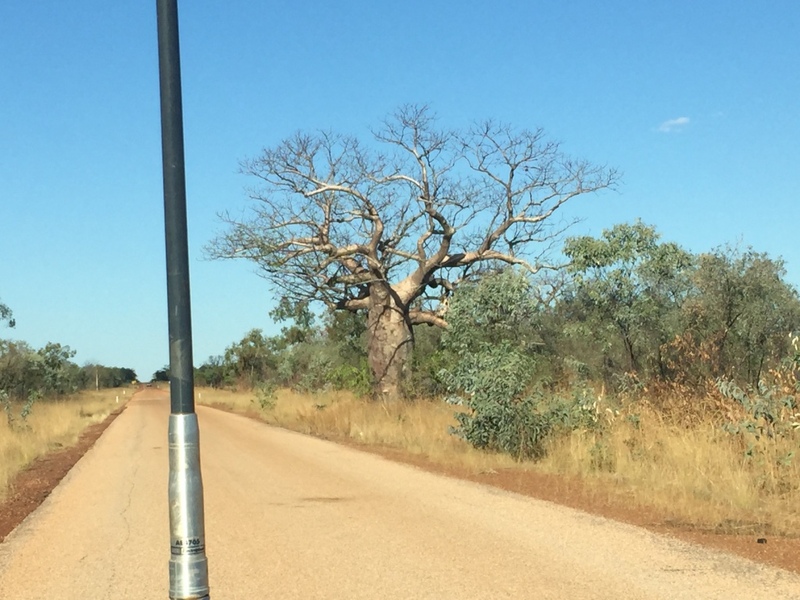 The drive into Mornington is beautiful with views of the lower Leopold Ranges stretched across the horizon and lots of beautiful boab trees. I have fallen in love with these trees and can’t stop photographing them! 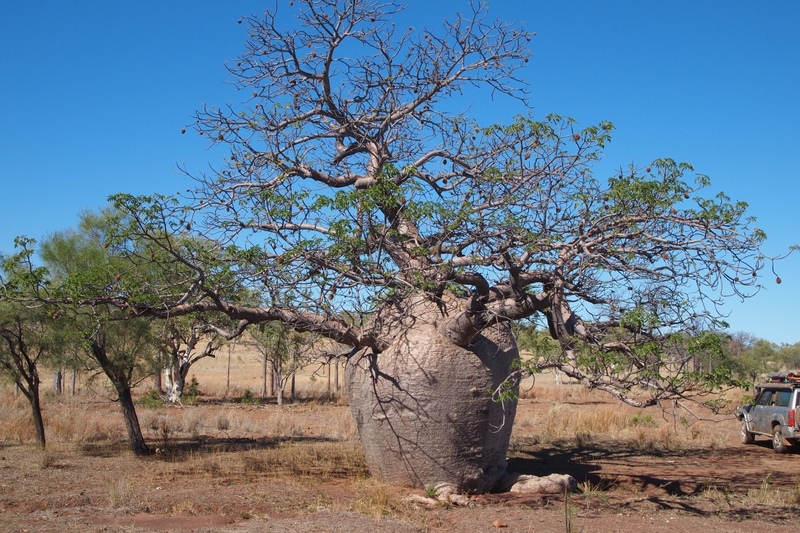 The boabs are a special tree only found in the Kimberley region of Australia and they are really cool. 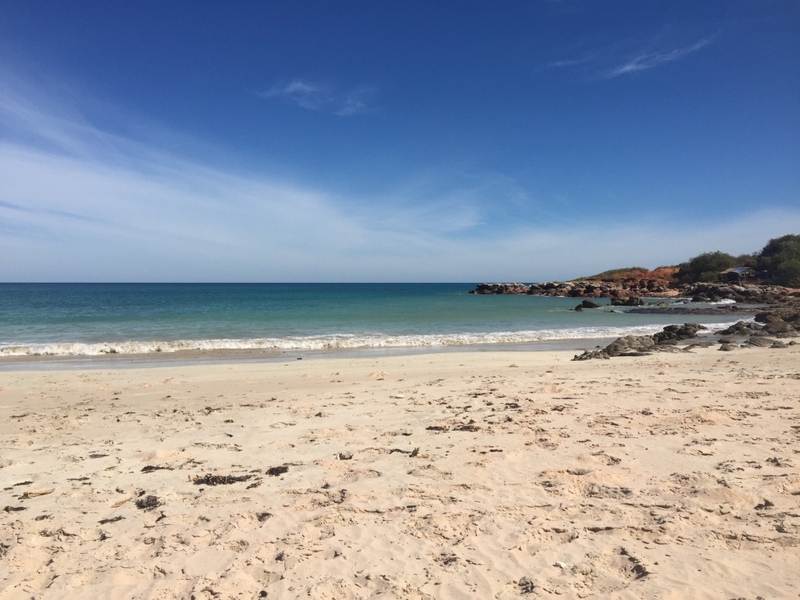 Mornington is like a resort they have great facilities…including a restaurant /café, bar facility with cold drinks and real coffee! 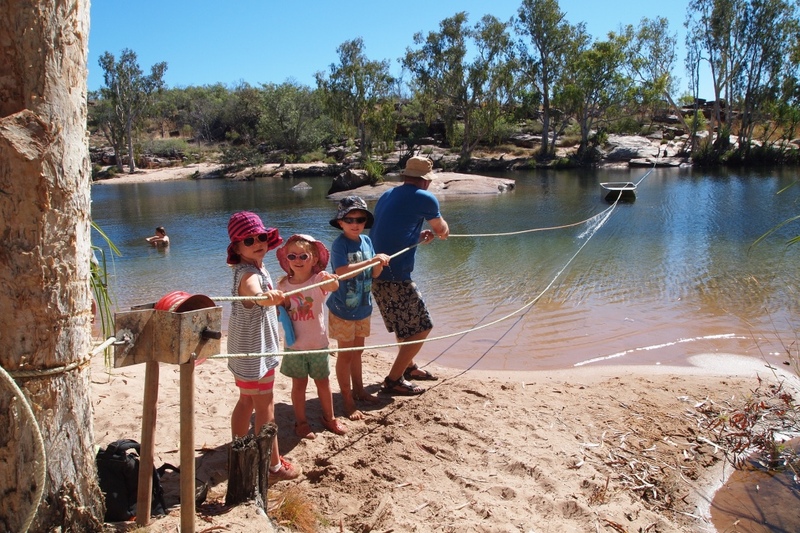 After camp set up and a quick lunch we all headed off to the Sir John Gorge for to explore and swim. 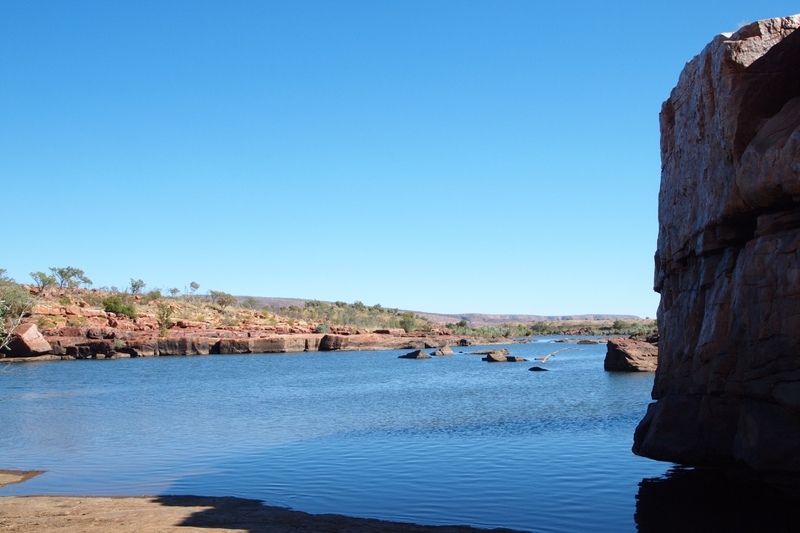 The Gorge is a vast wide open rocky expanse within the Hann River. 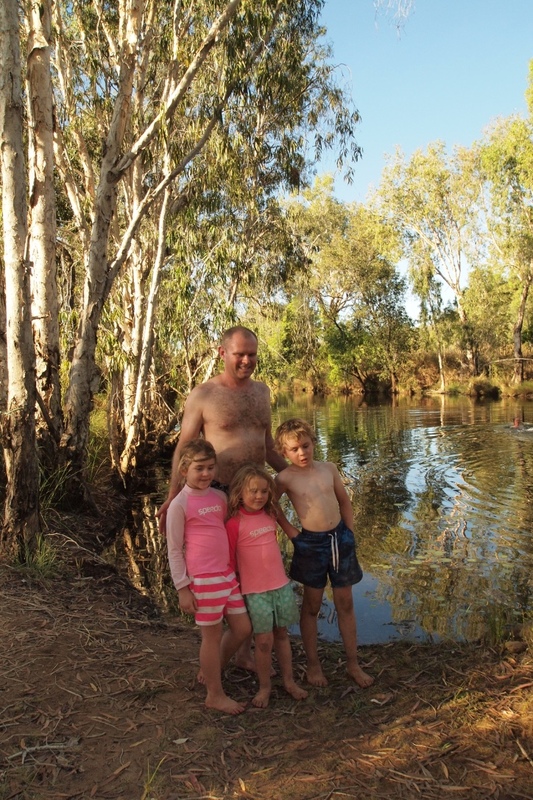 We climbed around and went for a swim but it was a bit slimey entry and exit so we went around to the ‘Blue Bushes’ swimming hole also on the Hann River the kids all enjoyed jumping in and splashing about. 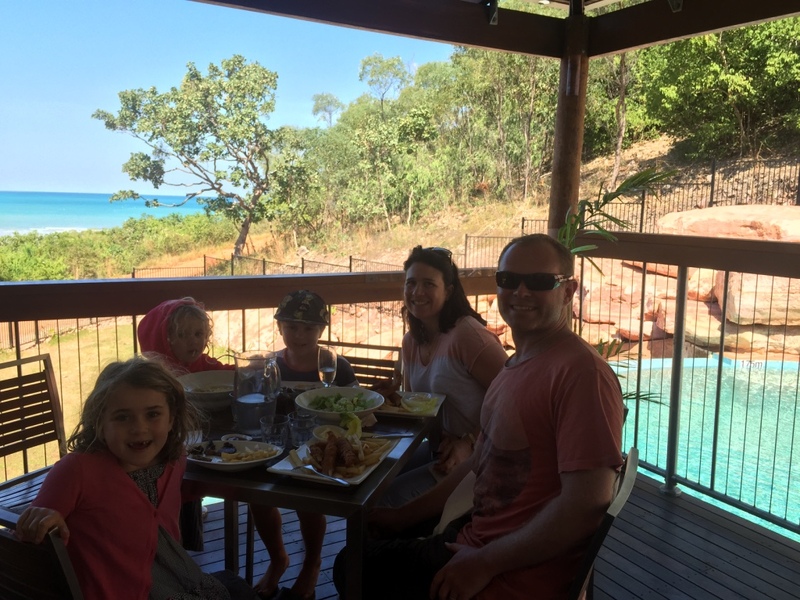 That night we all enjoyed a fabulous meal at the restaurant the children and parents on separate tables. Another great day and night with the Young Family! 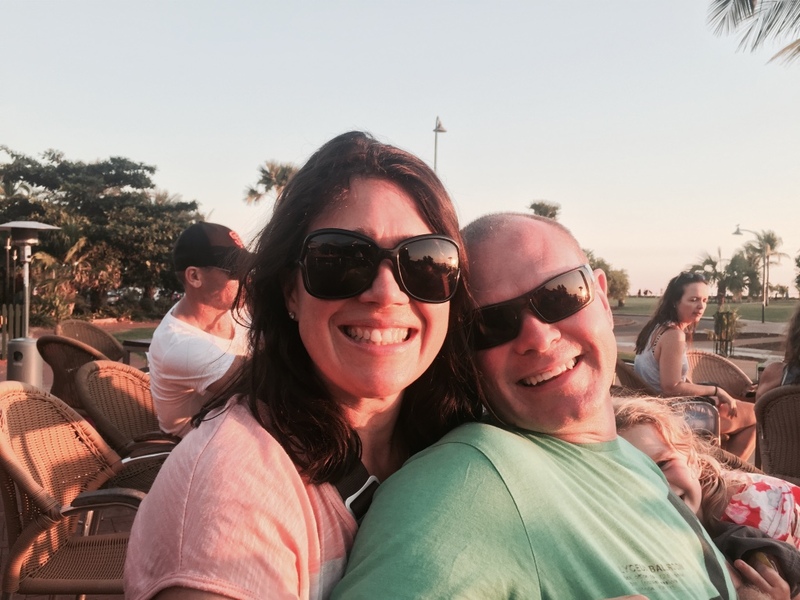 So often travelling is not only where you go and what you see but the people you meet that make it a great experience. 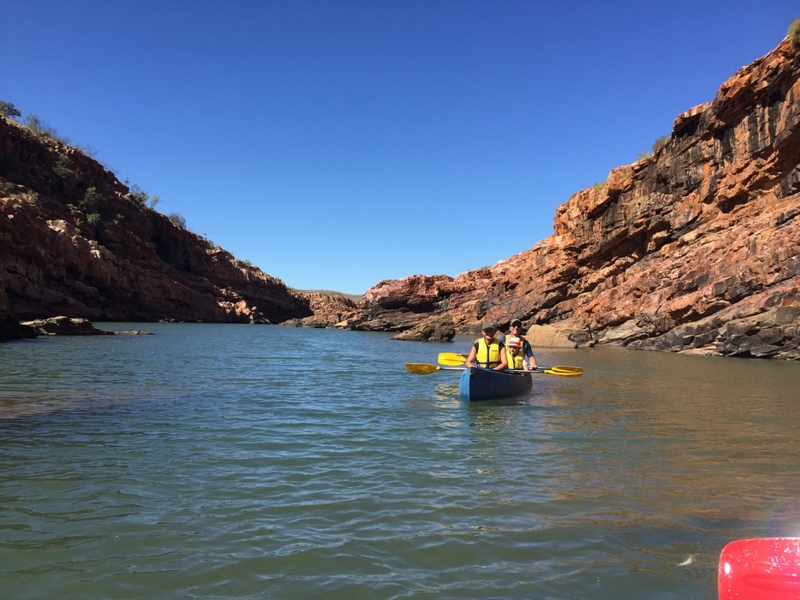 Our second day at Mornington we picked up the paddles and life jackets and headed for Dimond Gorge. 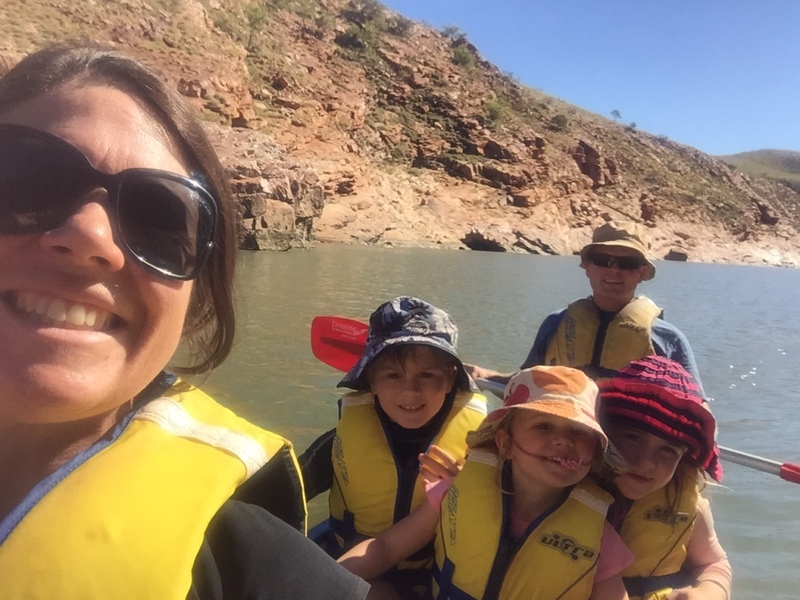 Each family hired a three man canoes a bit of a squeeze but the children shared the larger centre seat with Andrew and I paddling. 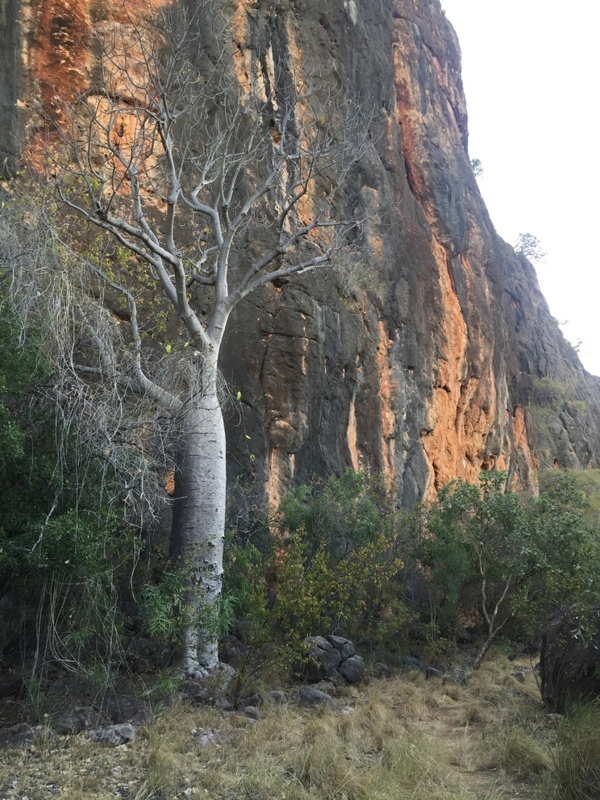 It was magnificent to be right in the large gorge with rock walls towering overhead and views up the gorge (part of the Fitzroy River) framed with the rock walls. 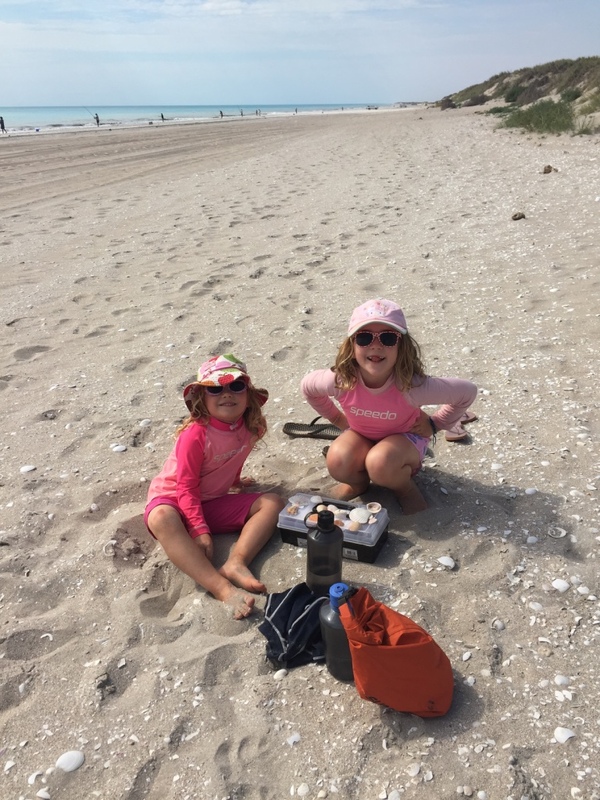 We had a picnic lunch on a ‘beach’ that had more mud than sand but the kids had a ball. 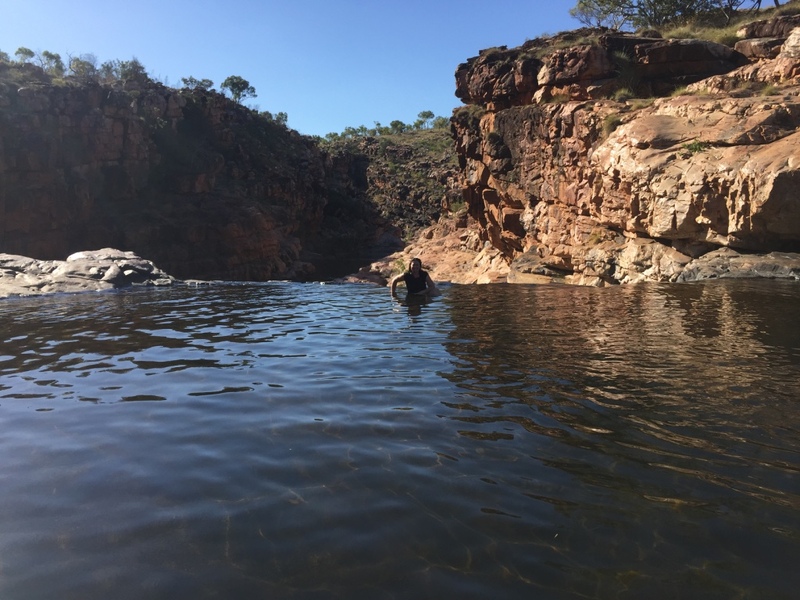 We went to another less muddy landing for another swim before paddling back to the end of the gorge and walking back to our cars. 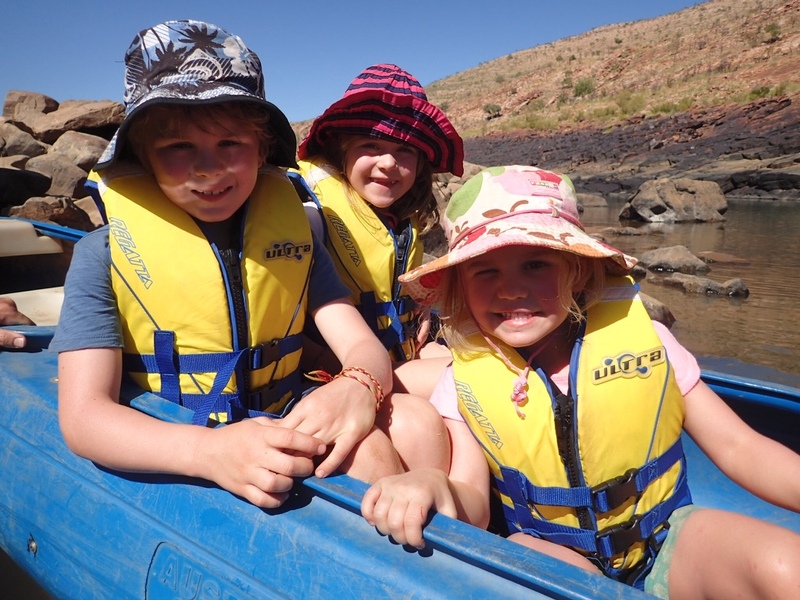 We all had a great day and managed to avoid the canoe tipping over. That night after dinner we went to an AWC presentation about their activities and the impact they are having on protecting endangered species in the area. 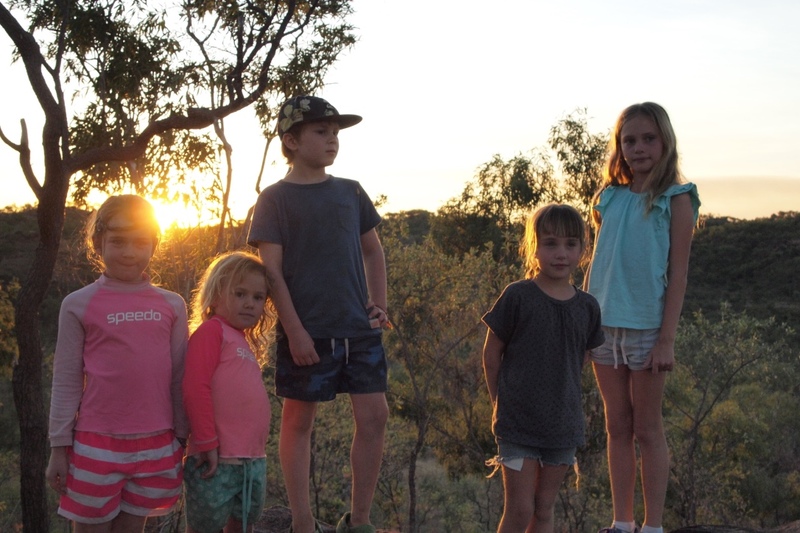 The sun sets at 515pm and walking with head torches on we spotted a snake…luckily we were all wearing our thongs! 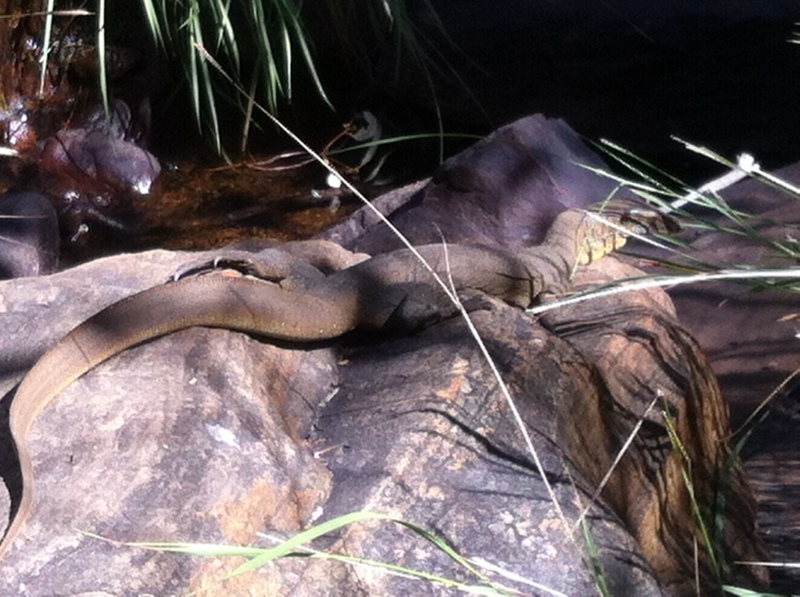 He slithered away without a care for us we think it was a young Olive Green Python. At the presentation we learned the biggest threat to the endangered birds and mammals was loss of habitat from ‘ferral herbivores’ being cattle and horses. 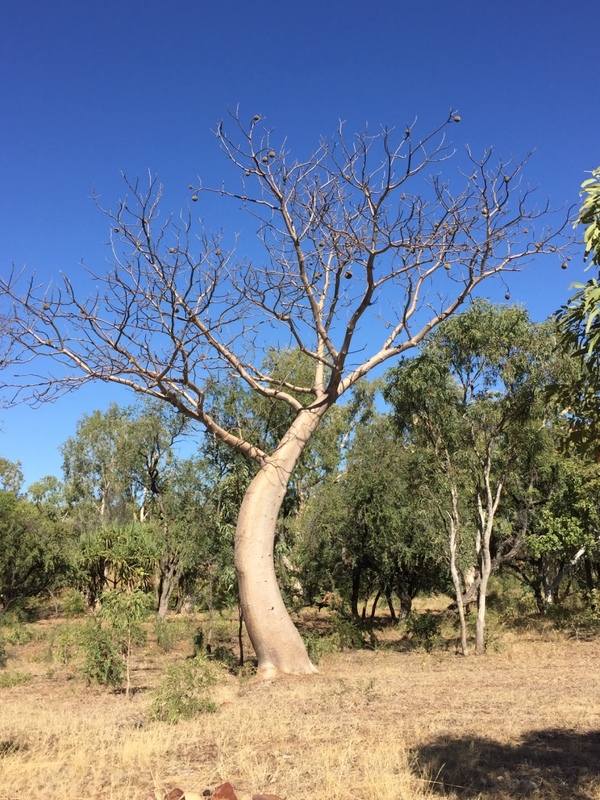 It makes sense the birds feed on grass seeds and with the previously heavily stocked land across the Kimberley for the last 100 years this is impacting our birds and small mammals. 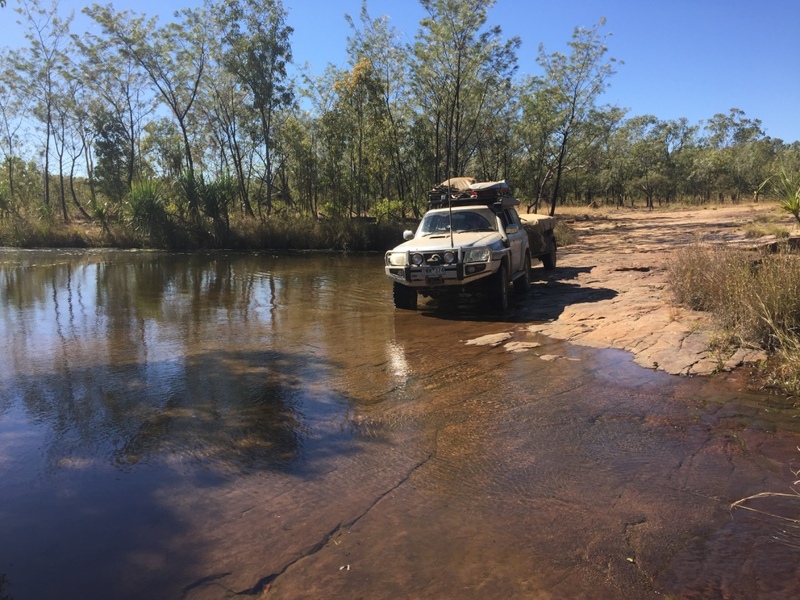 In addition AWC are worried about the coming invasion of the Cane Toad, predicted to be on the way to the Kimberley as early as 2017. 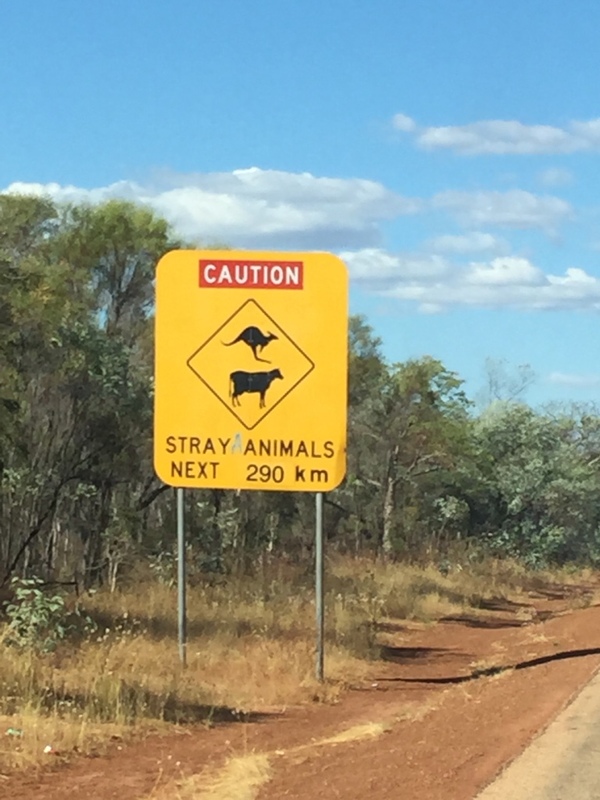 It was a bit frightening to think that so many animals are under threat. 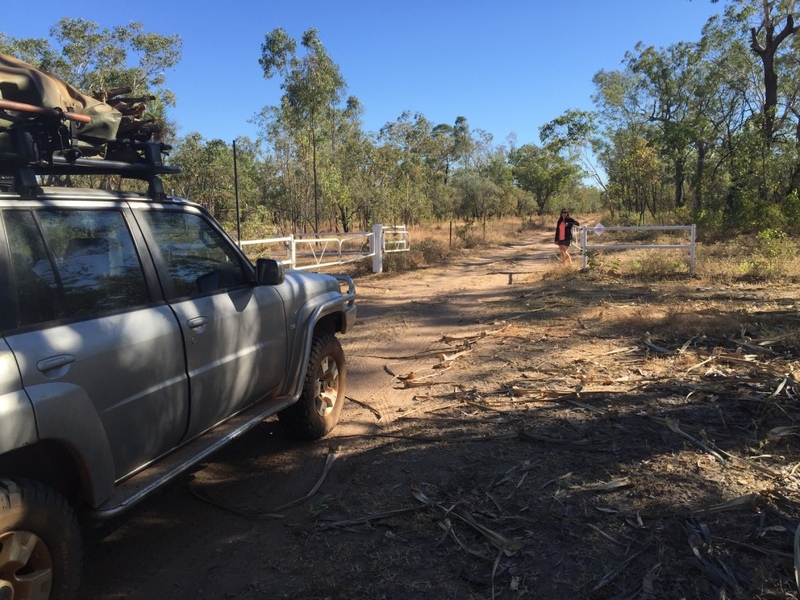 We also learned about Eco Burn research that the AWC staff were conducting over the vast areas of conservation land under their management whereby program burning reduces the intensity and impact of a wild fire in the area. Very interesting but this meant that across their land there was quite a lot of land with recent fire scar. 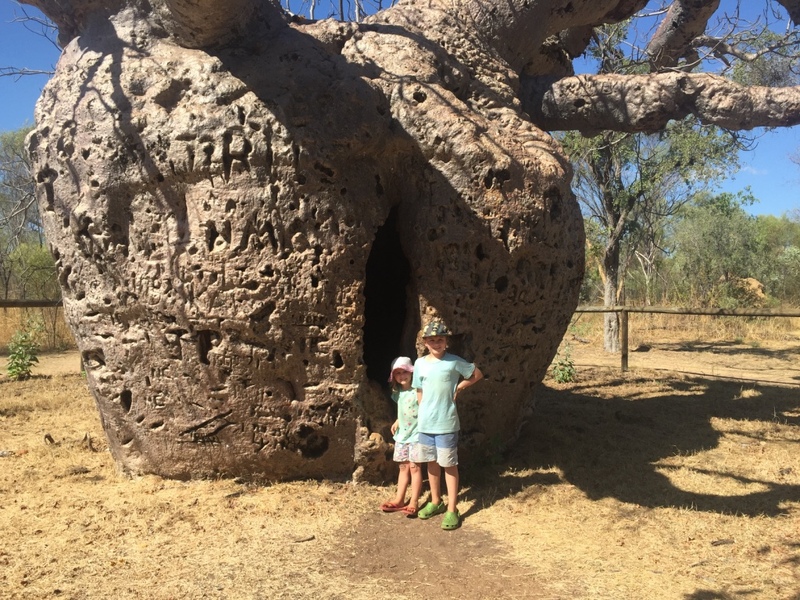 We loved Mornington and decided to stay and learn more the next day as they have a large information about the Termite Mounds that we have been seeing across the Kimberley coast. 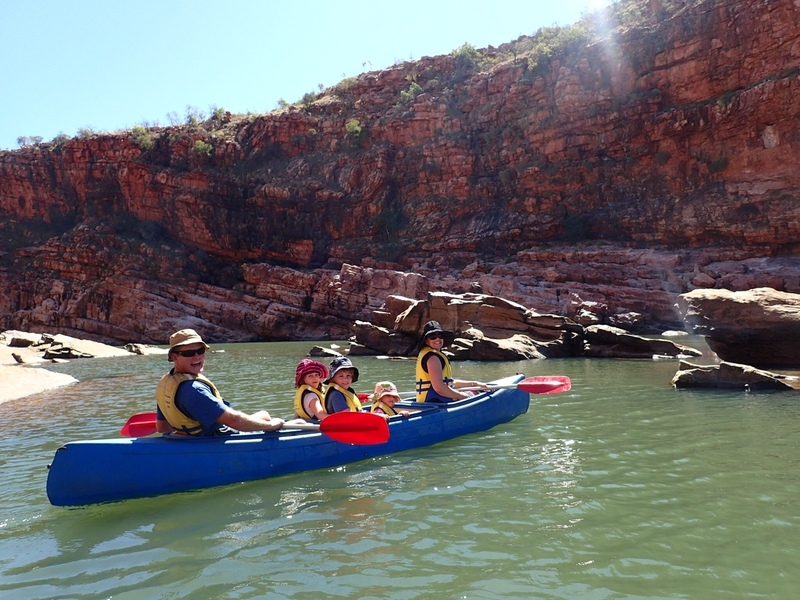 We said farewell to the Young’s who headed off to Mt Barnett (Manning Gorge) ahead of us. 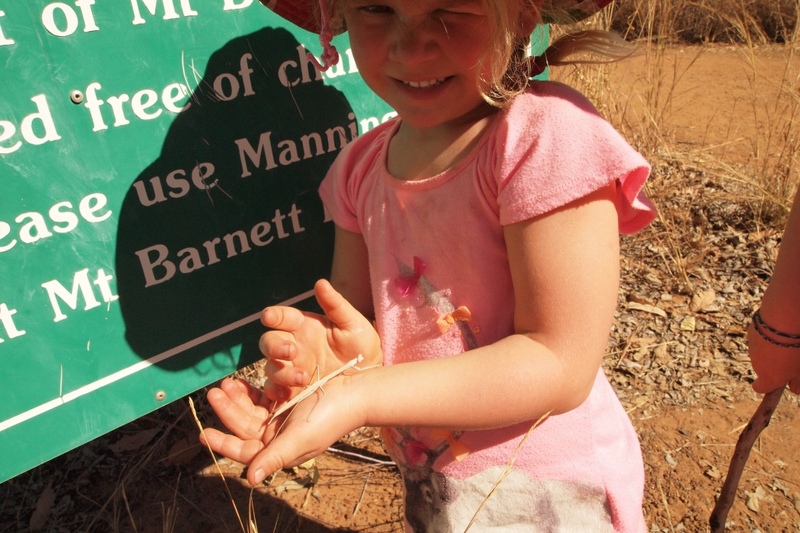 We spent the day on some walks around Mornington and learned all we could about Termites and the birds in the area. 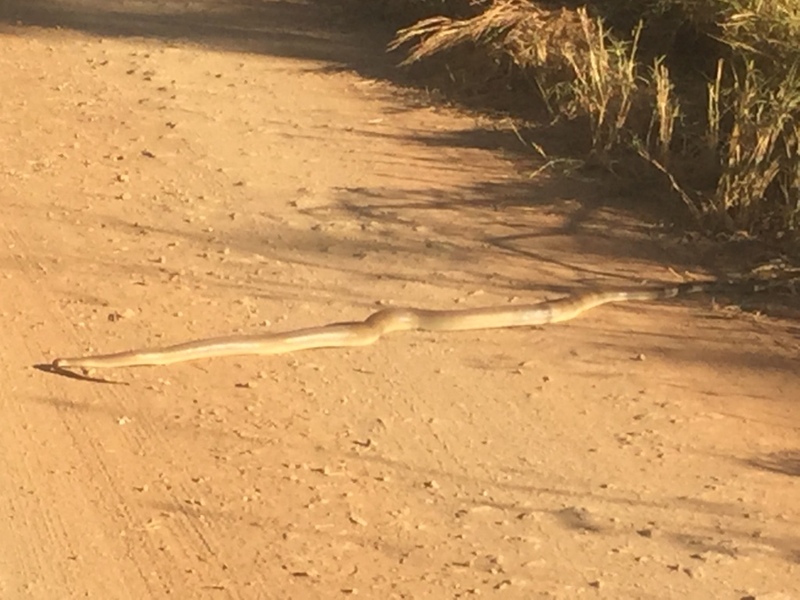 Whilst out walking we saw this huge snake…we think it was a harmless olive python – we were in the car but Aaron jumped out to get a photo…as we drove by he hissed and lurched at us. 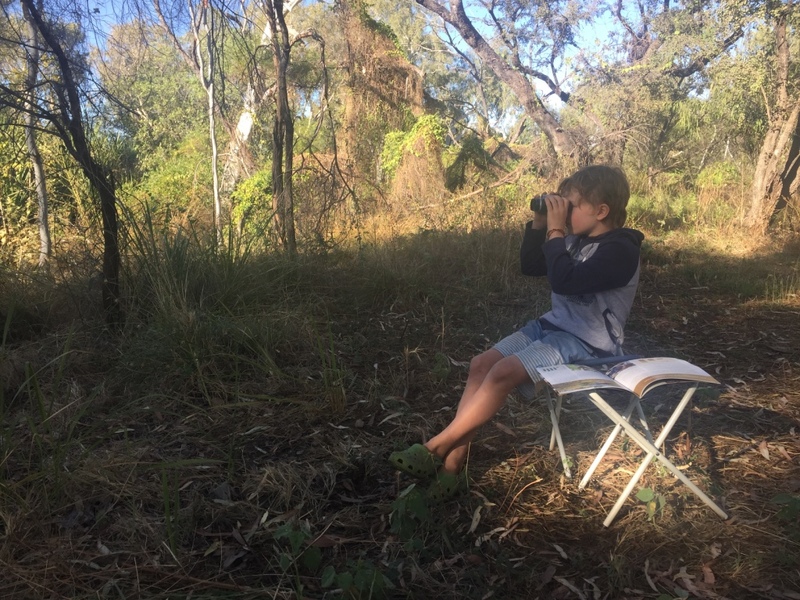 Aaron was hoping to spot a Gouldian Finch – a beautifully coloured finch that is currently one of Australia’s endangered bird species which usually around mornington. 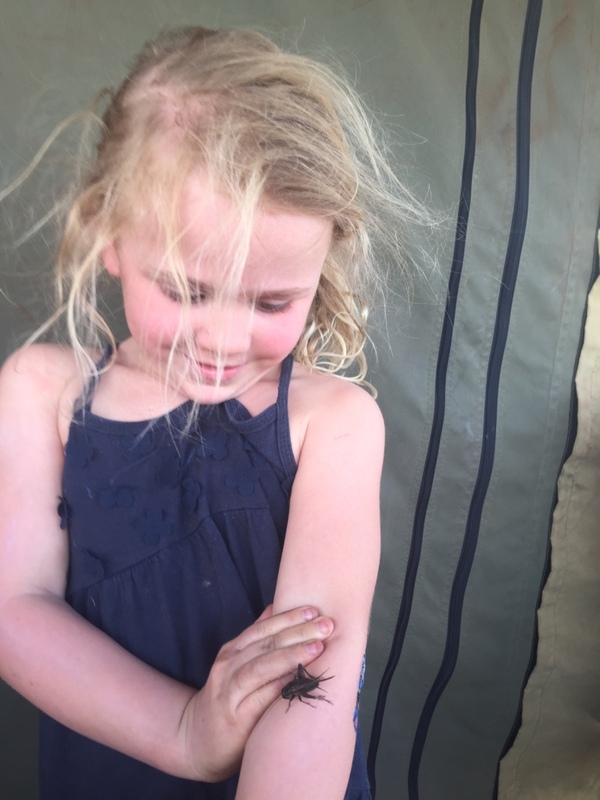 Everyone we met talked about Mornington Wilderness Camp being difficult to get into, they have limited camp numbers and they have a radio at the gate to call. We had heard that you need to be at the gat at 7am to get a spot and this is a big ask to pack up camp and drive to the gate by then. We didn’t hit the road until 10.30am after our hand washing marathon. 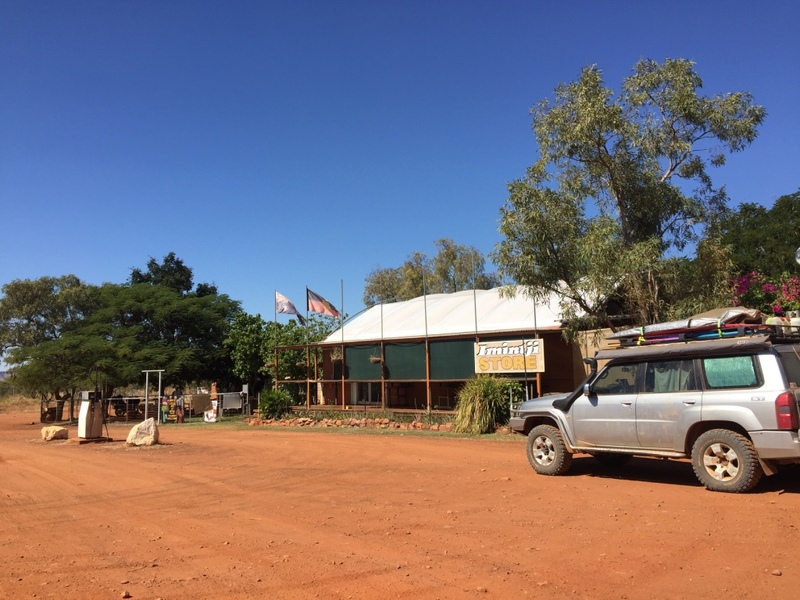 We passed the closed Imintji Roadhouse, the roadhouse has only closed this season due to an issue between the indigenous community and the roadhouse managers. We arrived at Mornington gate at 11am we thought it was unlikely we would get in but we tried our luck. 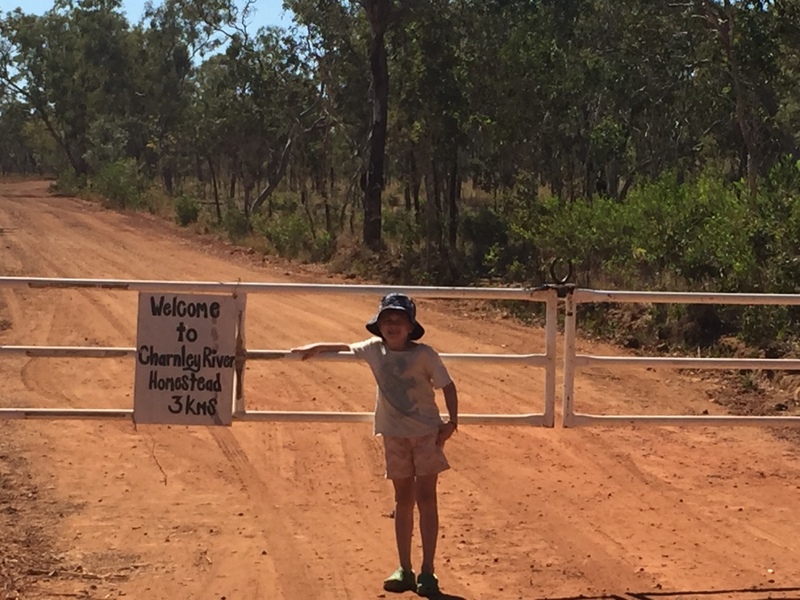 No luck so we drove the 4km further to the Charnley River Station gates and the 32km driveway into Charnley River. 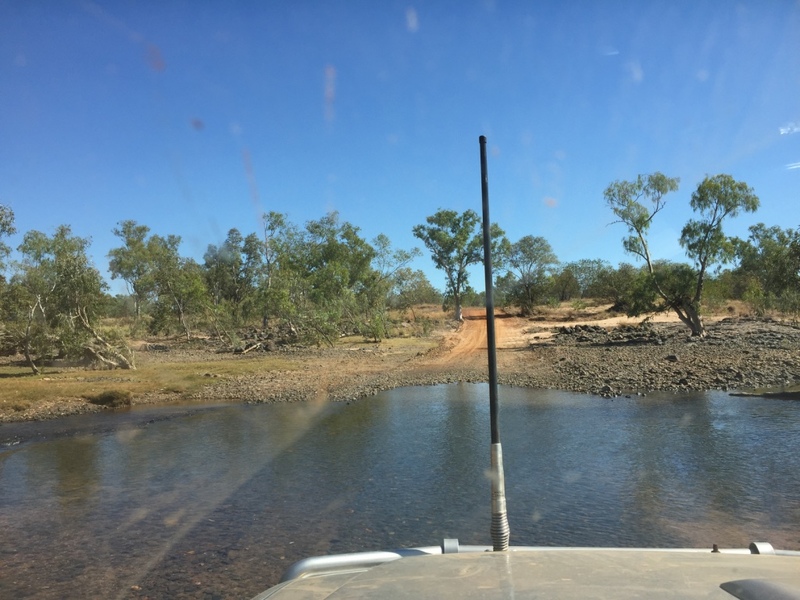 Charnely River is a cattle station that was previously part of Mt Elizabeth Station and has recently been provided to Australian Wildlife Conservancy (AWC) to manage although the huge property still has portions of land with cattle. 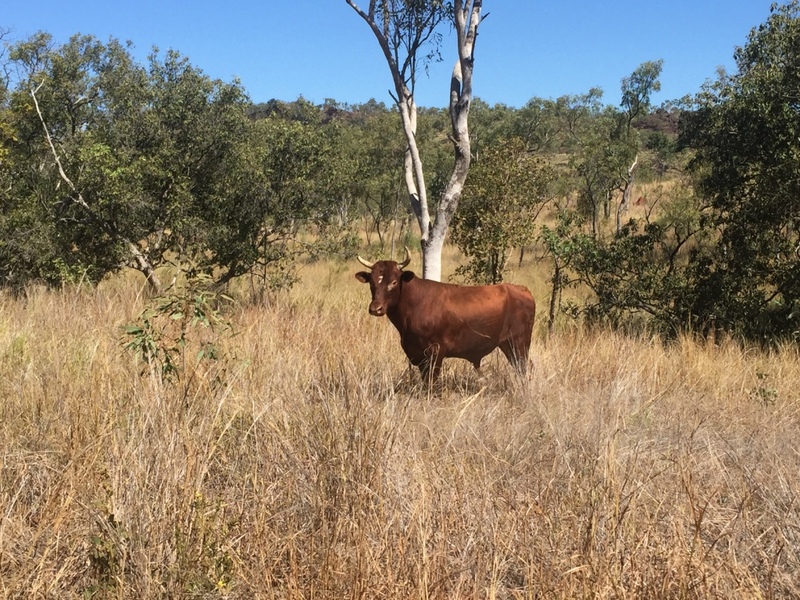 The property has wonderful geographical features that have protected the area from wild fires and land features preventing cattle accessing areas therefore has portions dense untouched bush habitat. 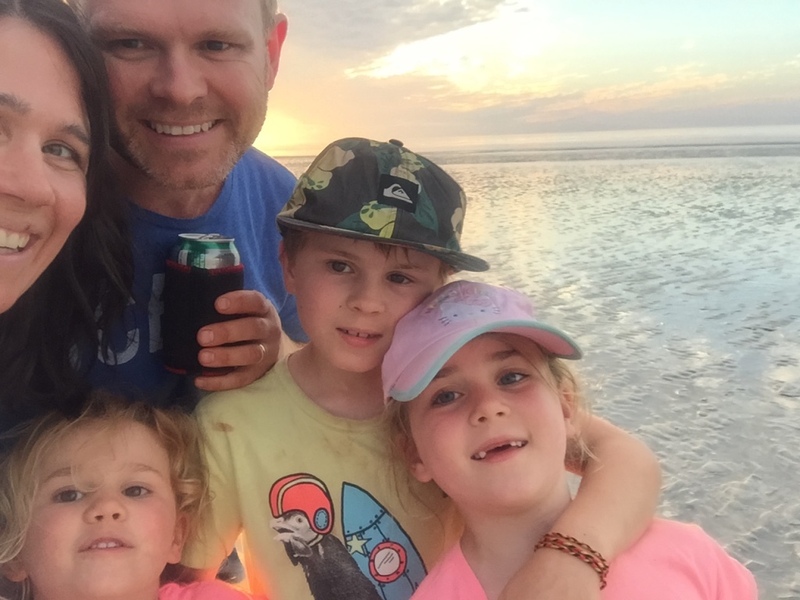 When we arrived the camp host advised we had a camp reserved next to our friends Emma and Dave and their family. 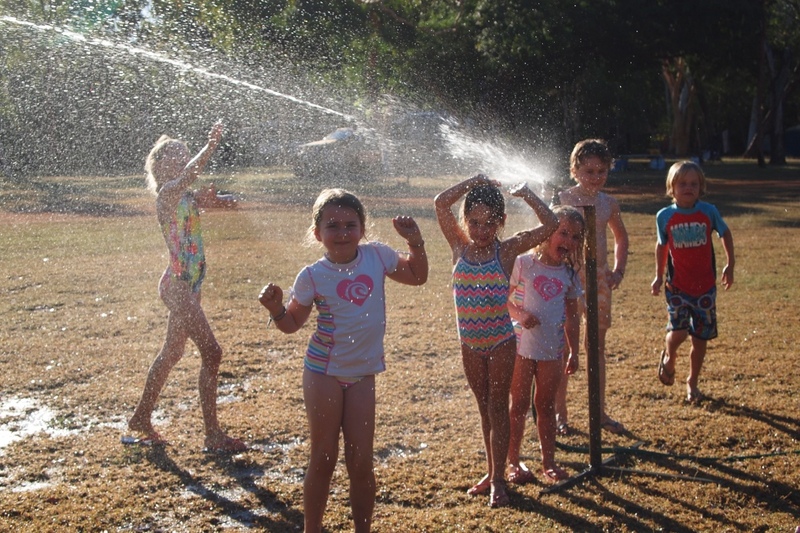 We had lunch and the kids hung out playing games and running under the sprinklers. 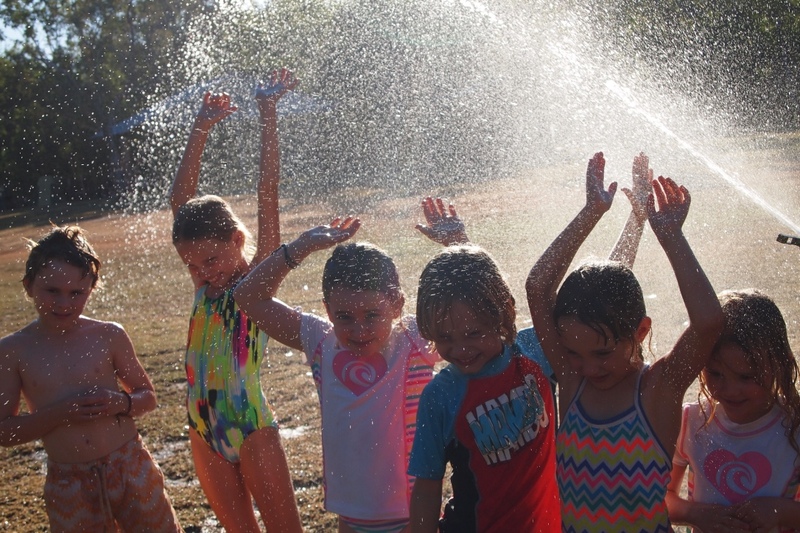 The camp grounds are set amongst the beautiful homestead gardens lots of shade and plenty of room. There were huge mango trees in full blossom and the smell was intoxicating and sweet. 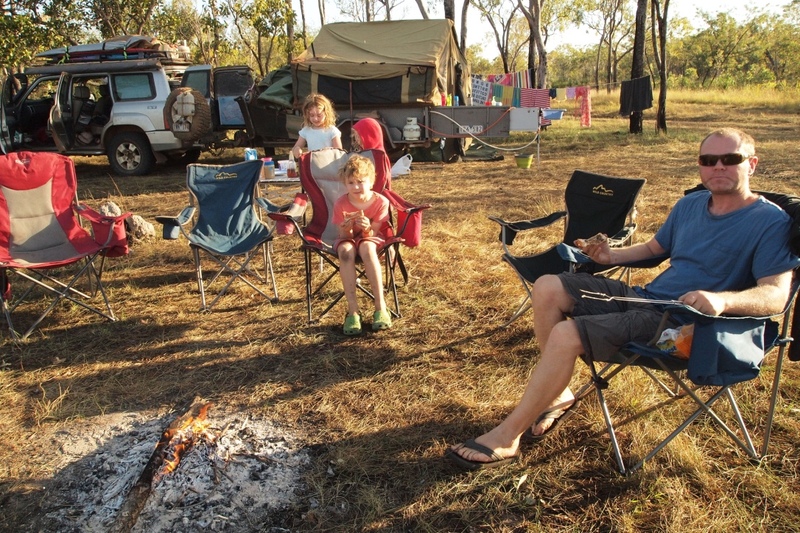 It was cold at night and the AWC do not allow camp fires due to the removal of wood and mammal or reptile habitat being lost and the bush fire risk. 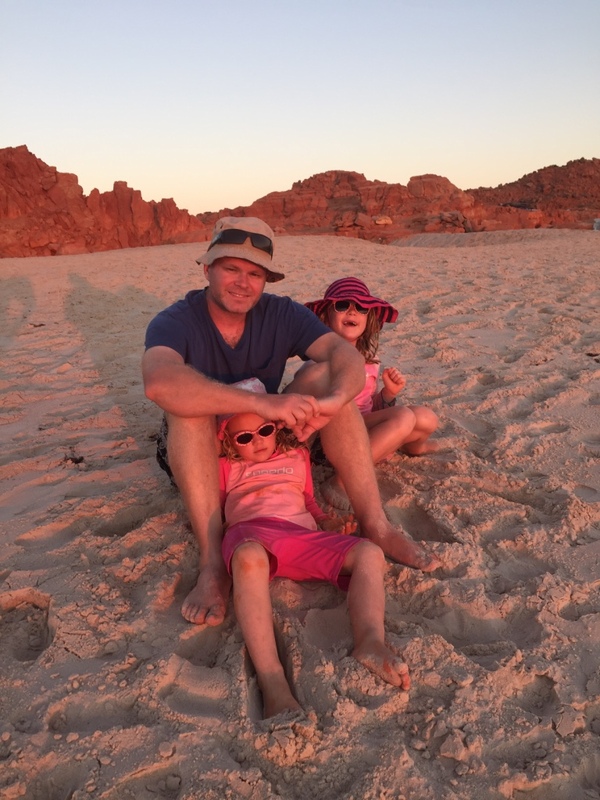 It was a cool night and we all elected for an early night this was lucky as we were woken before dawn to the most amazing chorus of dingos howling in the not like anything we have ever heard before. 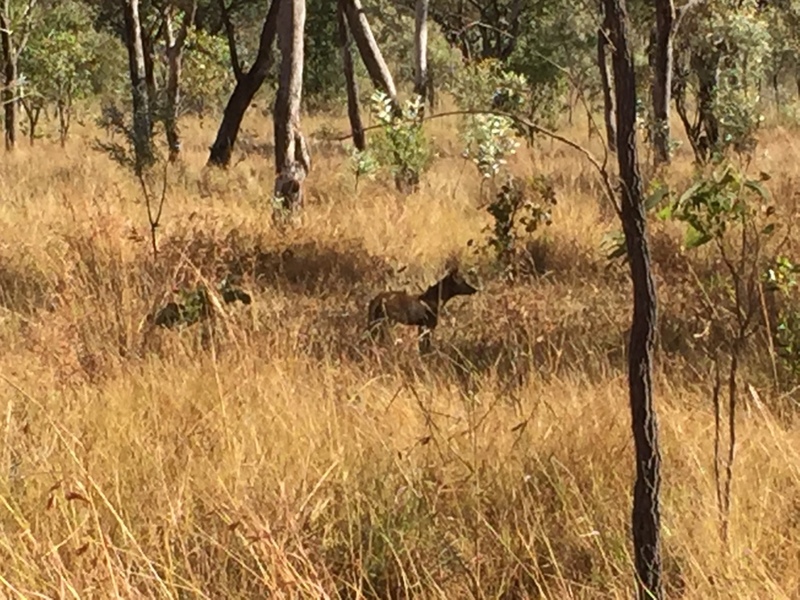 That morning when we drove out to the gorges we saw a dingo too. 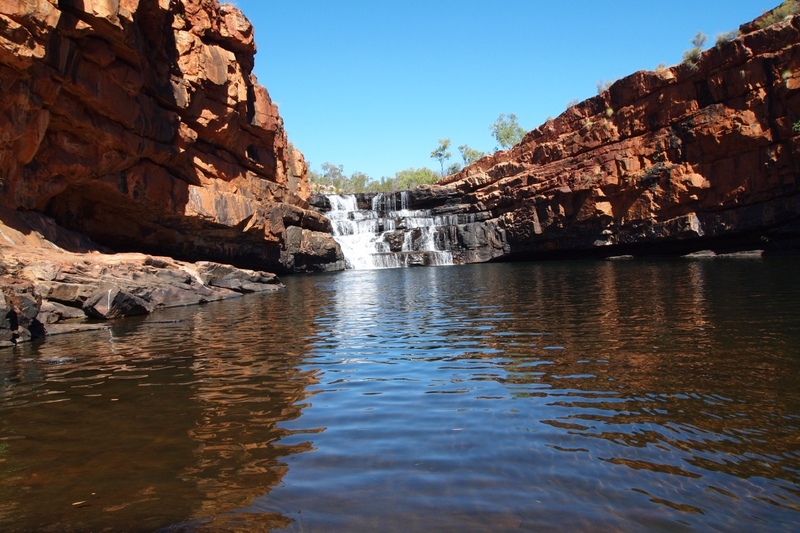 There a number gorges to visit at Charnley River but they are all a fairly long drive from the homestead. 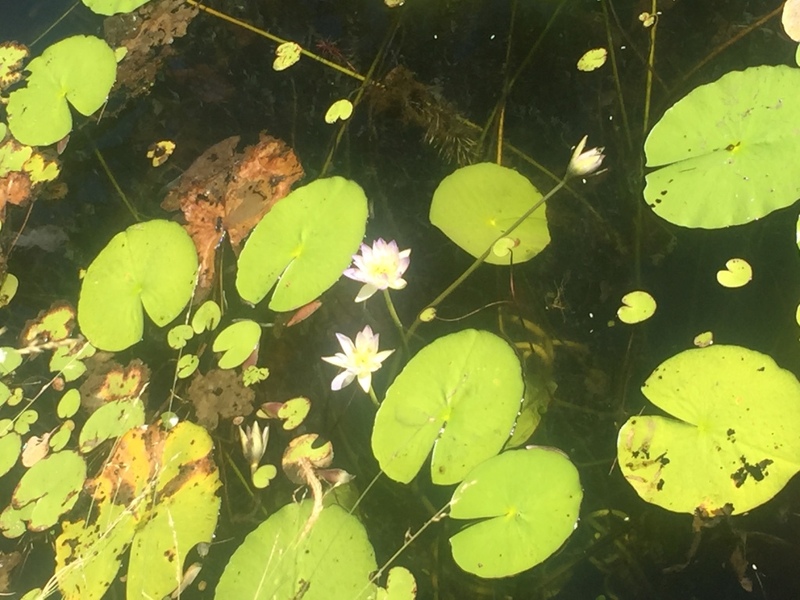 We went to Lillie Pool which was a short walk down through large block steps into a really pretty gorge with lots of water lilly’s. 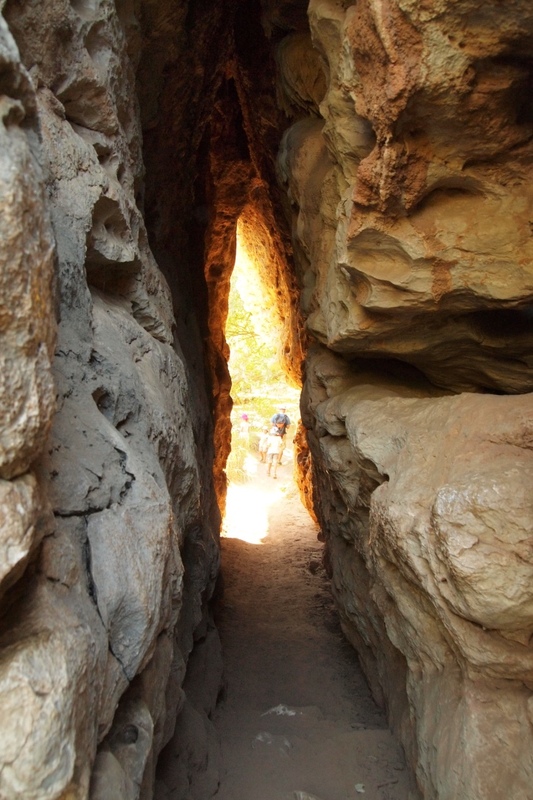 We had the gorge all to ourselves for an hour before a couple arrived. 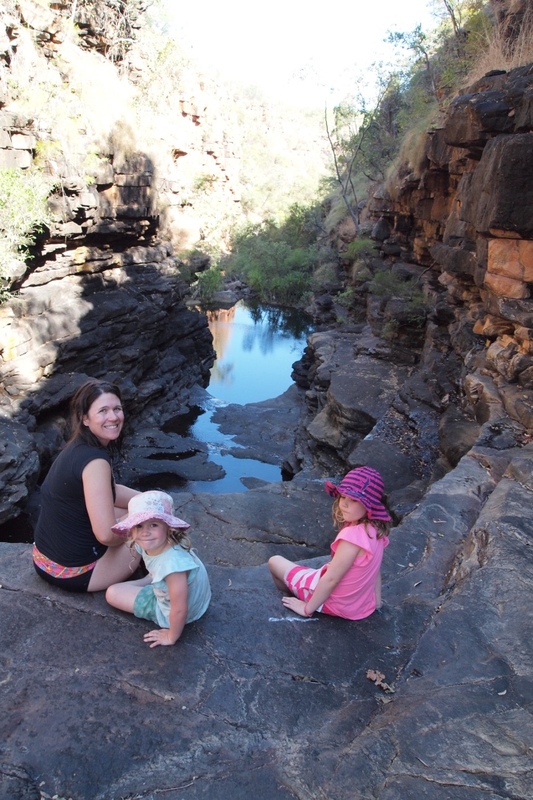 After lunch we headed to Grevillea Gorge which required a short walk before a ladder into the rocky gorge and then easy climbing into a large open pool with rocky terraces. The water was cool but lovely as it was a hot afternoon. 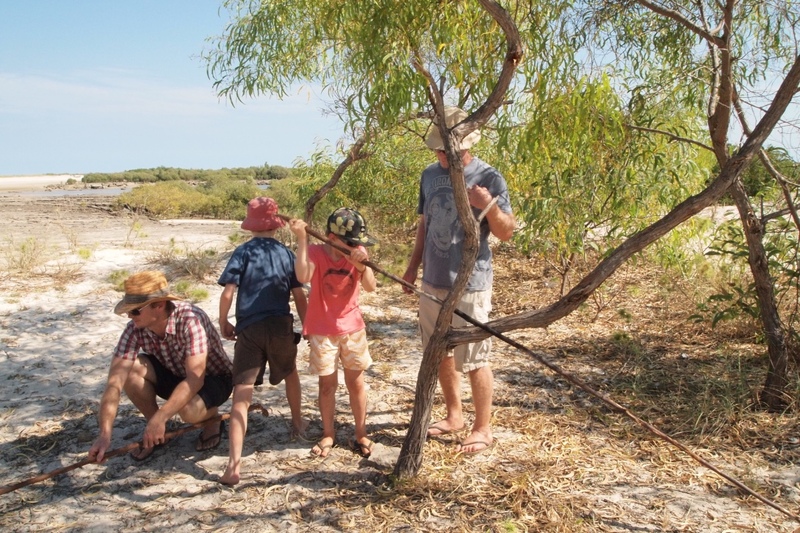 We scrambled around and after some looking found some rock art of a large crocodile looking animal which was exciting. 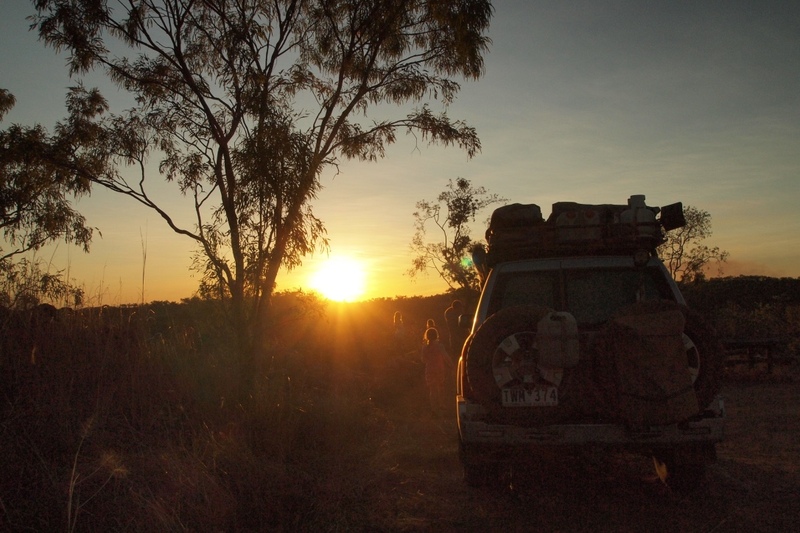 On the way back to camp we drove up to a lookout which had views over the surrounding forests. 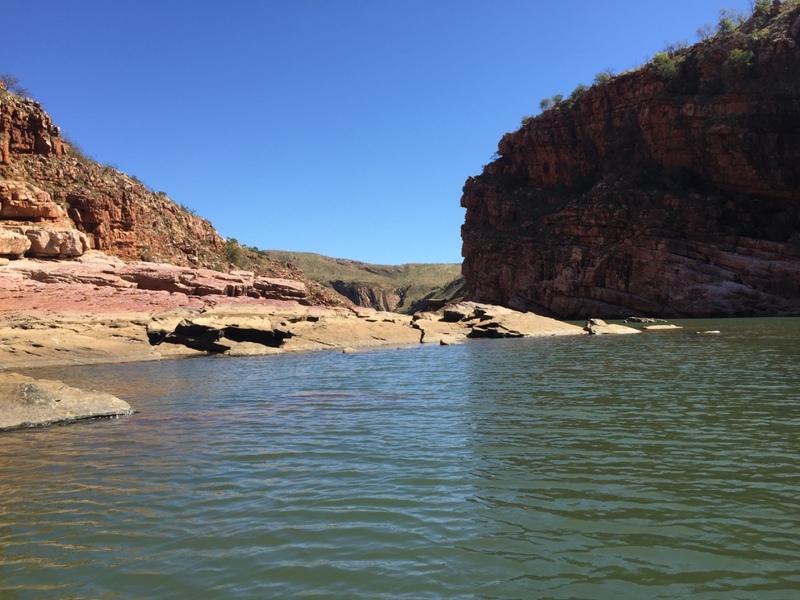 So far along our journey into the Kimberley we have been overwhelmed by the beauty and the vastness of the area, the water and the obviously abundant wildlife. 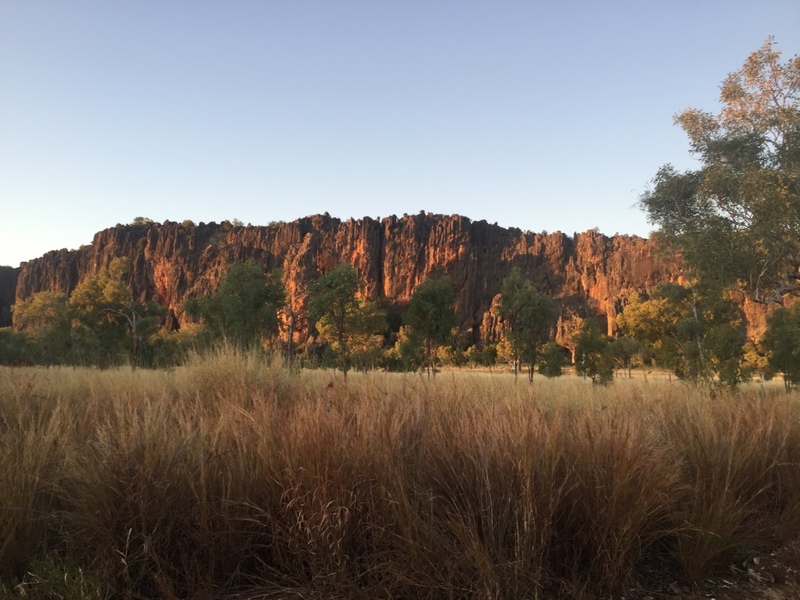 It is obvious to see why this area was home to so many indigenous communities. 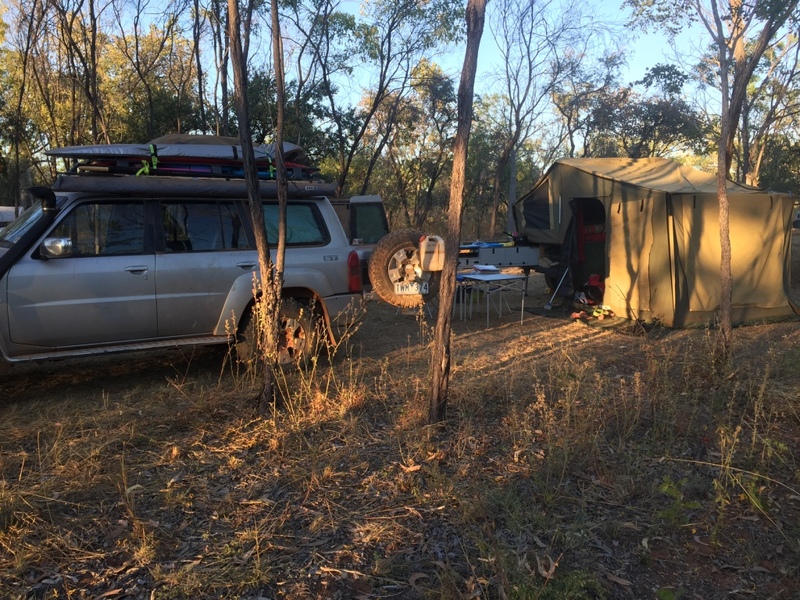 After a few days waiting it was great to hear that both families were able to get into Mornington Wilderness Camp the next day but we still had to get there by 7.30am meaning we would to be packed and on the road by 7am. We prepacked as much as possible and again early to bed. 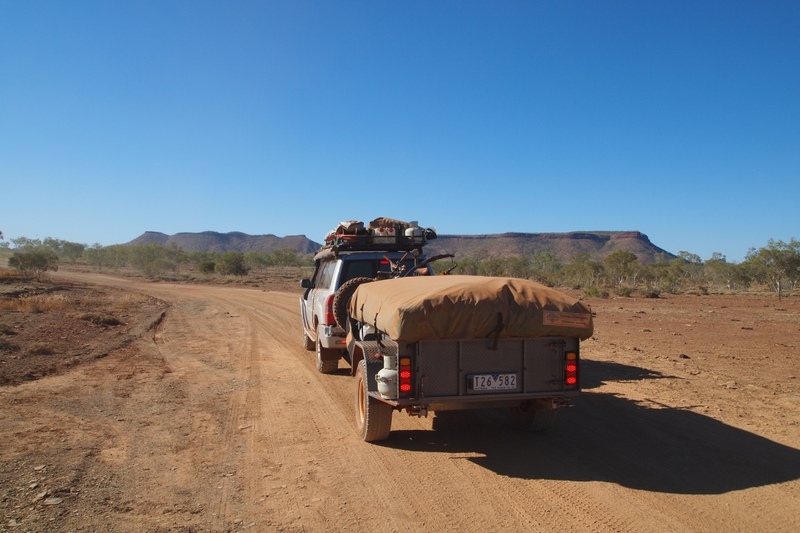 The drive to silent Grove Camp ground in the King Leopold Ranges was very beautiful as we approached the mountain range. We arrived at Silent Grove Camp and our new friends came running up to greet us asking if we wanted to camp next to them which we did. We had a quick lunch and headed off to the gorge a 10km drive on a rough rocky track followed by a 20min walk to the top of the waterfall. 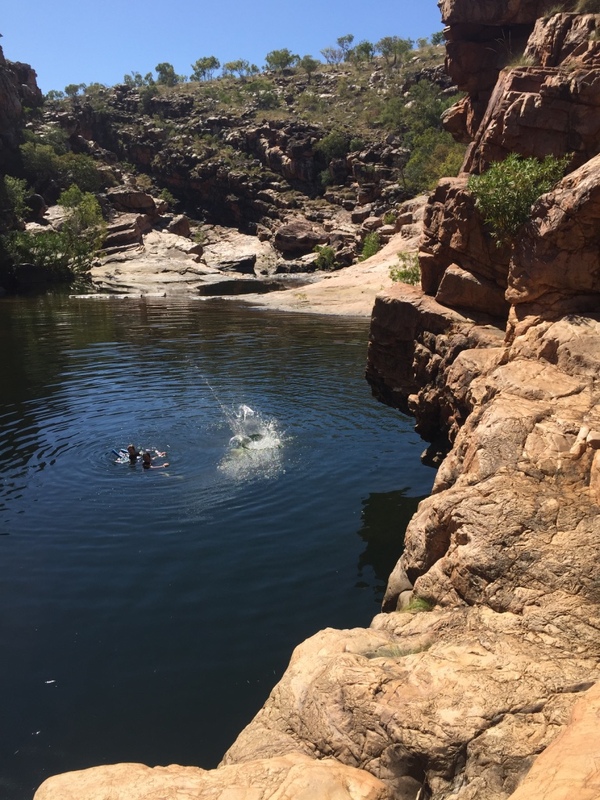 Bell Gorge was amazing there is a lagoon flowing into small pools the over a waterfall into a huge ampitheatre style gorge below with a deep pool below. 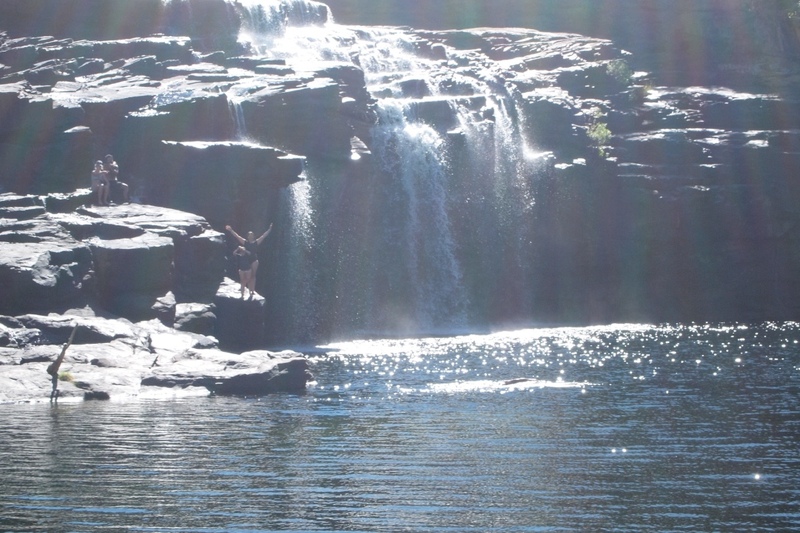 At the top of the waterfall there was an amazing pool with water flowing over into the waterfall like an infinity pool. 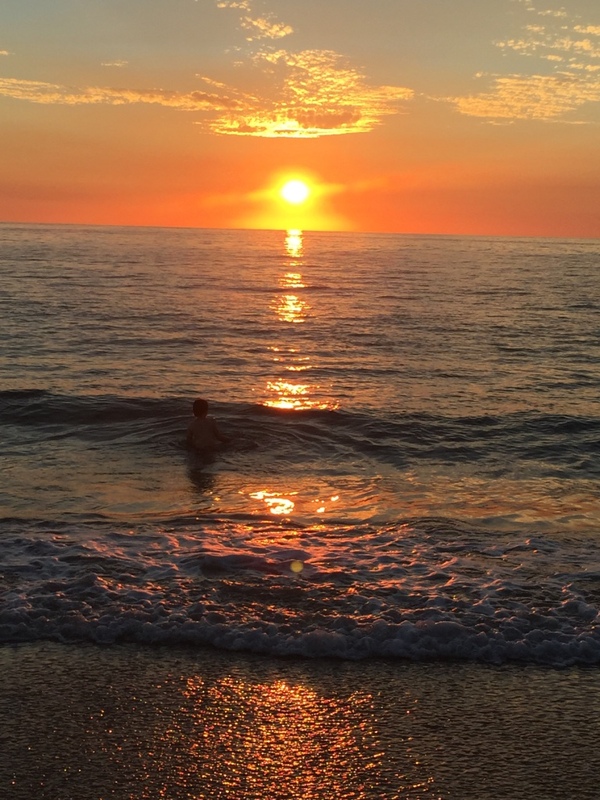 A young argentine traveller said to me “this is Gods Infinity pool” after I took a photo for him and I had to agree it was one of the most beautiful spots in Australia I have ever been. 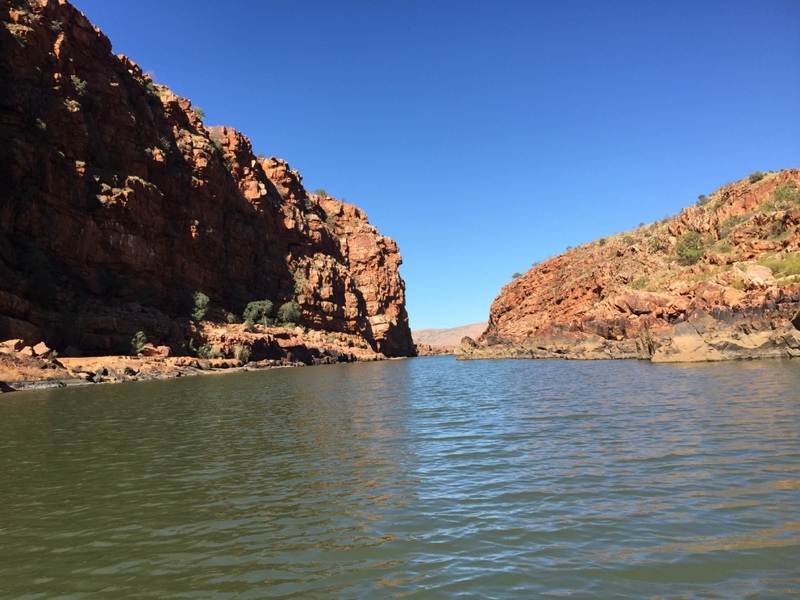 We had a great swim and then headed back to camp and we decided we might have to stay another night and visit Bell Gorge again the next day and walk to the bottom. Back at camp we enjoyed another night in the company of the Young’s sharing good conversation and some amazing wine. 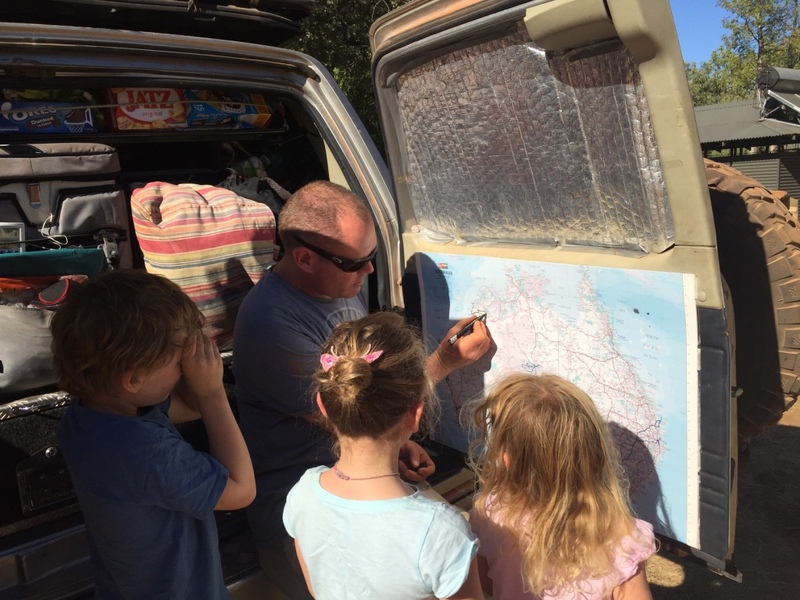 We have been astonished to find that a huge number of campers have a TV on board and when they set up camp a big flat screen TV is set up. 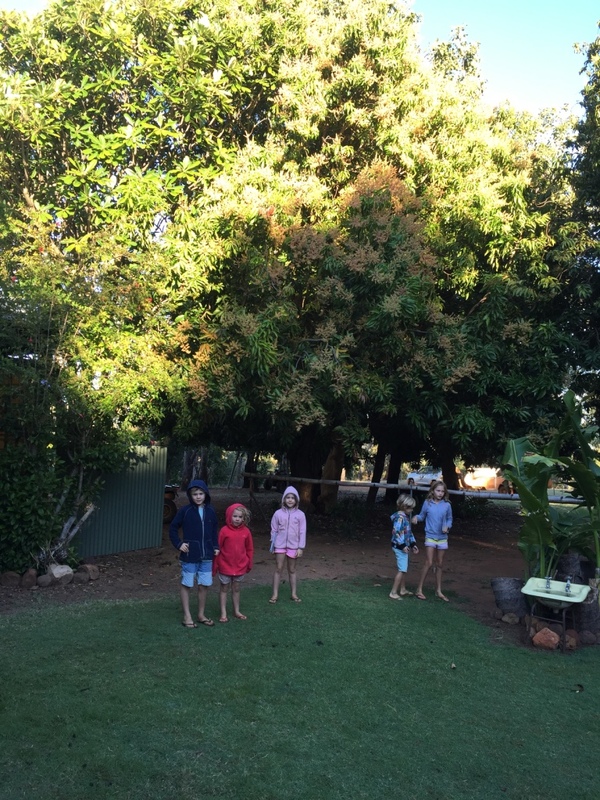 We had a neighbouring camp with an out door flat screen playing The Cars movie and after 8 weeks of very little screen time our children and the Young children all gravitated to watching the outdoor TV. 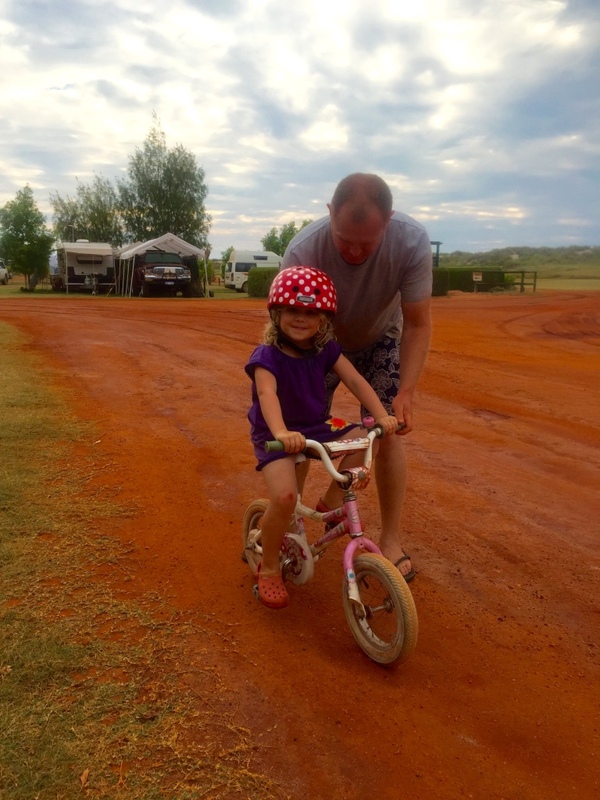 This gave the parents so resite for the evening. 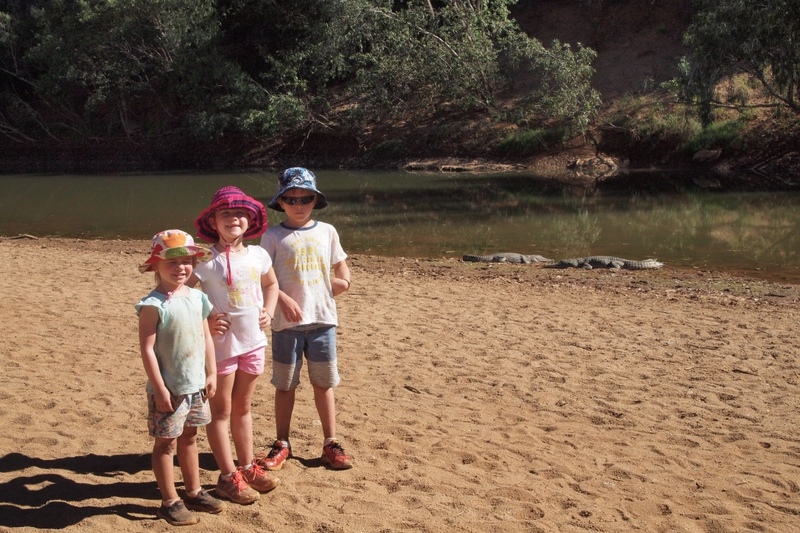 The next day the Young’s who were a day ahead of us and had already Swam in the lower pools of Bell Gorge moved on and we headed off early to the gorge with lunch packed and swim noodles under our arms. 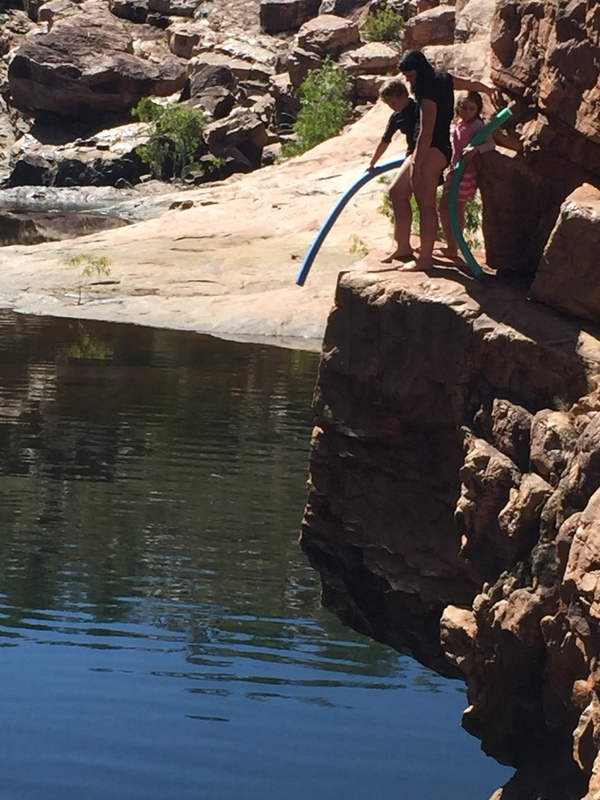 We had an amazing day at Bell Gorge…it is so beautiful and the water so refreshing and cool. 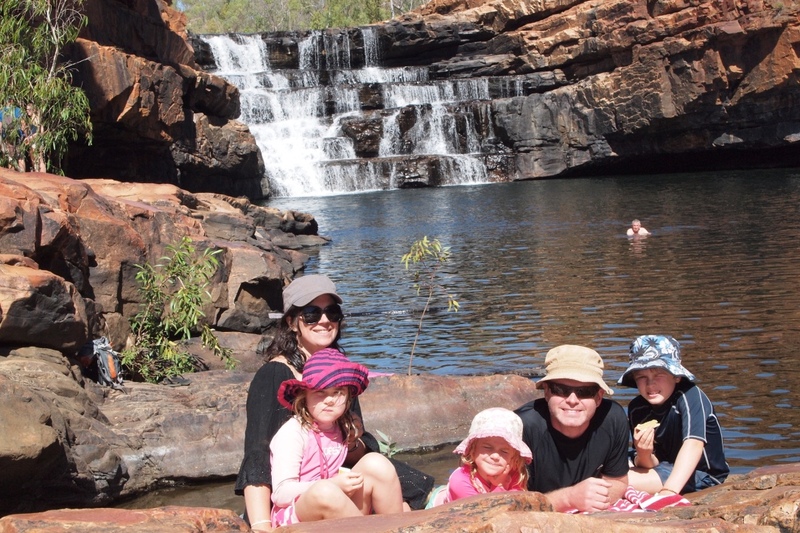 We all swam over to the waterfall and under the fast flowing white water then explored around the gorge. There were lots of tourists but many came and went we stayed for lunch seeking some shade in the rocks we had lunch. There were a number of younger travellers jumping from various high points around the gorge and Aaron really wanted to jump from a high point. 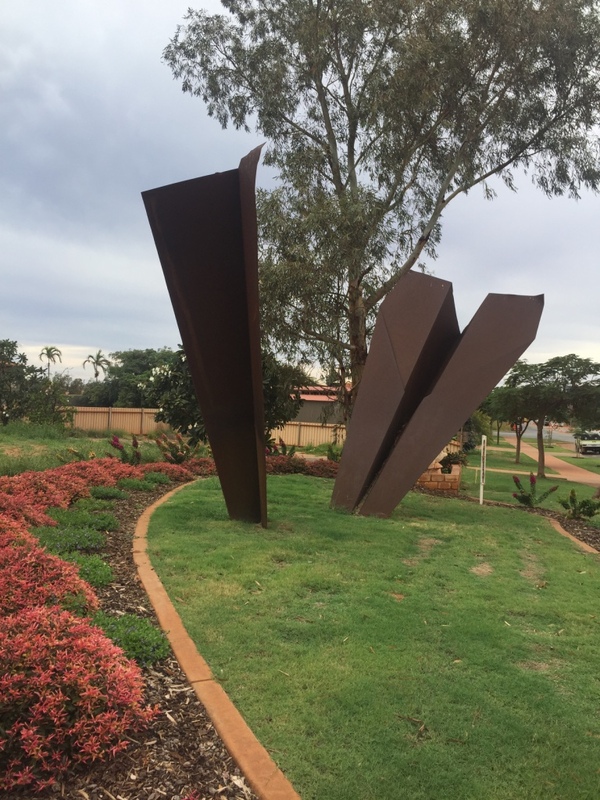 We found one that was safe, all be it still 3metres high and easy to get to. 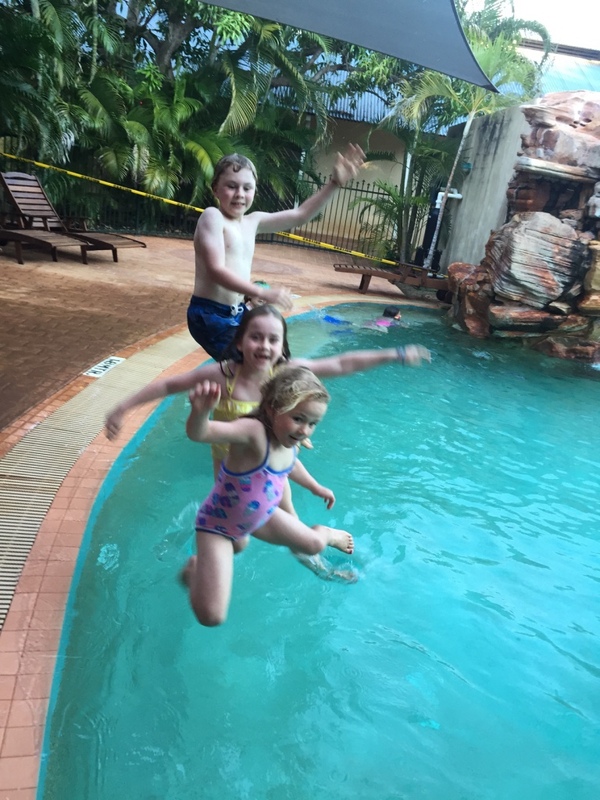 To our surprise everyone in the family had a turn at jumping in and making a big splash. After the 45minute walk back to the car and the drive back to camp we were all ready for an early night. 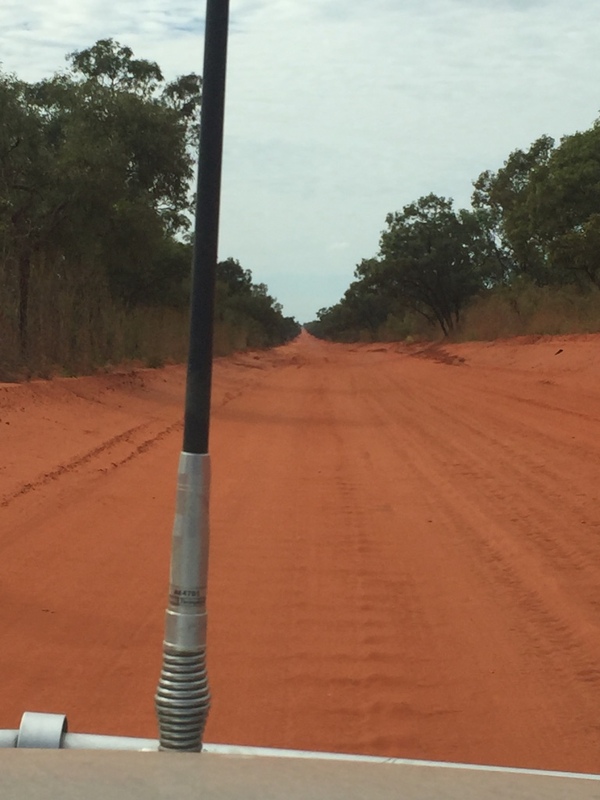 As we travelled further along the Gibb we heard more and more stories of vehicles with tyres shredded and or other bits breaking and the debate over tyre pressures and how fast one should drive continued. 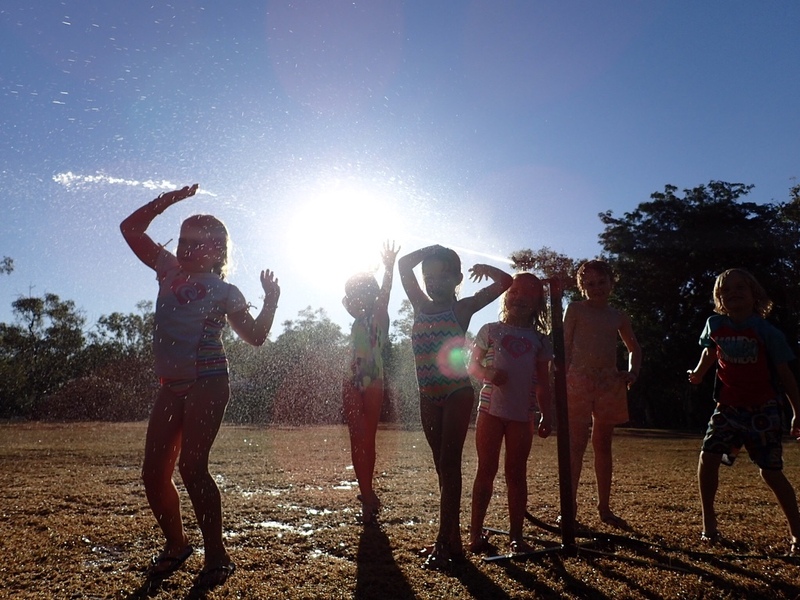 Before we left Silent Grove the next day we did two hours of hand washing…a down side of life on the road in the outback. 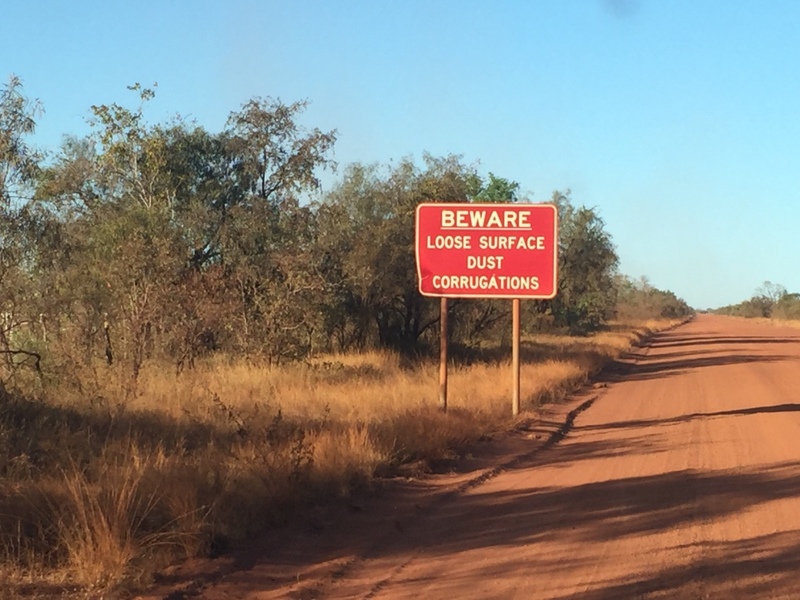 Travelling along the Gibb River Road the next day we found the road was in pretty good condition only a few corrugations and in some sections wide enough to be a dirt highway. Some people drove like it was a highway barely slowing down approaching us. 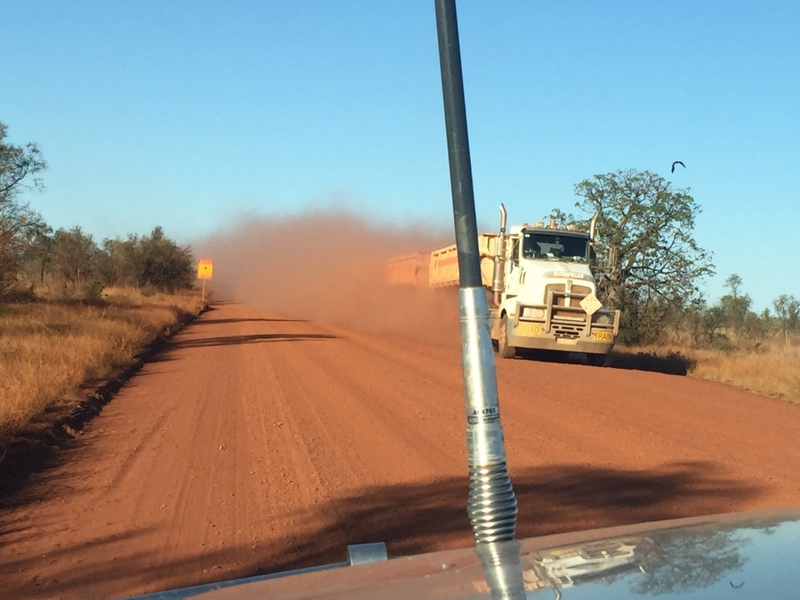 One thing for sure there was lots of dust especially when a road train drove past but the road had patches of bitumen and we were generally surprised at how good the road conditions were. 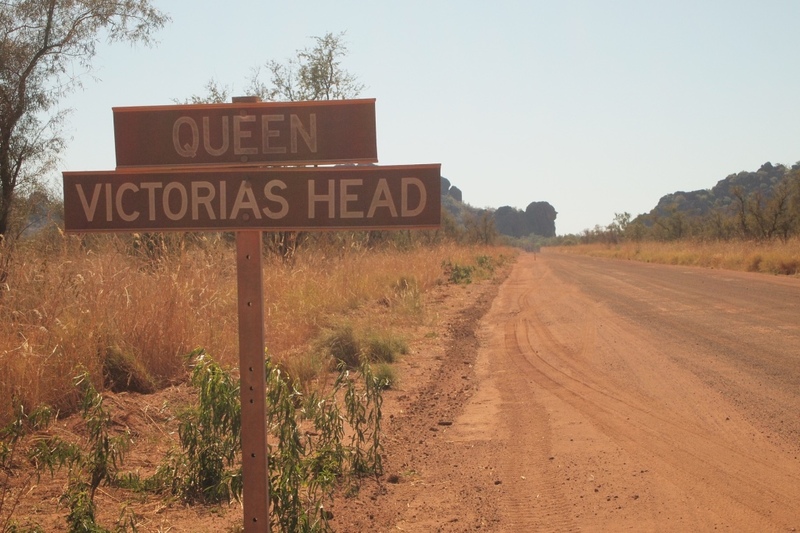 As we drove along the road we cme to a sign saying Queen Victoria Head and it wasn’t until we got a bit closer that we could see the silouette of the old Queen in the rock. Can you see the Queen? Along the road we came to Mt Hart Wilderness Lodge and the signs at the gate looked inviting so we decided to take the 49km detour into the station and check it out. 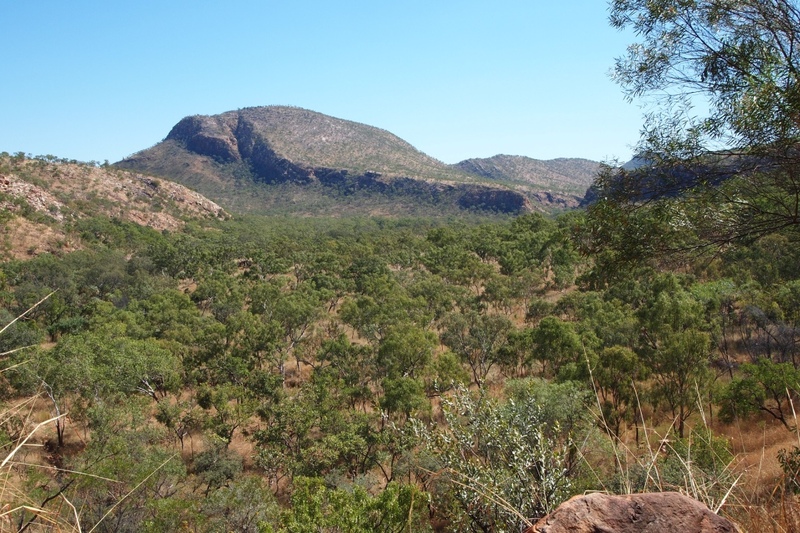 The road in crossed more than ten creeks and curved in through the hills of black dolerite rock. 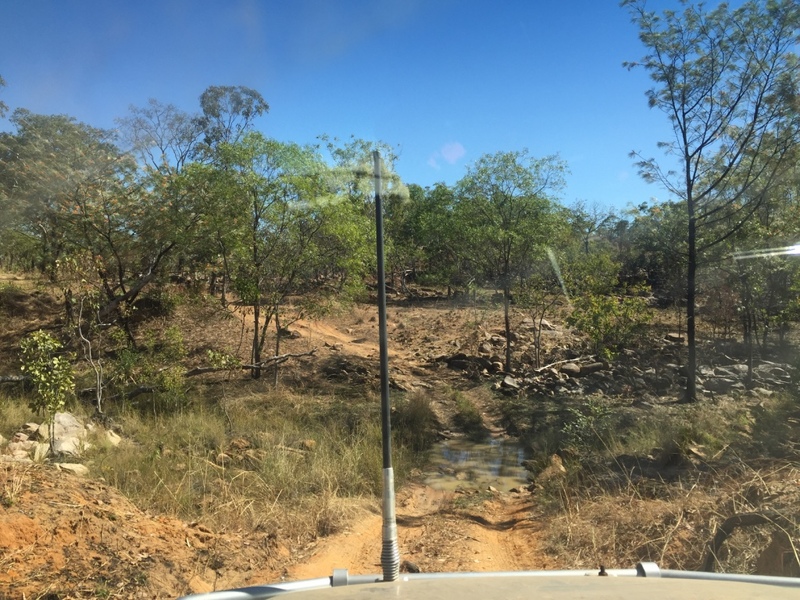 The Station management had recently been taken over by Kimberley Wilderness Adventures a joint venture of a few parties including APT a large bus and tour company and there was significant upgrade of the facilities. 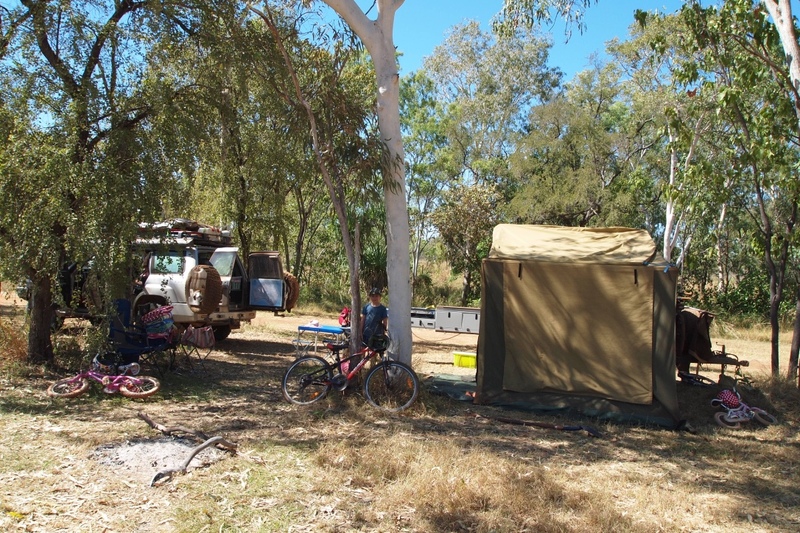 We were pleased to find the camp ground was shady with a lot of space along the river and okay facilities. 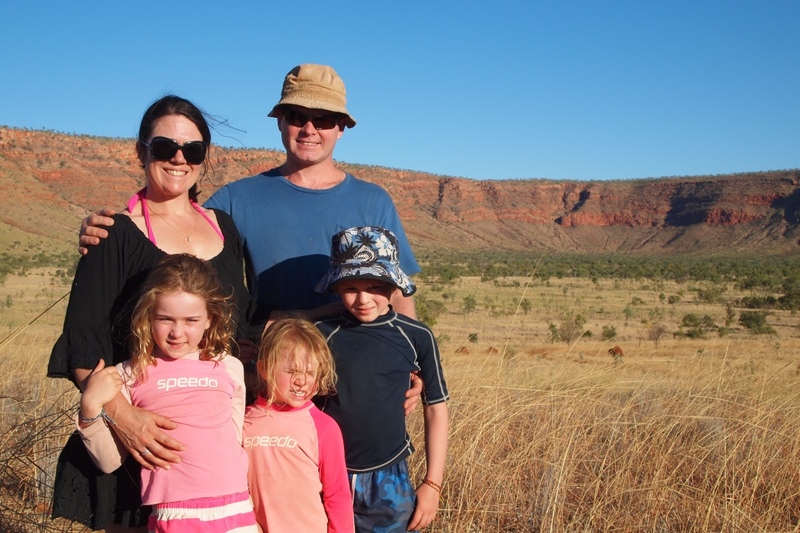 At Mt Hart we happened to be camped near a family we had met in Broome the Young Family. They have an eight year ol and two six year olds. 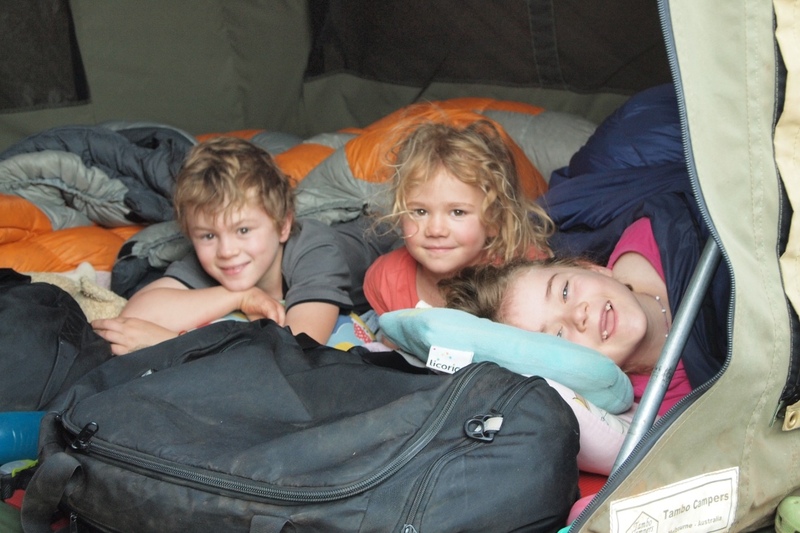 Our children all had a ball playing with their children in their caravan and then toasting marsh mellows by the fire. 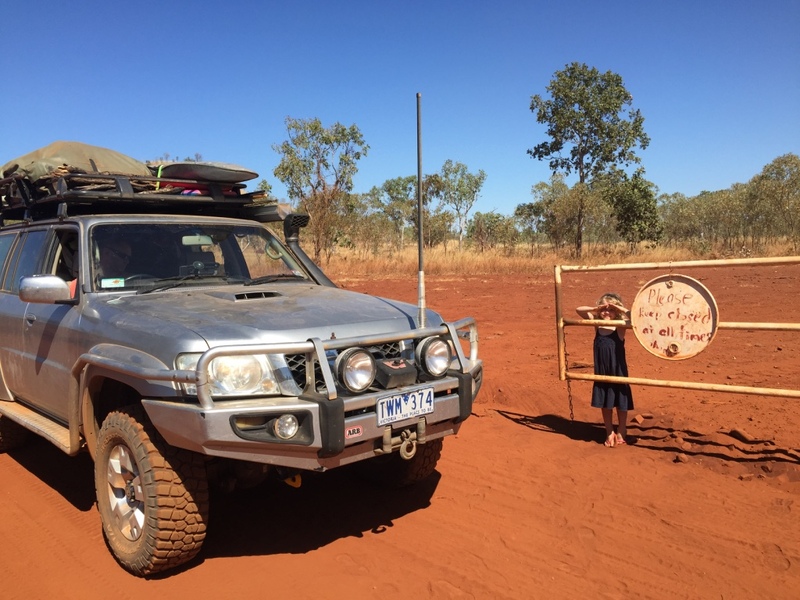 The men had serious conversations about travelling speed and tyre pressures – everyone was talking tyres as there were a lot of peple have several punctures. Along the way we had met many people who all had varying opinion as to the tyre pressure to run and the ideal speed to travel. 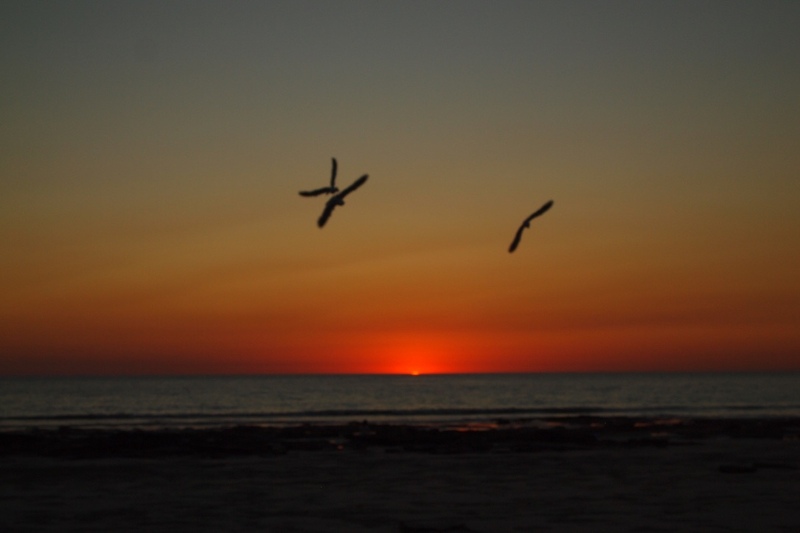 We are fortunate not having time pressures and we are happy to cruse at our own pace. Dave and Andrew were in agreement that the tyres should be lowered and that less damage was likely if you slowed down. 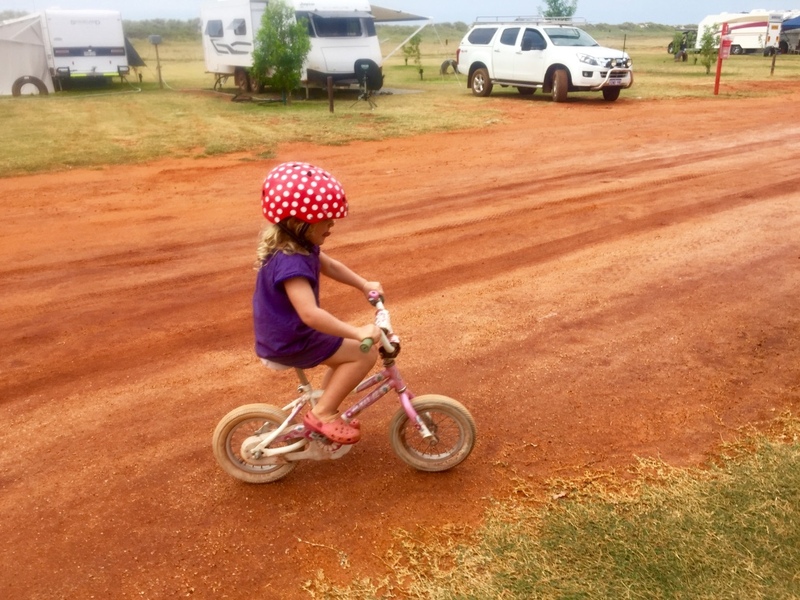 Our average speed on the Gibb was 60-70kph and the tyres were at 28psi. 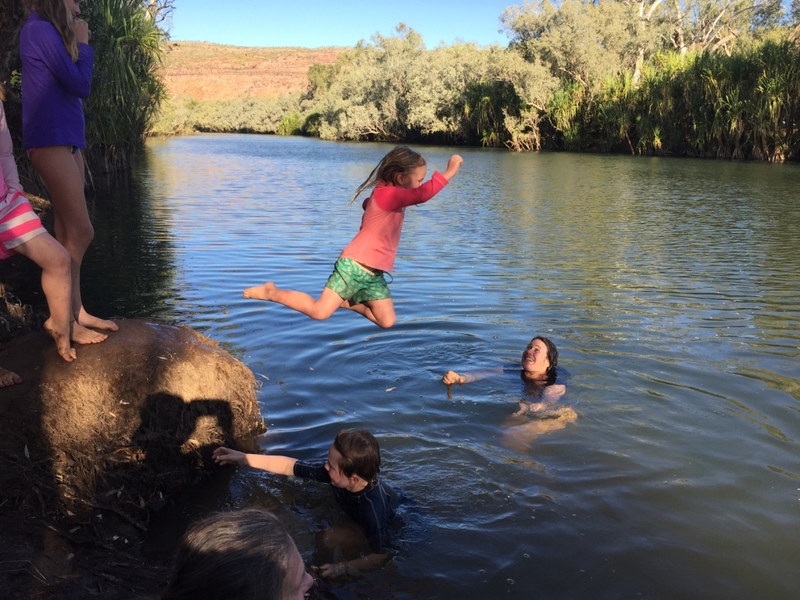 Mt Hart has a couple of river swim holes close to camp and a couple of less spectacular gorges which were short drives on 4×4 tracks from the station homestead. 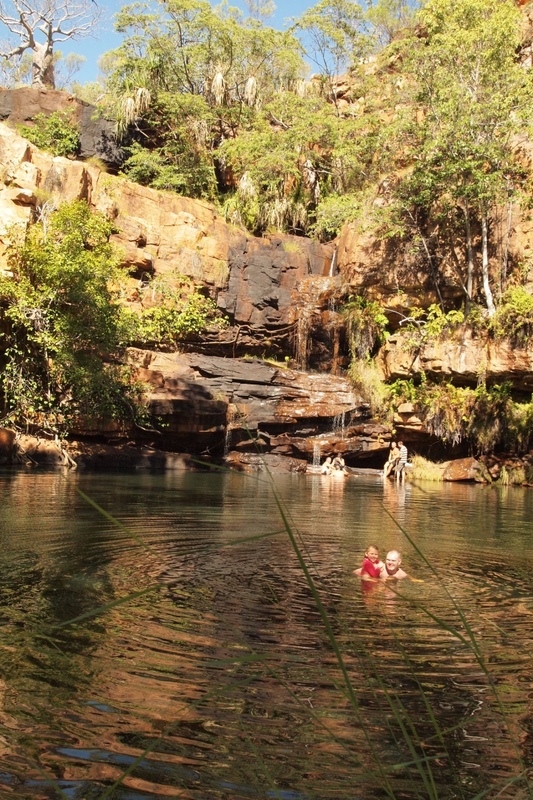 The gorges here were nice for a refreshing dip but smaller and not spectacular. A good spot but after two nights we were again ready to move on. 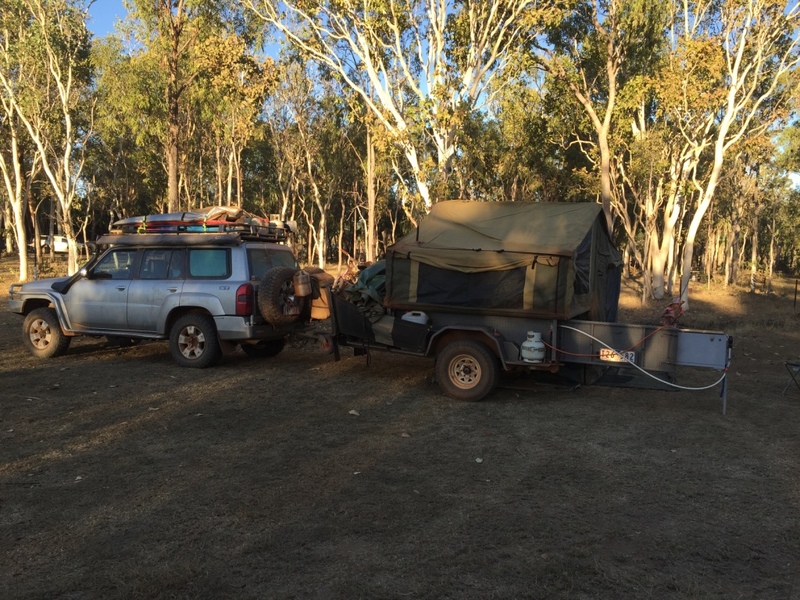 Mt Hart were selling diesel which was a bonus as fuel was also a big discussion point on the Gibb River Road as Imintji Roadhouse that many travellers used for essential refuel had closed just prio to Dry season opening rumoured to be due to a disagreement with the community and the store managers. Without this stop many vehicles could be short of fuel. 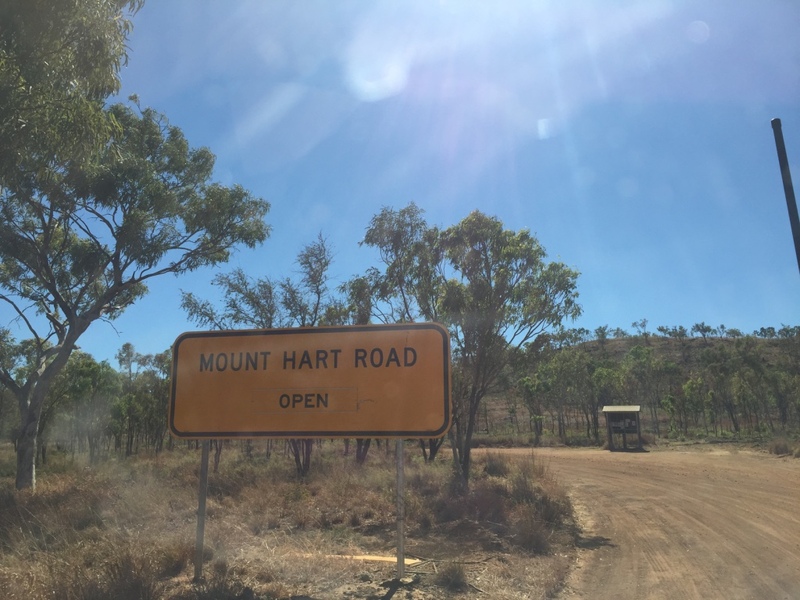 We had also heard that the week earlier a large number of travellers were stranded up the road at Mt Barnett waiting for a fuel truck delivery because the road house had run out of diesel. 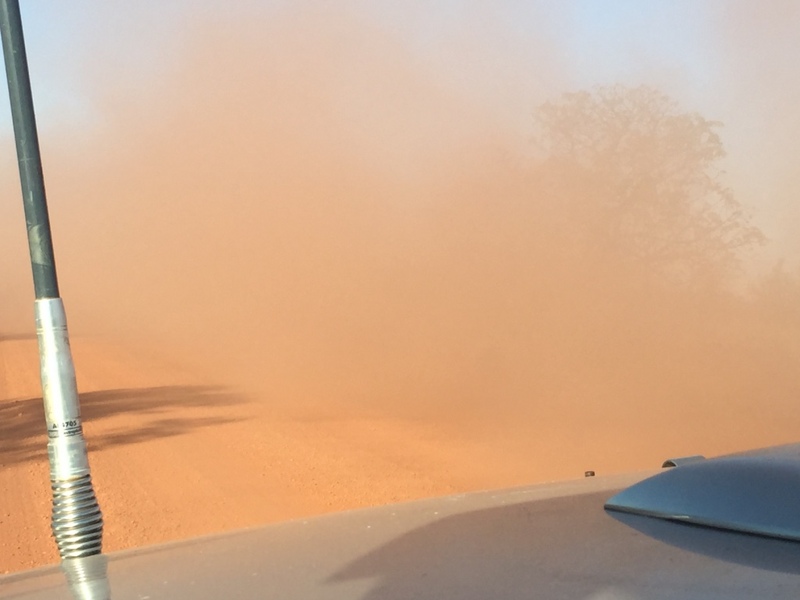 An outback driving rule that we follow is to always refill when you can. So despite the $2.30 price tag we filled up at Mt Hart before heading back onto the GRR. 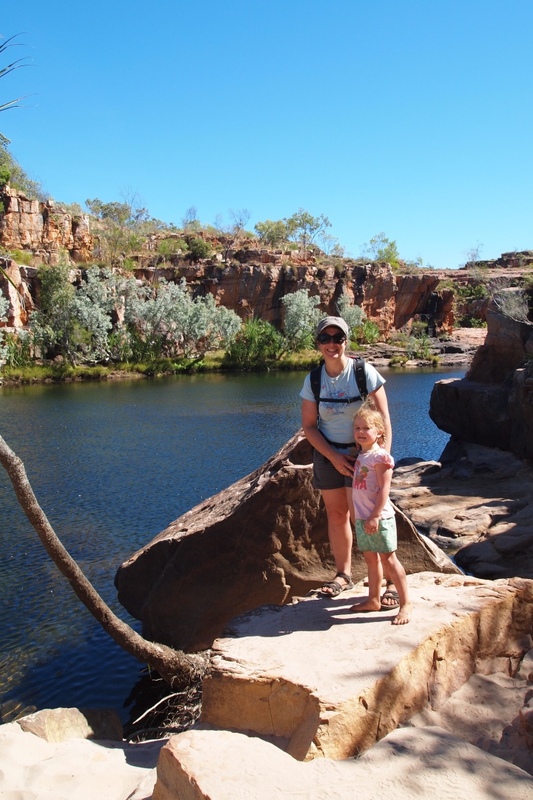 We were excited to be heading into the vast Kimberley all along the Gibb River Road which traverses across the Kimberley. 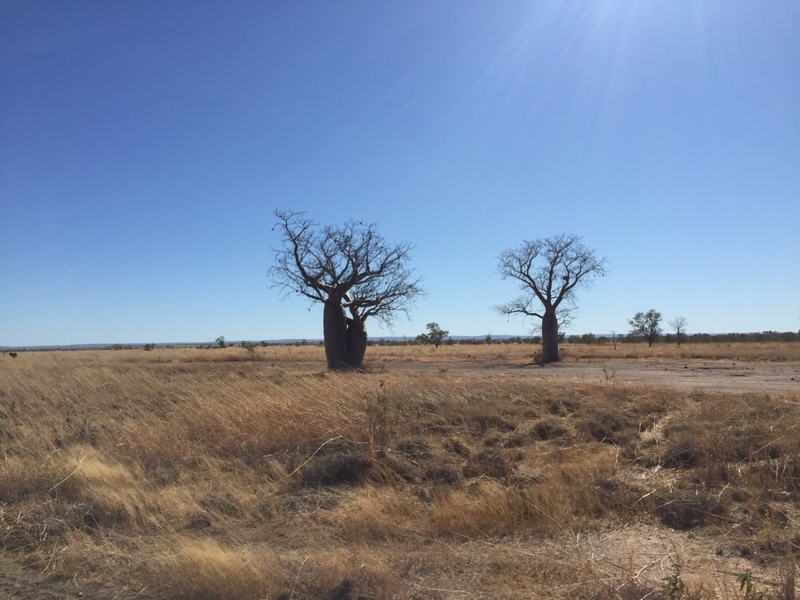 This area has a lot of early Australian farming history and still has a number of large cattle stations however the the whole area was also the homeland country of many indigenous communities for thousands of years prior to European settlement. 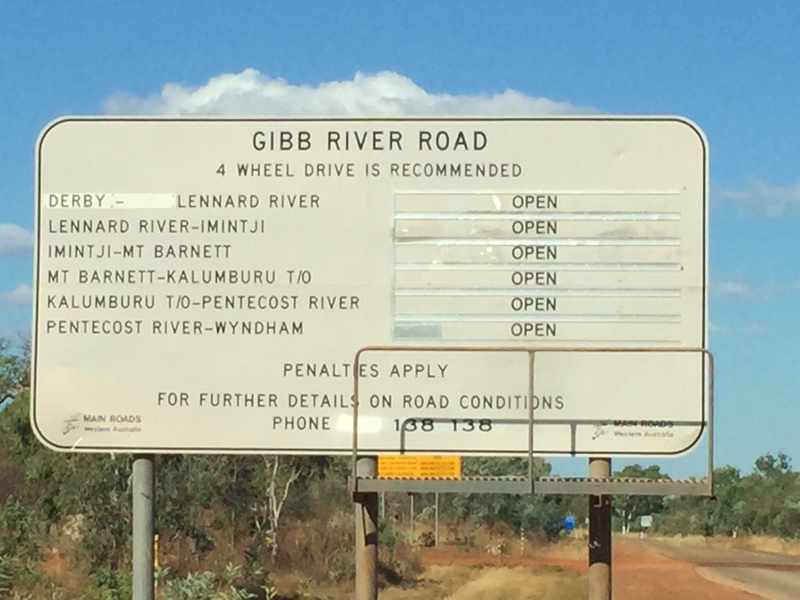 The Gibb River Road was once a real 4×4 track and remote country however the road has been improved for the communities in the Kimberley and this has allowed many more tourists into the area. 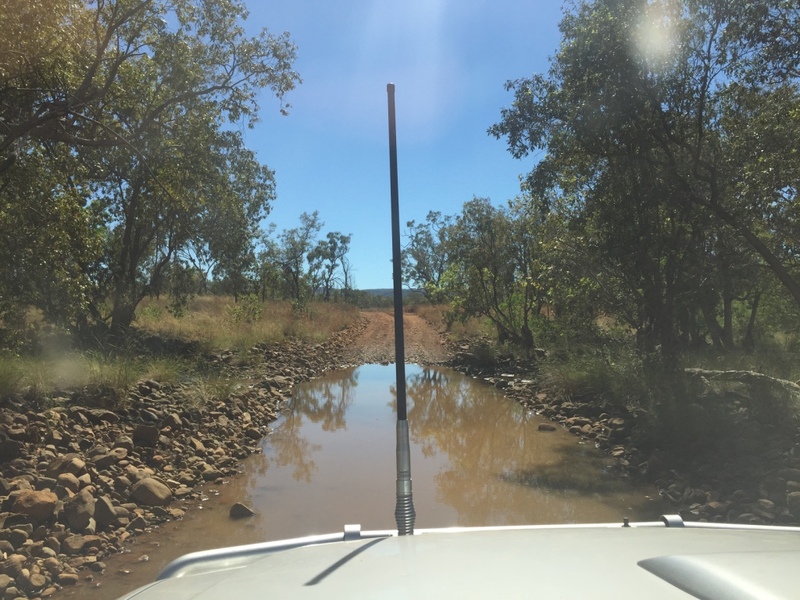 You still need a four wheel drive and an off road camper to access the area fully but the main Gibb RR is a virtual highway. 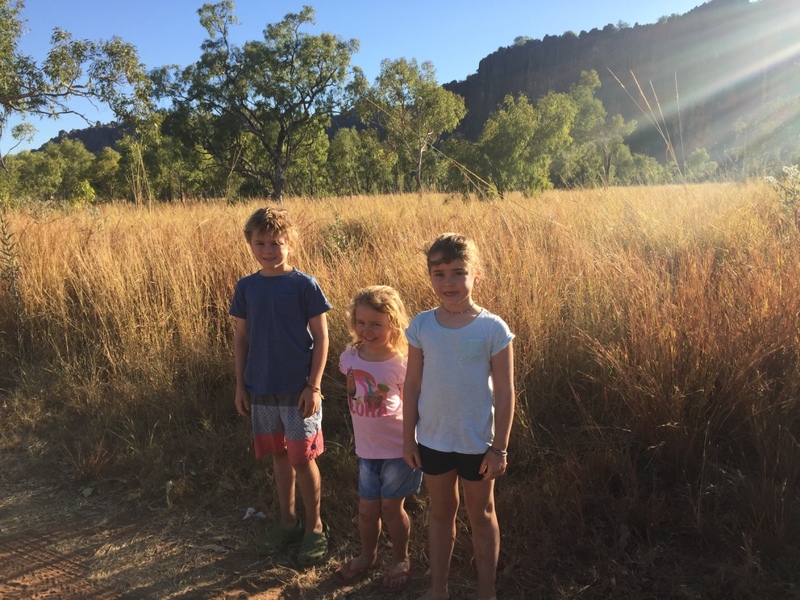 Our first stop on the Gibb River Road and into the Kimberley was Windjana Gorge National Park and all the stories of busy camp sites were definatly true – it was hard to find a site but we squeezd in and met the nearby campers who were all very friendly. Warning sign…definately lost of dust!! 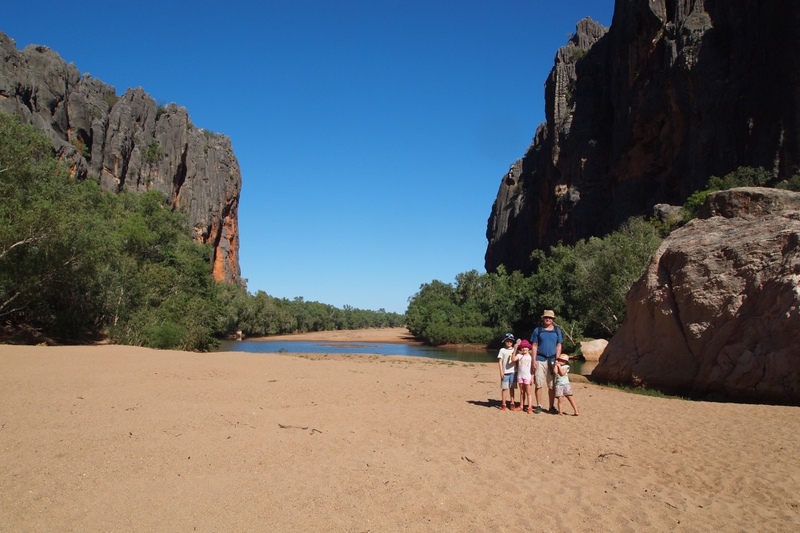 Windjana Gorge is a big wide open gorge said to be ancient coral reefs from an inland sea that once covered most of the area. 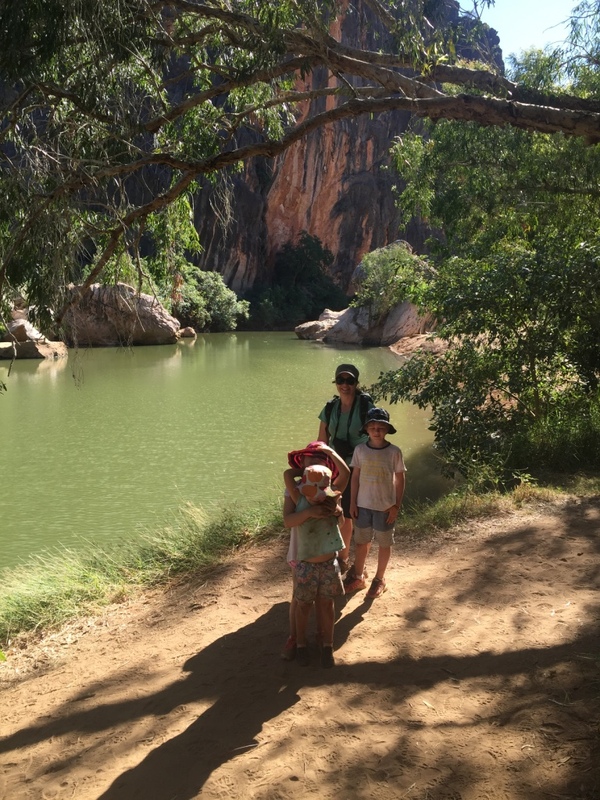 We spotted some evidence of ancient sea animals on the cliff walls along the gorge but the highlight for the kids was spotting the freshwater crocodiles. 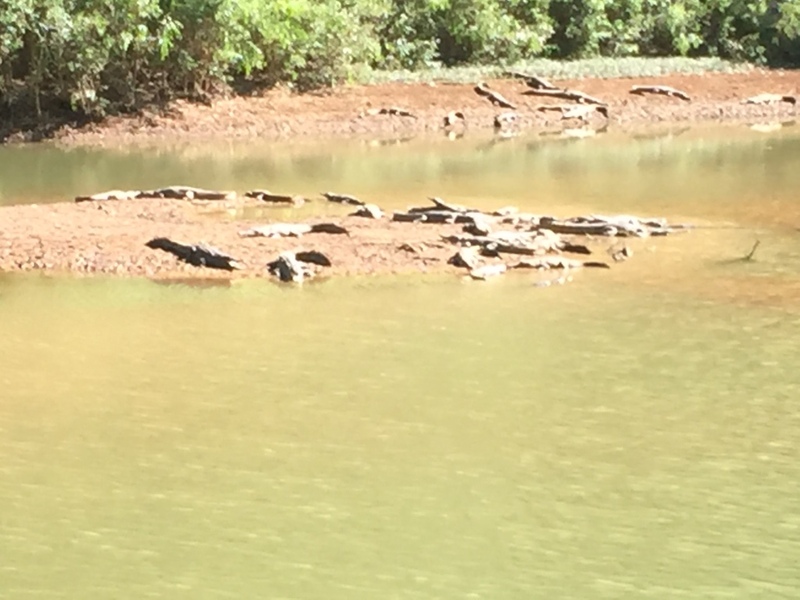 There is a large permanent population of freshwater crocodiles which living in the water holes along the gorge. We counted close to 65 on our walk. 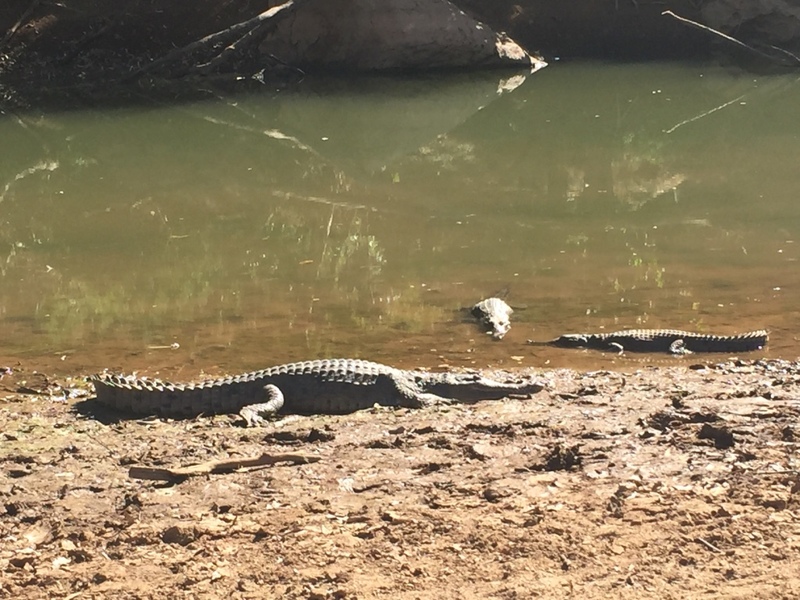 The freshwater crocodiles are supposedly ‘harmless’ to humans if you keep a safe distance and generally they will move away from you if you come closer but we didn’t bother checking this theory. 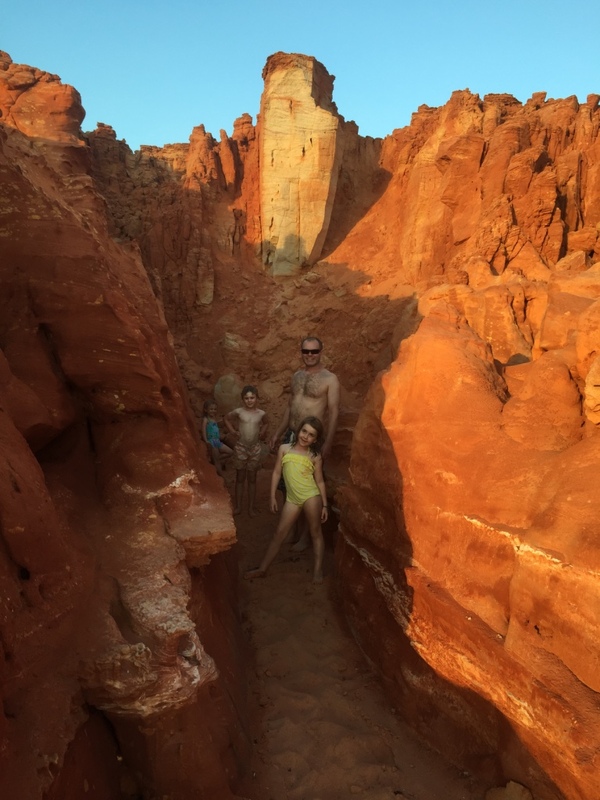 The gorge has spectacular red rock walls towering over the river bed which has been carved from a millennia of wet seasons and water rushing through the area carving a path out to sea. 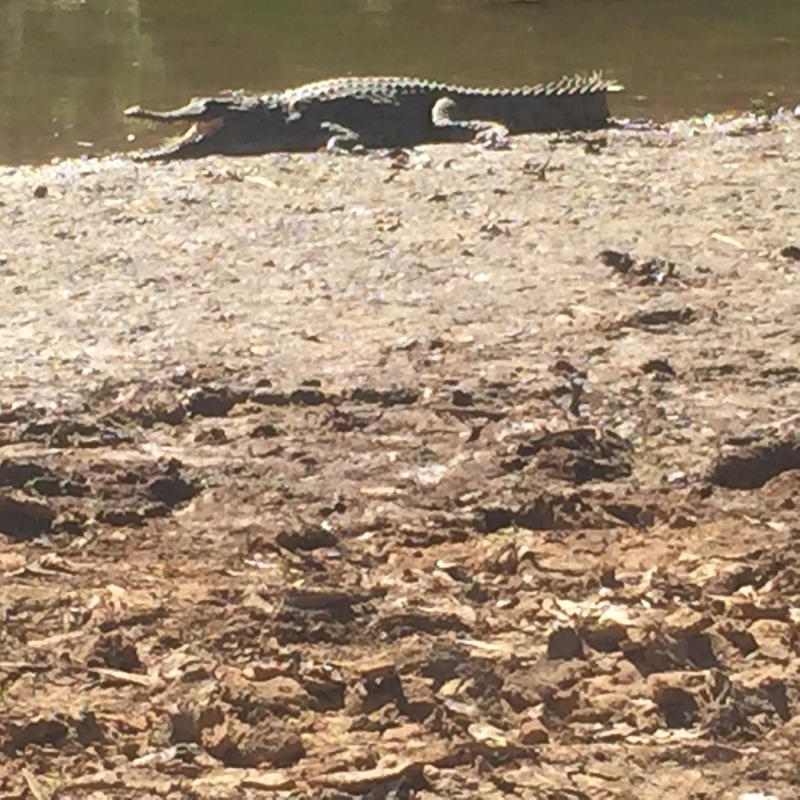 Further in the gorge you walk on a sandy creek bed and can get fairly close to the crocs. 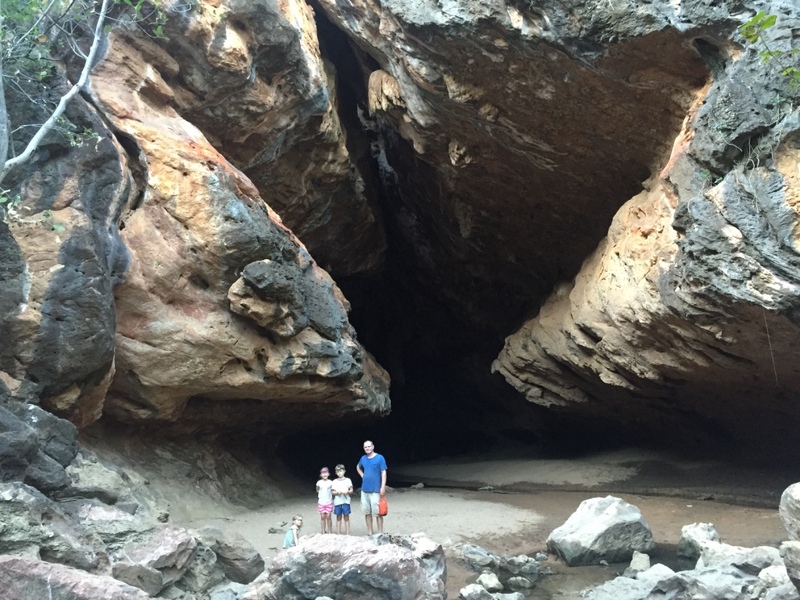 From Windjana Gorge we visited Tunnel Creek Cave which is a 750m limestone cave that runs under the Leopold Range. 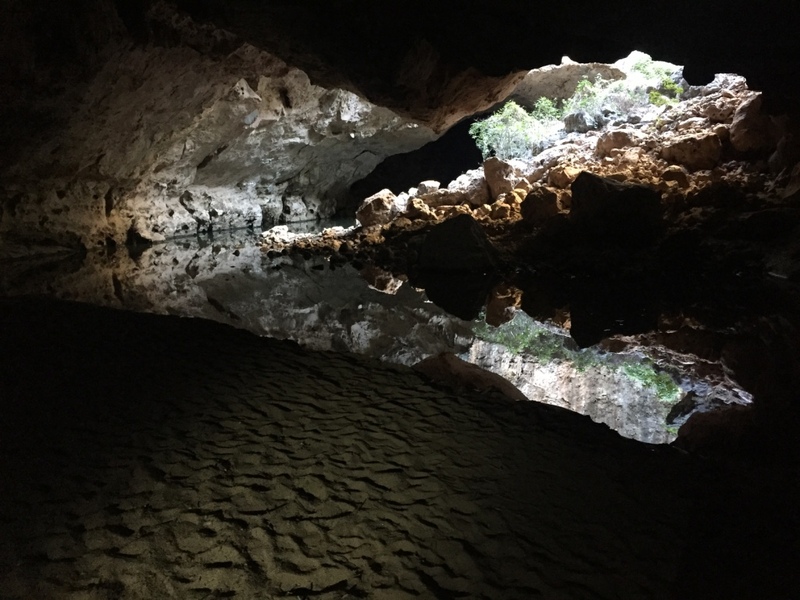 Walking through the cave involves wading through water in the cave in the dark. 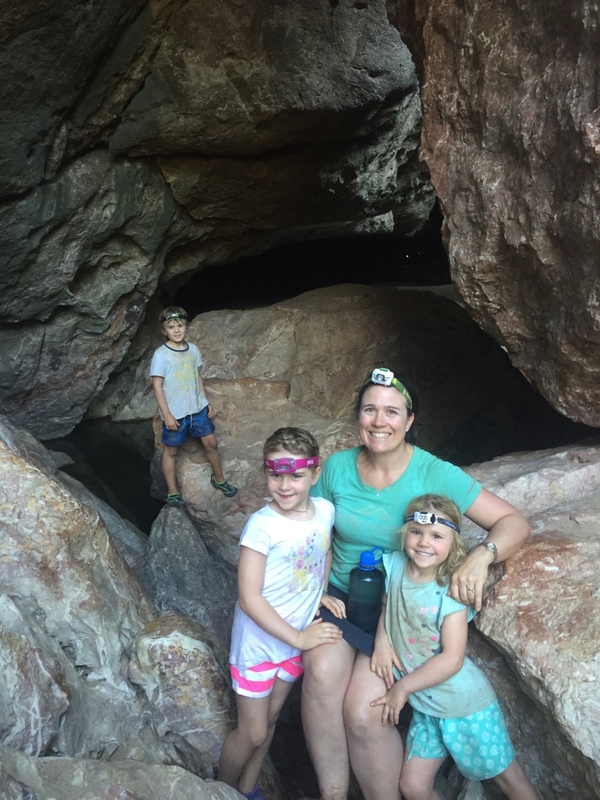 Equipped with our head torches (essential camping equipment) we headed into the cave. Aaron and Andrew loved this adventure the girls not quite as much. 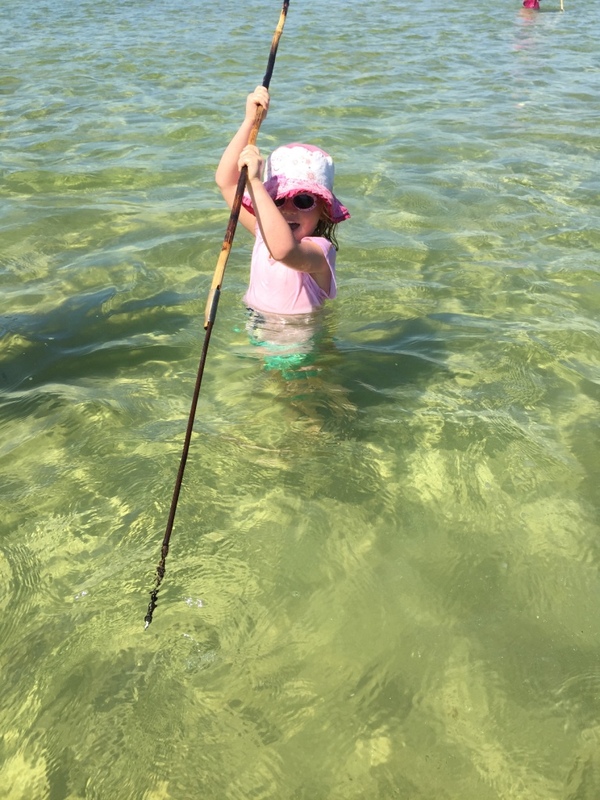 The water was 45cm at its deepest. 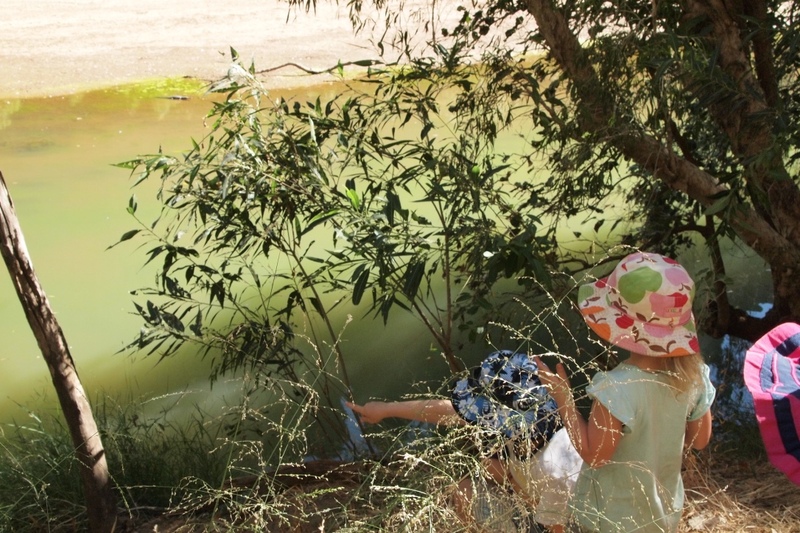 The sign at the tunnel entry said that the creek is inhabited by a few freshwater crocs. 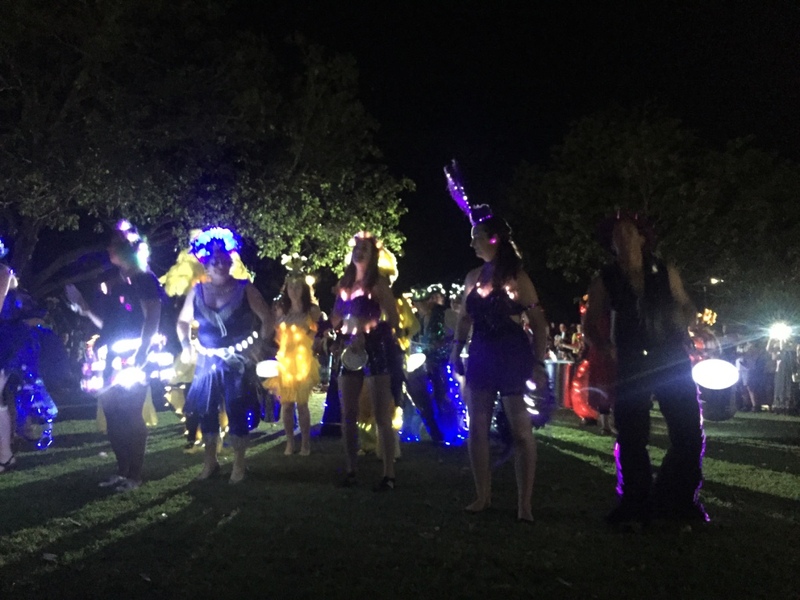 We used the head torches to navigate the dark tunnel and spot the crocs. 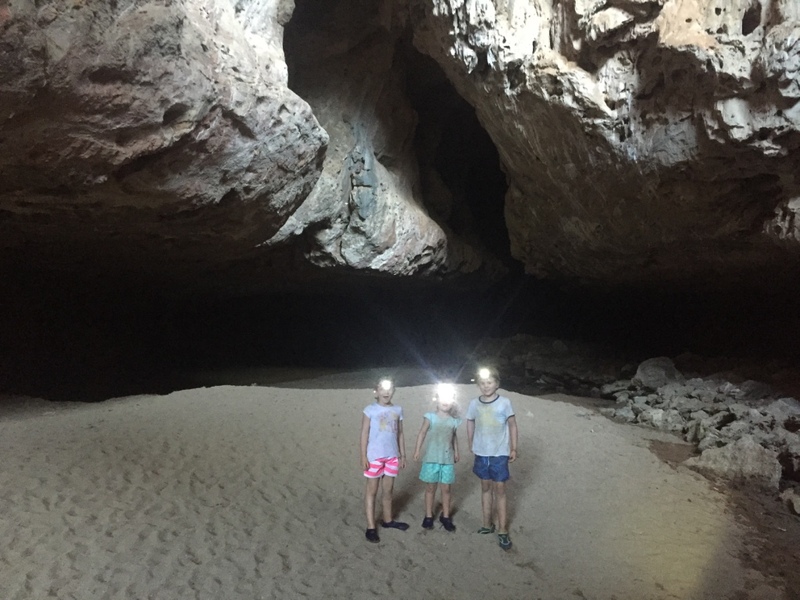 We spotted four freshwater crocs whilst walking thru the tunnel…a bit freaky but when we shined our torches on them they slid under the water…shy apparently! 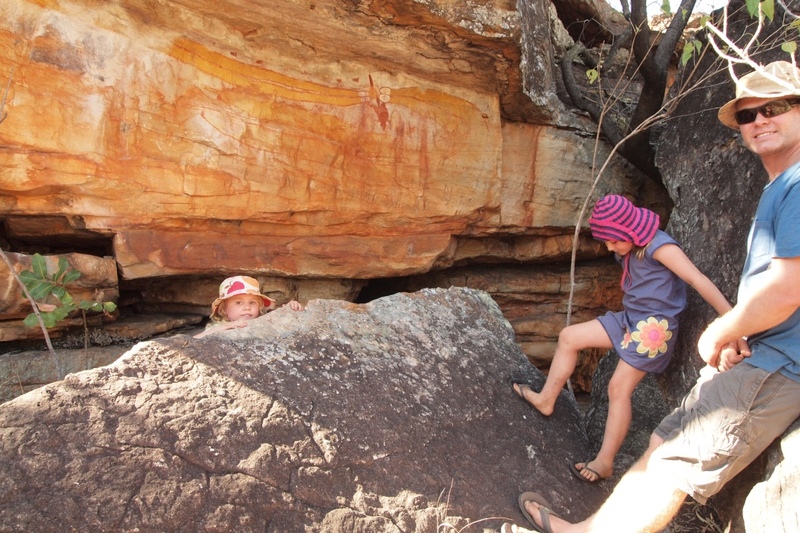 At the end of the Tunnel we spotted some ancient aboriginal rock art. 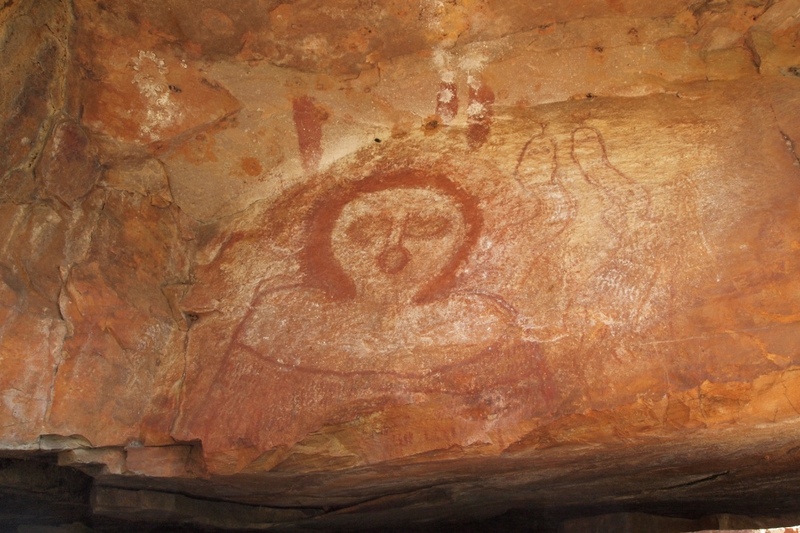 Tunnel Creek was also the hideout for Jandamarra a historic and sad story of an aboriginal man from the local Bunuba Tribe who used the tunnel to hide out from the police for three years. 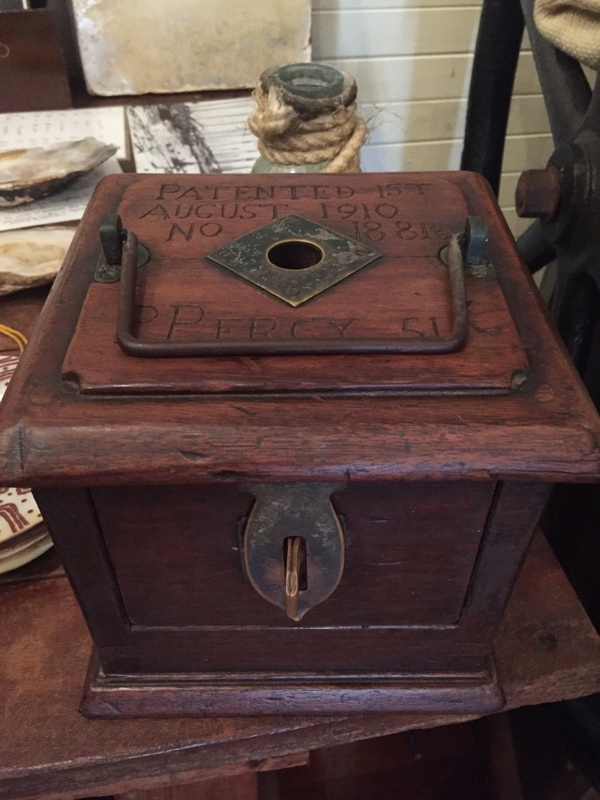 The story is sad because it describes the obvious lack of understanding between the new settlers and the indigenous communities in the 1890s. 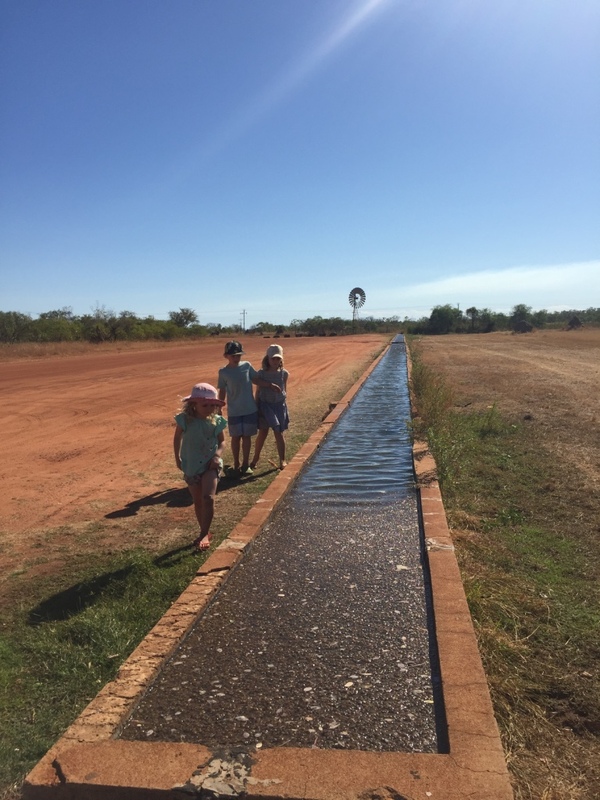 We loved our first stop on the Gibb River Road we were also pleasantly surprised to find flushing toilets and solar showers. 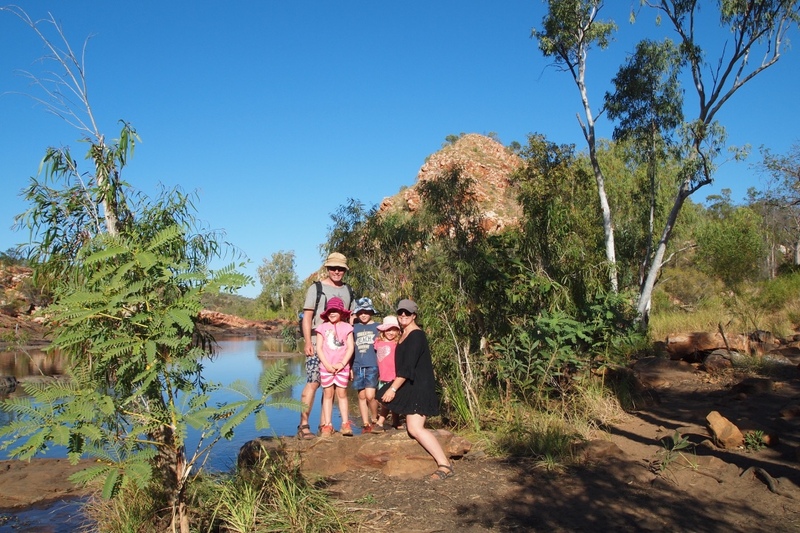 After two nights at Windjana we were ready to move on, whilst a lovely spot it was hot and there was nowhere to swim, so we planned to head along the Gibb River Road to the next spot where we might stop. 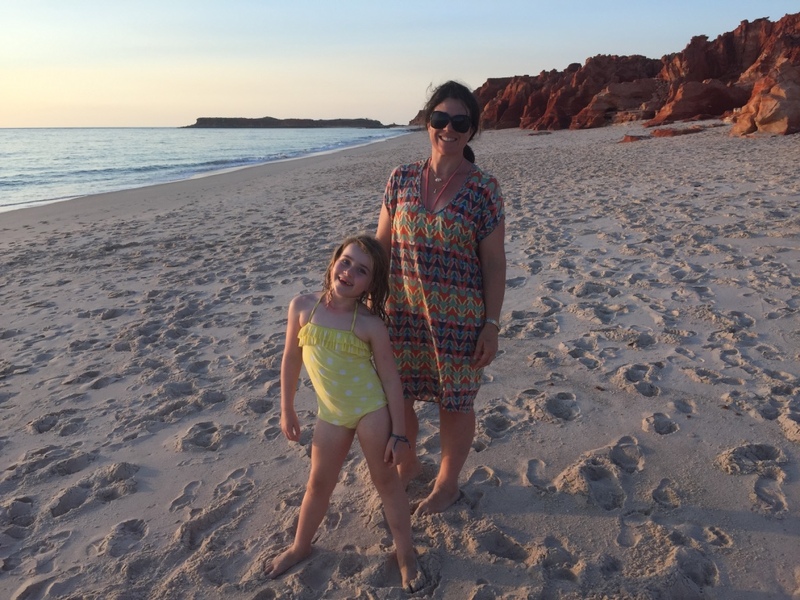 We decided to move north of Broome whilst we waited for my computer to be fixed and I was a little concerned that all the camp sites on Wiki Camps had signs with crocodiles on them! 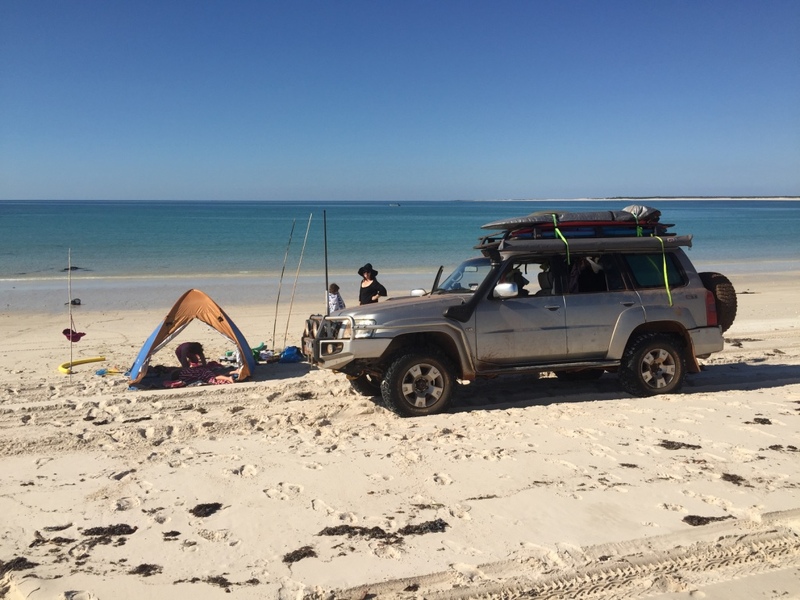 We followed the inside 4×4 track up the coast from Barred Creek up to Quandong Beach. The track became very sandy and we had to stop and let down the tyres to avoid getting bogged but it was a nice drive thru the sand dunes with the coast on our left. 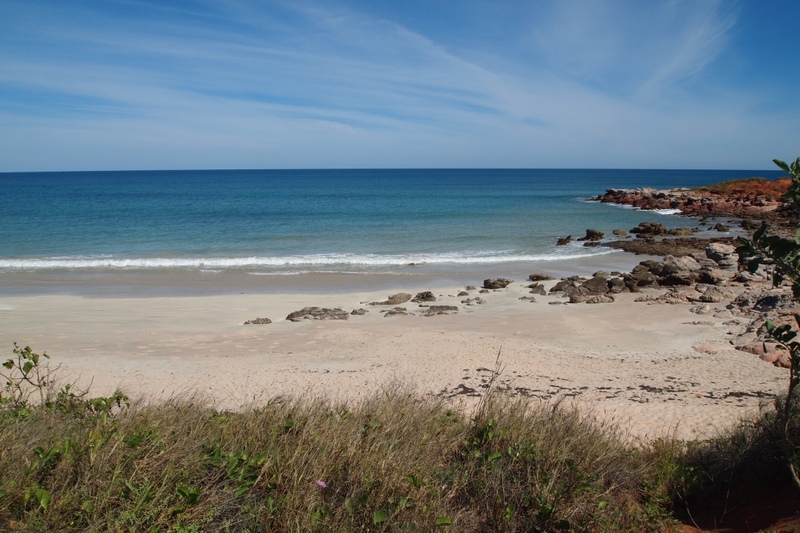 The point has the same big 10 metre tides that Broome and 80 Mile beach have and it was amazing each day to see the rocks appear and disappear as the tide came in and out. 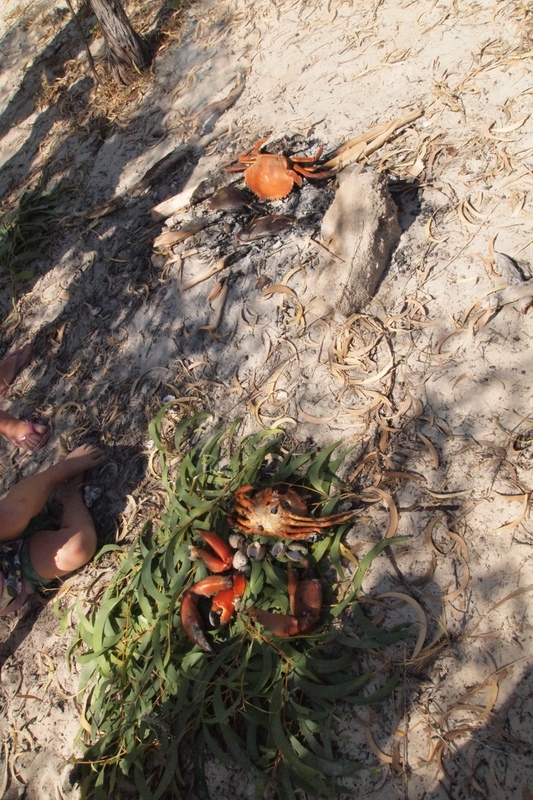 A couple camped near us went out collecting rock oysters off the rocks and we came along to try them. Aaron and Holly both considered it but wouldn’t eat one in the end. I enjoyed the sweet salty taste…I love oysters. We were allowed a fire here at Quandong the first camp since we left South Australia so we took advantage got the camp oven out and cooked roast pork with all the trimmings, baked potatoes, baked apples, peas and gravy. 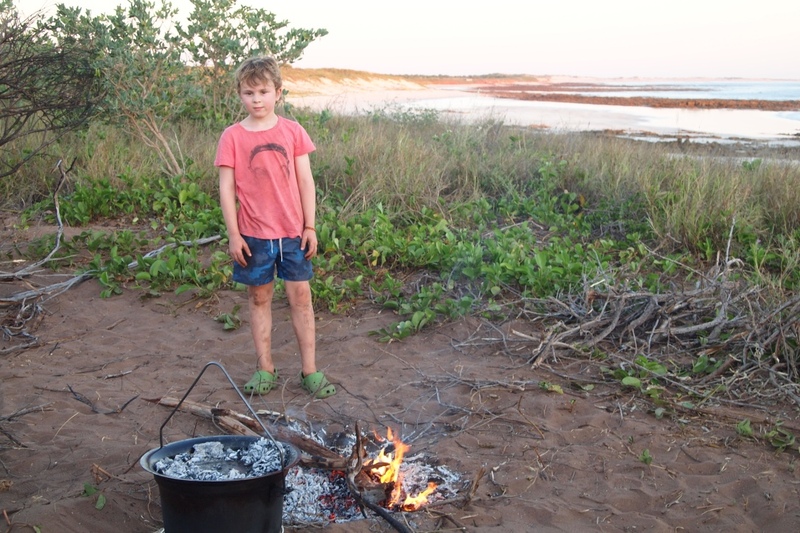 We also had our fill of toasted marsh mellows and enjoyed camp fires each night. 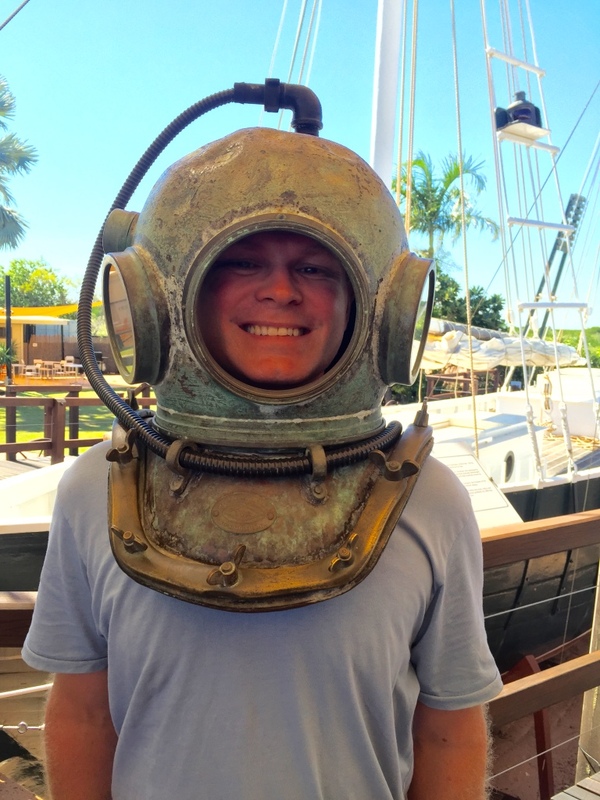 We again tried our luck at fishing without any success…but Aaron and I are not giving up yet. 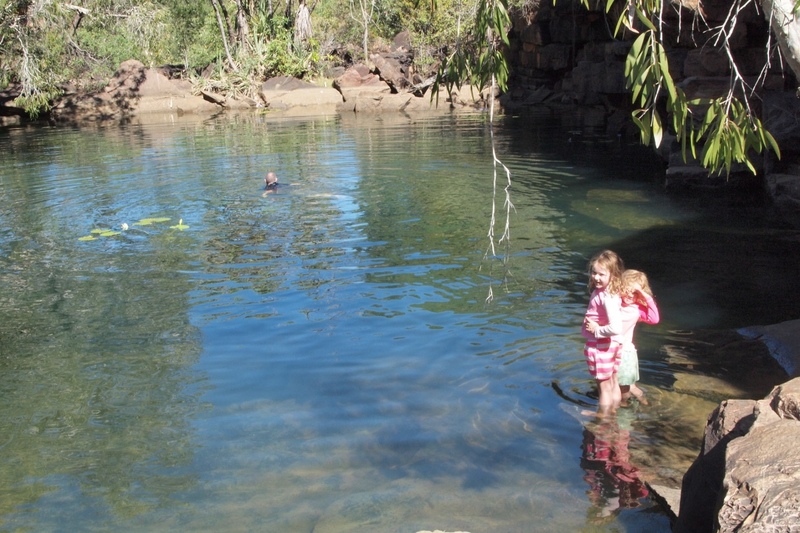 We enjoyed brief swims when the tide was in and we could see thru the clear water to check for crocodiles. 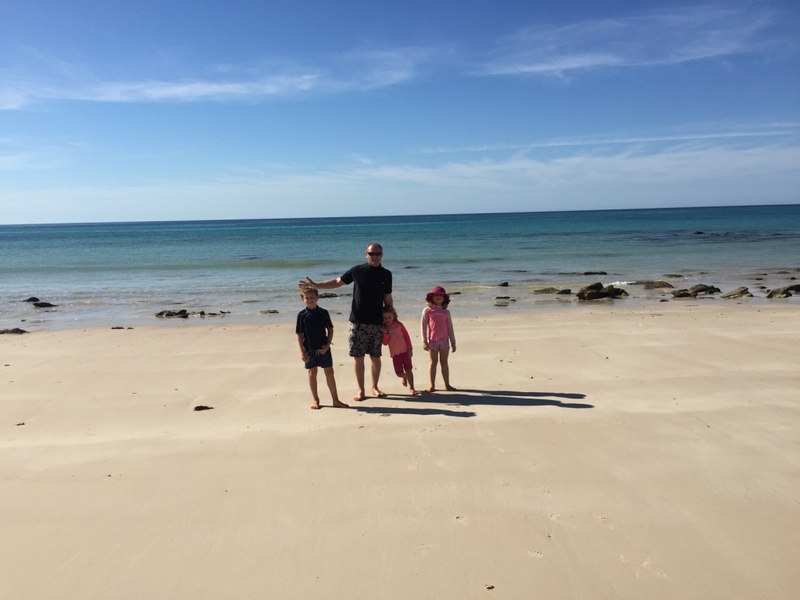 Andrew and the children spotted some turtles swimming near the shore and watched them bopping up and down but due to crocodile risk snorkeling was out of the question. 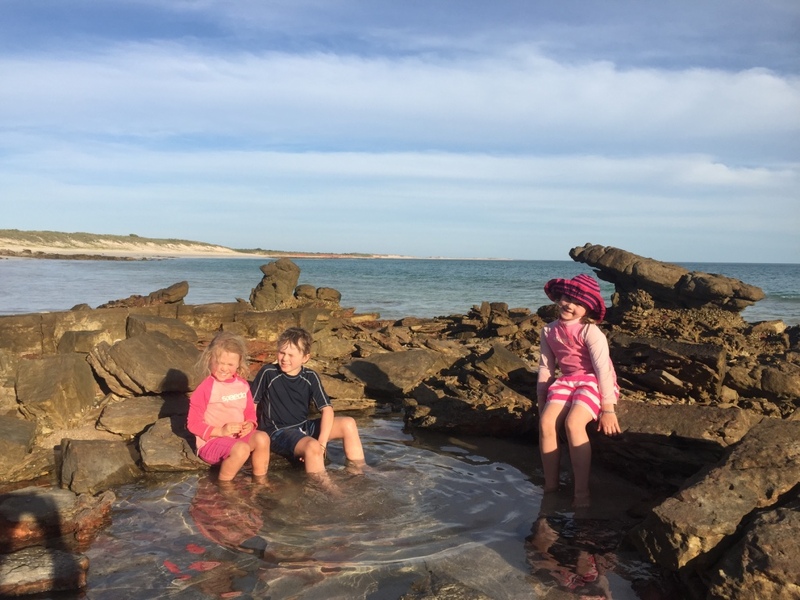 When the tide went out we enjoyed looking for sea creatures and paddling in the rock pools. 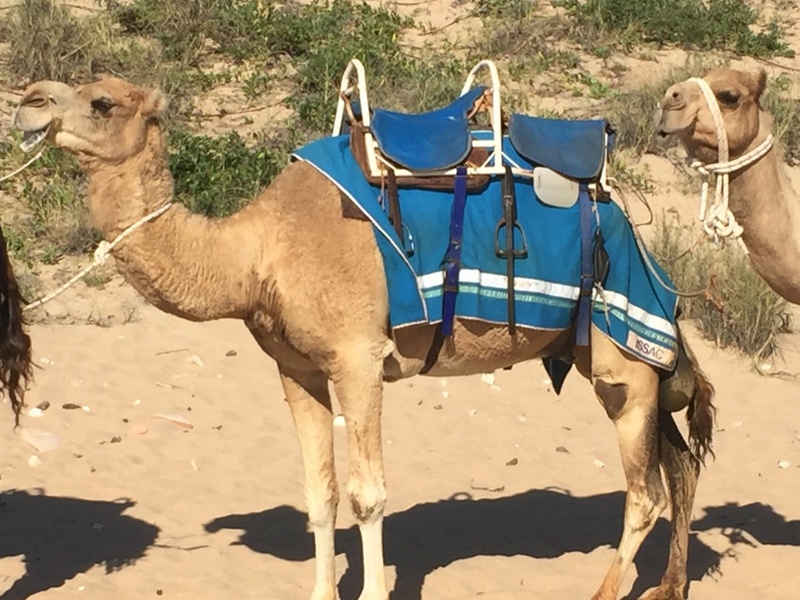 After four nights we got a message that the part for the computer had arrived from Sydney so we headed back to Broome. On the way into town we noted a sign that said no swimming on the beaches where we had just been. 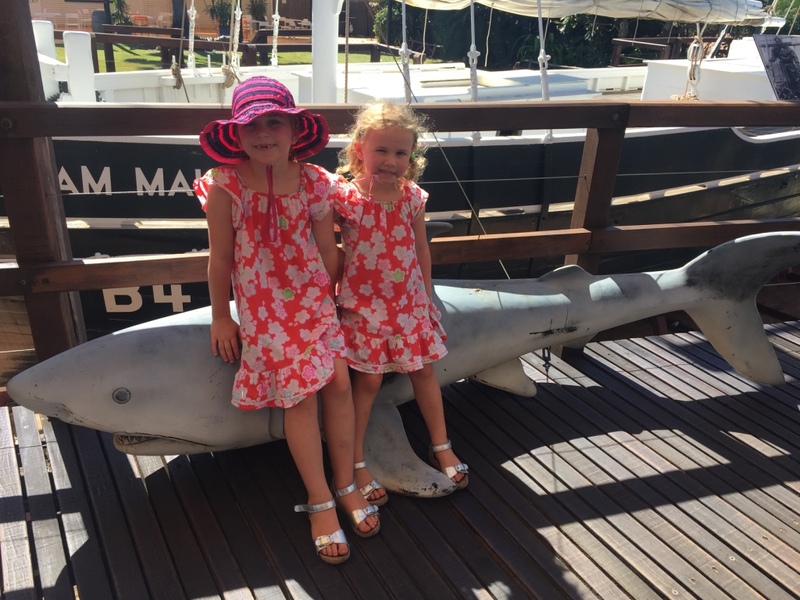 As novice travellers into the Northern waters we will now be a little more cautious …we will be watch out for future warning signs to avoid swimming with the wildlife! 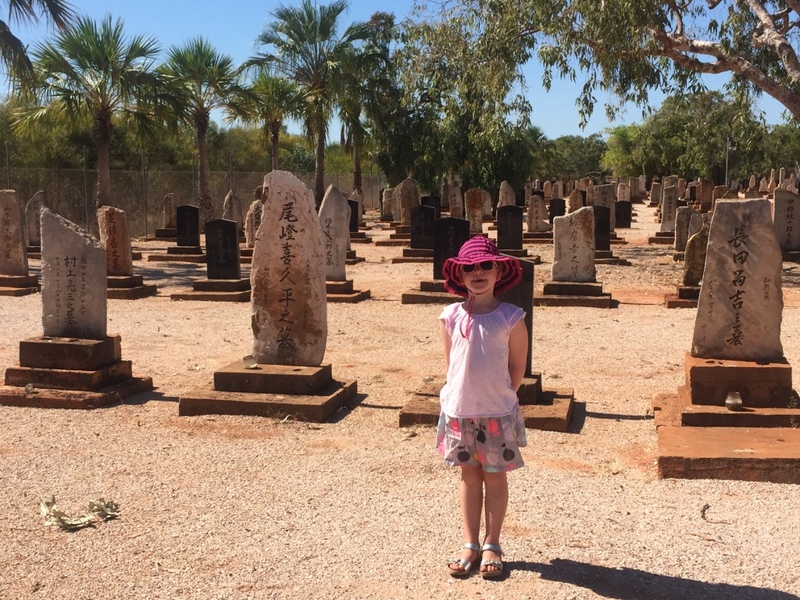 After being on the he tourist trail we were happy to stop for a while and catch up on some school work and relax a bit before heading along the Gibb River Road. 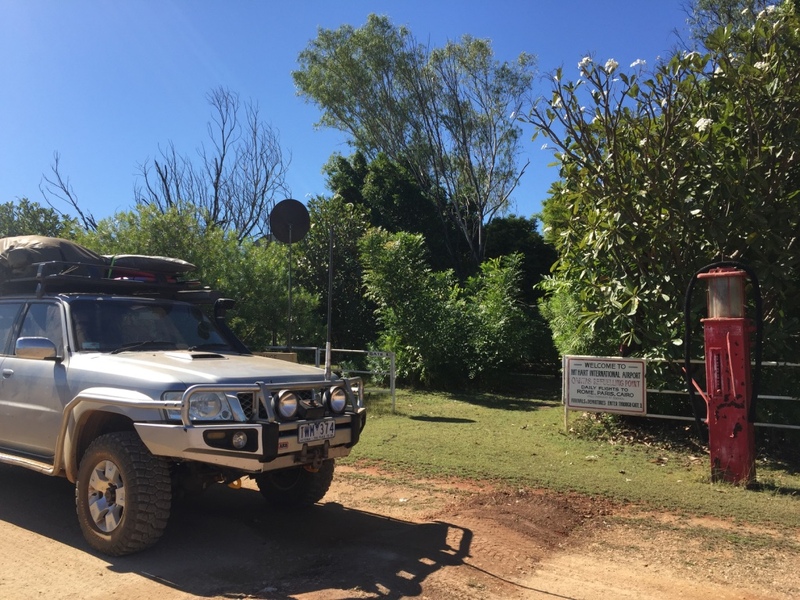 We left Quandong and headed to Broome to collect the computer and start the next part of the journey. 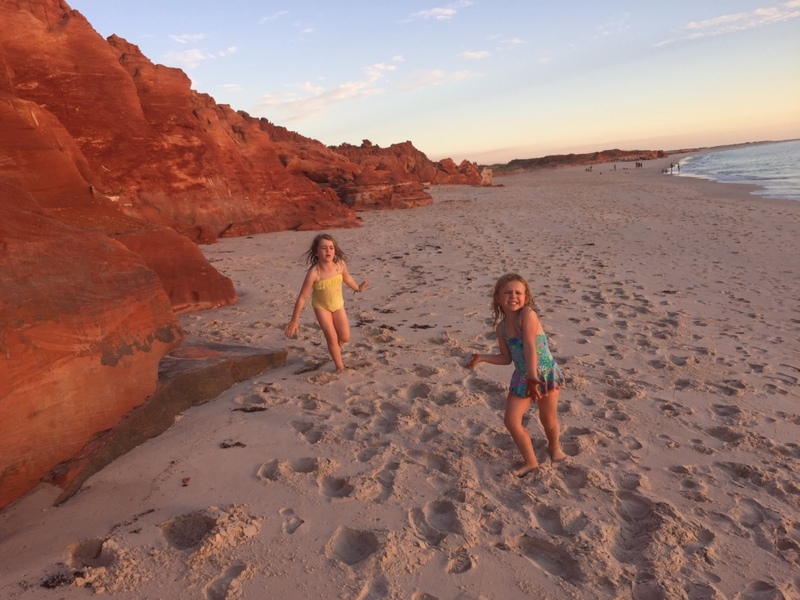 We are excited about the next part of the journey although we are a bit sad to be leaving the Western Australian coast and heading east…almost on the way home. 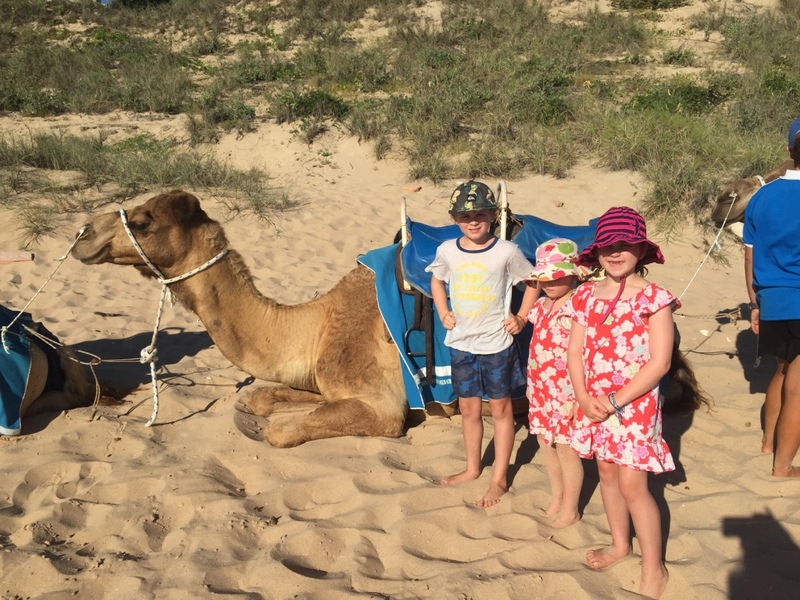 We returned to Broome and the Cable Beach Caravan Park to meet up with my parents and the kids were very excited to see their Grandparents. 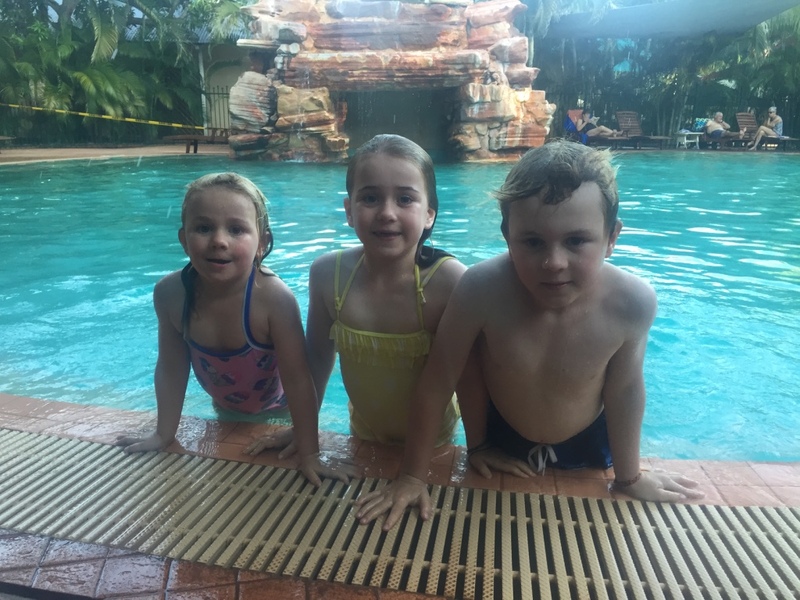 We spent the next few days catching up with the Grandparents and the children enjoyed being spoiled as usual by Grandma and swimming in the pool. 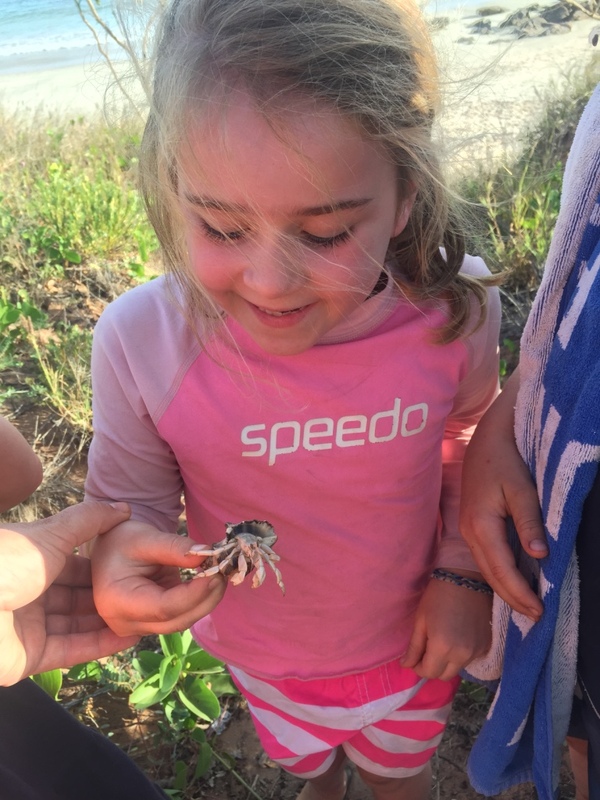 Bianca started swimming without her safety vest…growing up. 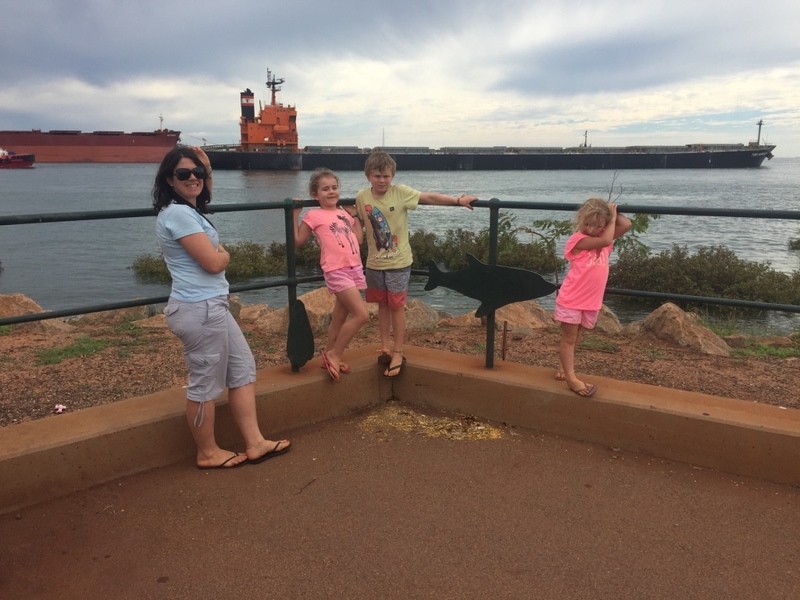 We did a ‘pearl luggers tour’ and got the history of Broome which was built on the trade of buttons in the late 1890s and early 1900s. 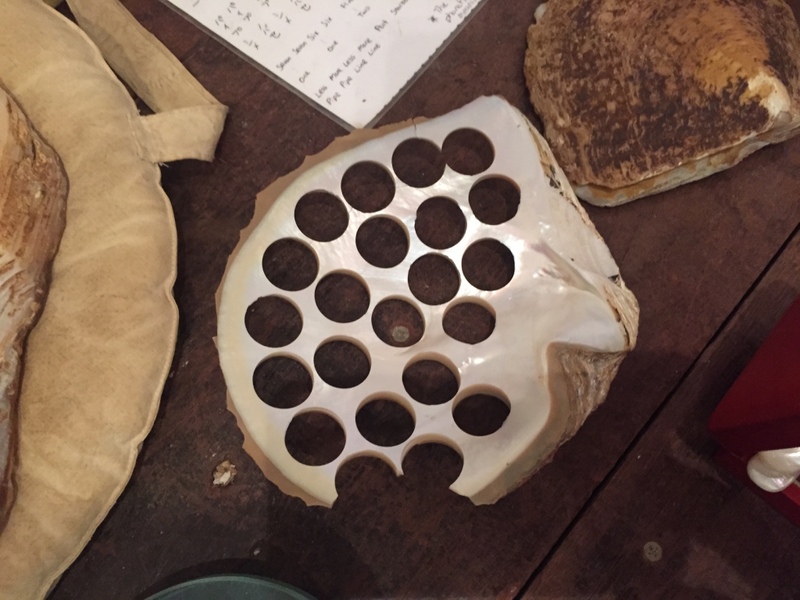 The history of diving for the pictada maxima mother of pearl shells which were exported over the world for the production of buttons before the invention of plastic buttons. 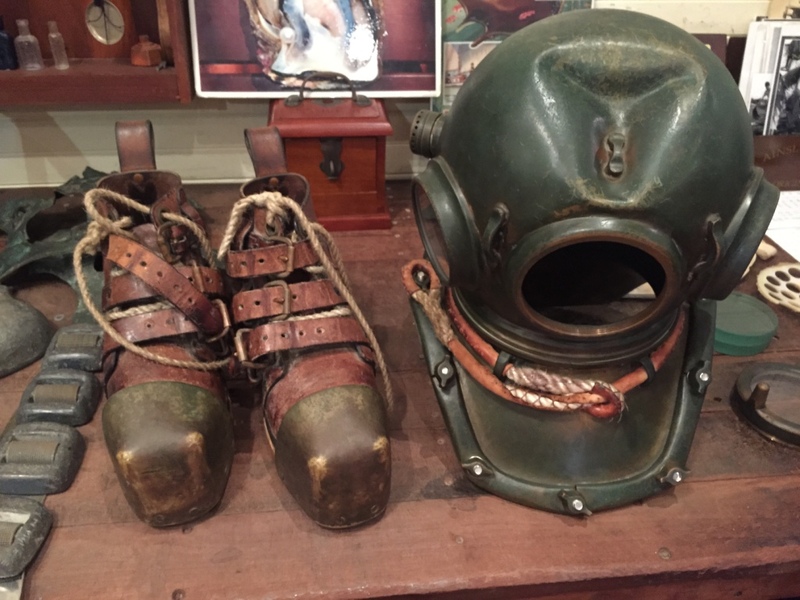 Broome had many divers from Japan using the new iron helmets and diving. Many divers died from the bends or drowned little was know about diving and the impact on the human body and we visited the Japanese cemetery where there are nearly a 1000 old graves. 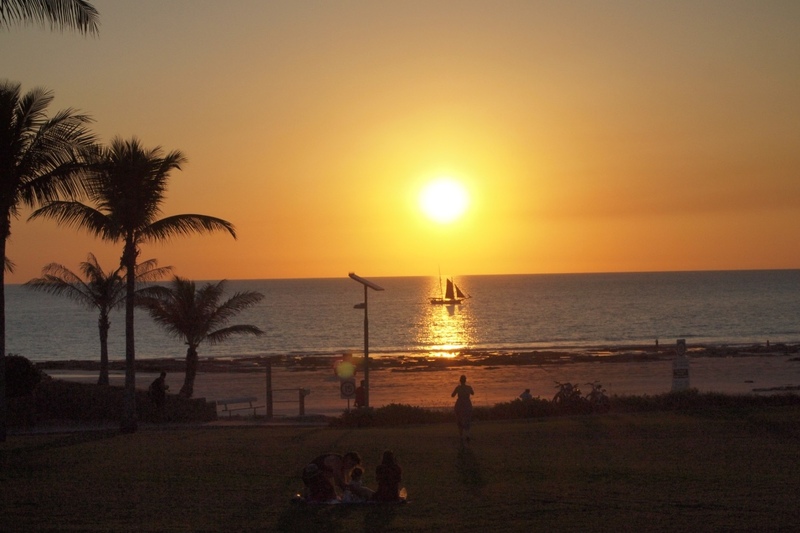 After the down turn in pearl shell the cultured pearl industry then took over and is one of the main industries in Broome today apart from Tourism. 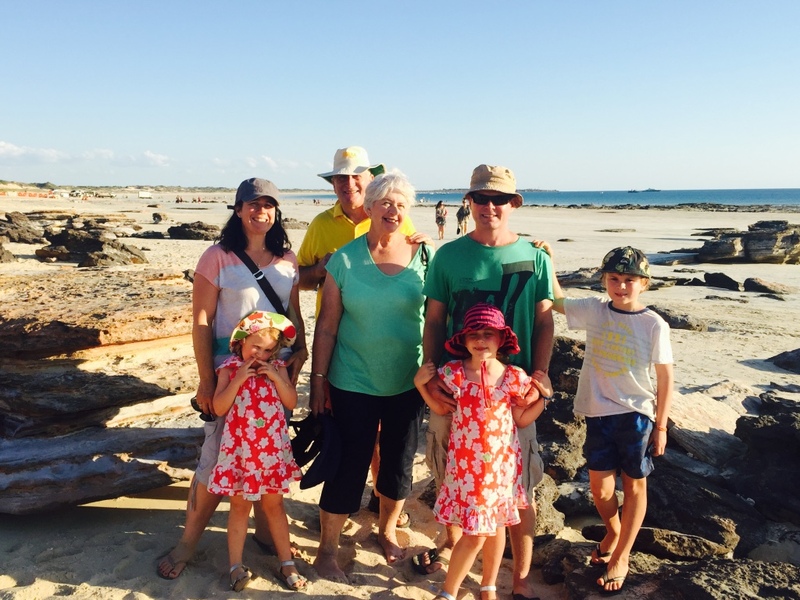 We all enjoyed eating out and catching up with Grandma and Grandpa and the sunset views over cable beach. 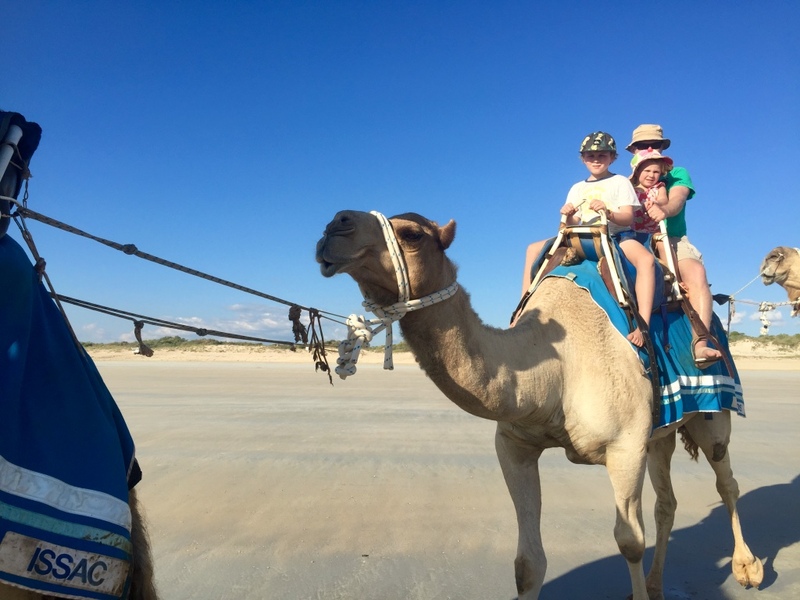 There have been camel rides on Cable Beach Broome for over twenty years and we followed the tourist trail and went on an afternoon camel ride which was an experience we all enjoyed! They are funny creatures Andrew, Aaron and Biancas camel ‘Amos’ made a lot of loud noise as they got on and then he tried to bite me as Holly and I got on our Camel ‘Issac’ who rather looked like he was old and tired of camel rides and needed a bottle of water poured on his head to get him to stand up…they assured us this was okay…all part of the fun. 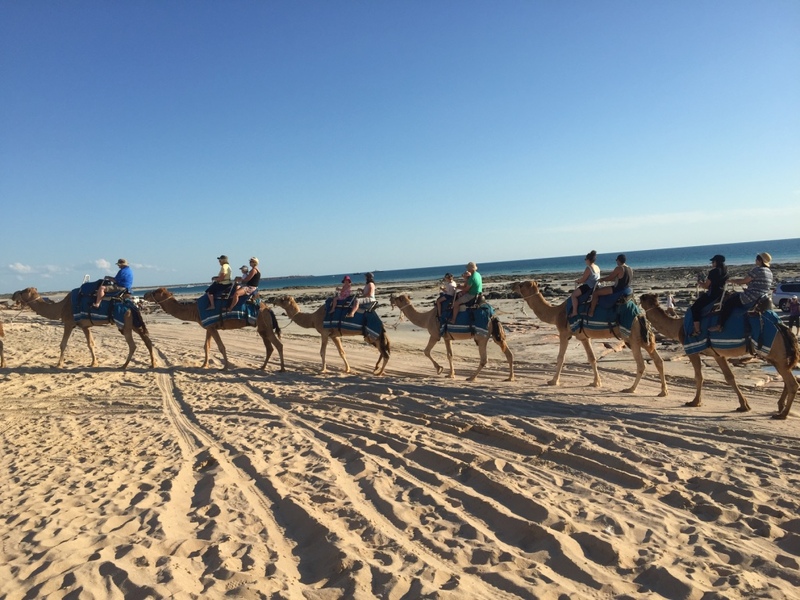 The camels walk approx 30km a day from the farm and along Cable Beach but this is not too far for a camel. Thankfully we only opted for the half hour ride as both Andrew and I were glad to get off the rather uncomfortable saddles. 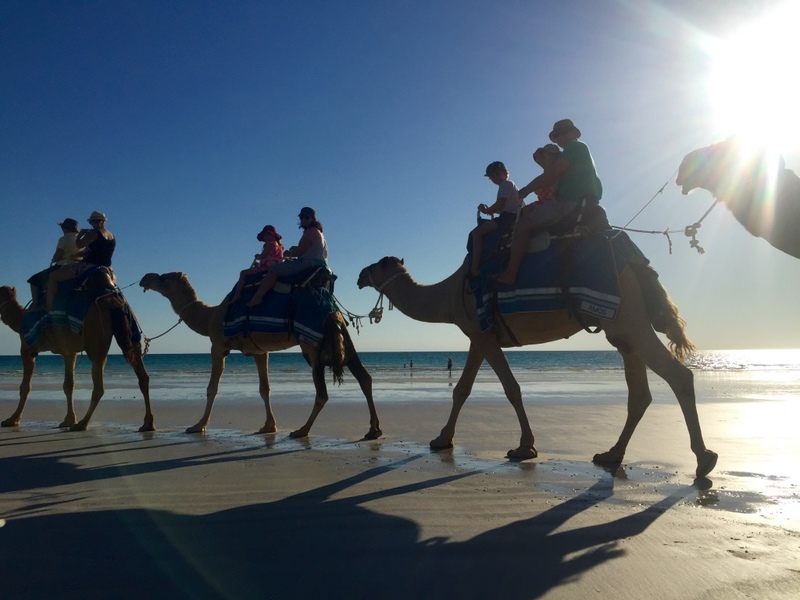 Camel rides in Broome…definitely a once in a life time! 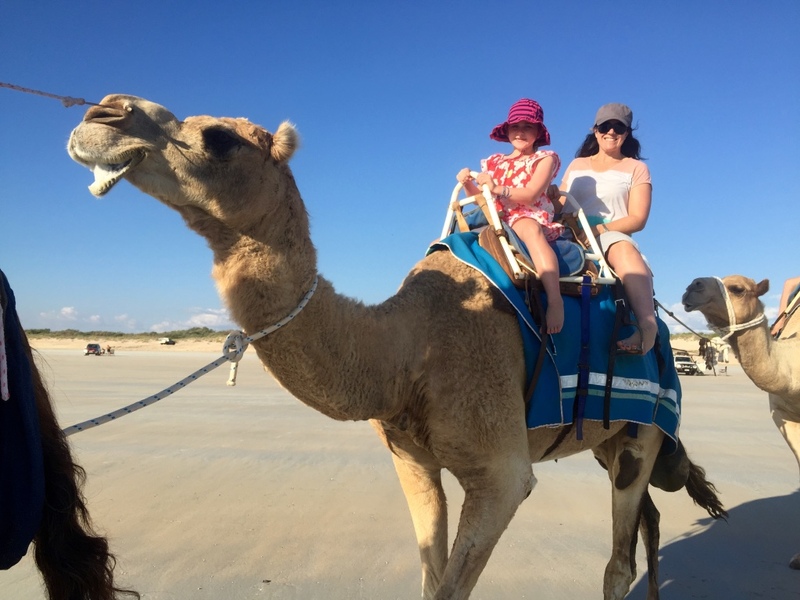 Meeting a camel…this one was friendly to pat. 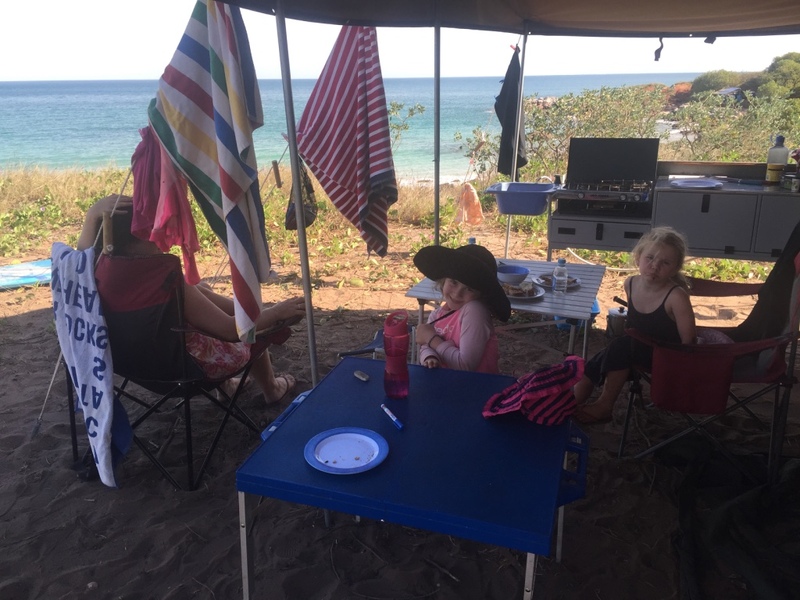 The children had a two nights sleep over with Grandma and Grandpa in the air conditioning, something we don’t have in the tent! They enjoyed some TV and quality time with the Grandparents and Andrew and I enjoyed a couple of sleep ins and nights alone. A welcome break after 9 weeks. 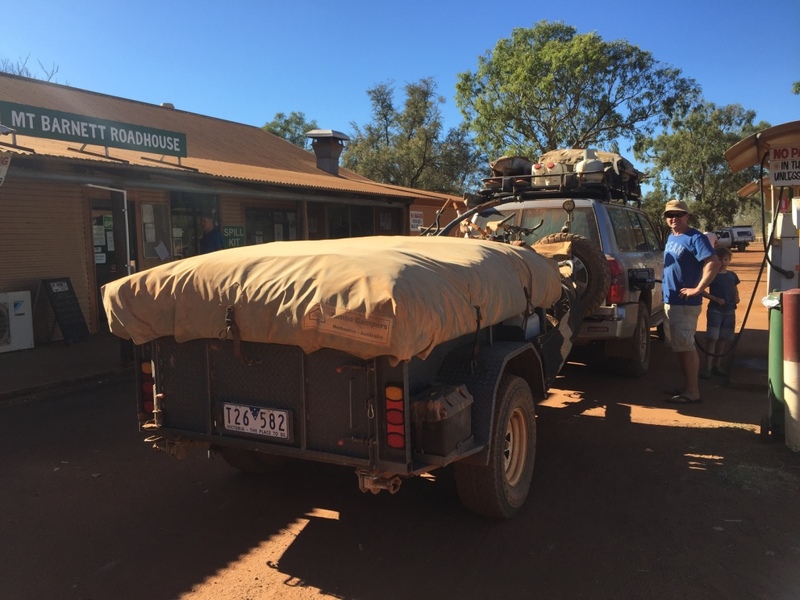 Broome is almost our half way mark and we had the car booked in for a 10,000km service during our stay. 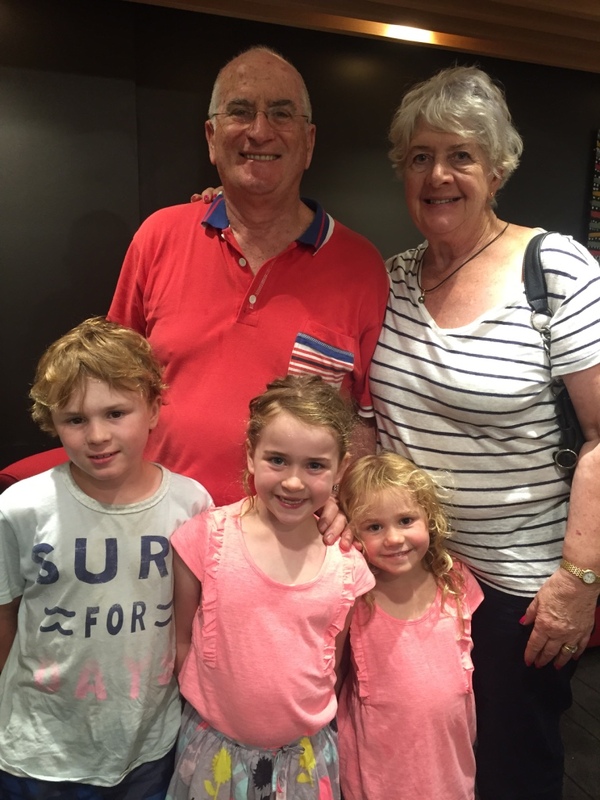 Sadly after four days we said goodbye to Grandma and Grandpa as they flew back to Perth to visit with our cousins. 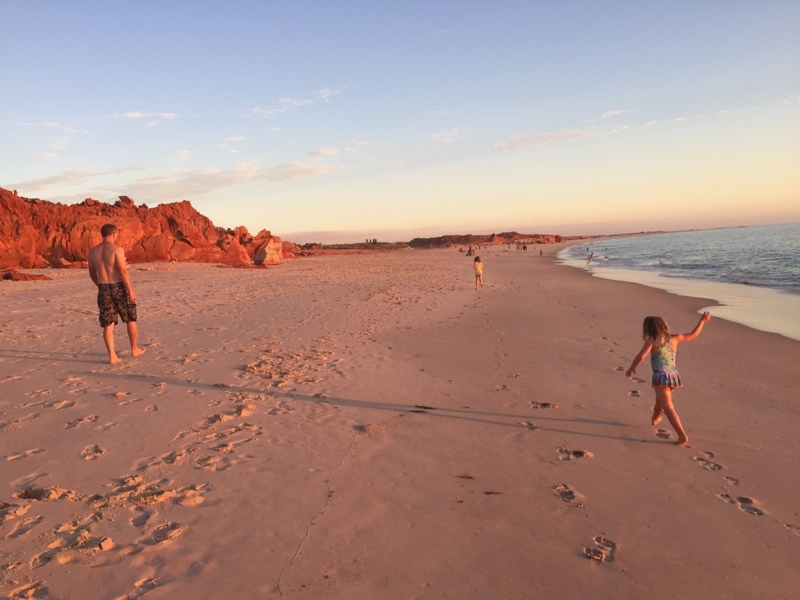 We stayed in Broome for another couple of nights to see the staircase to the moon. 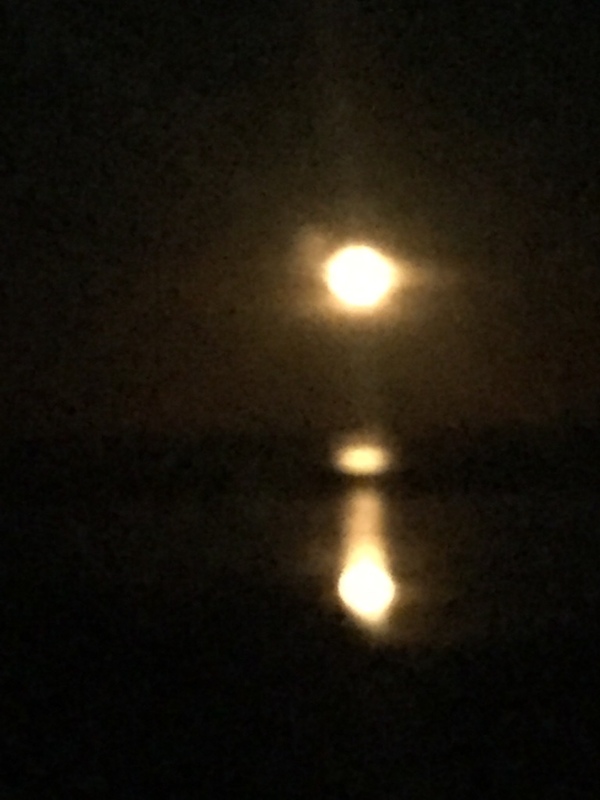 The Staircase to the moon is a phenomena that occurs with a full moon each month and the light shining on the mud flats which looks like a staircase up to the moon. There are great markets with food and tourist items for sale. 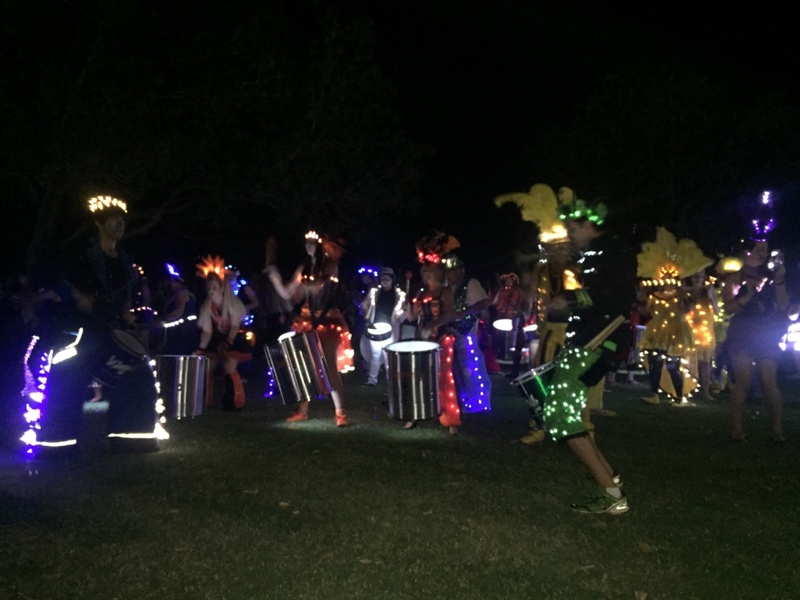 On the night we were there a great drumming group from Freemantle arrived and we enjoyed listening and watching them in their lights dancing around. Whilst in Broom we had issues with our computer and it turned out we had a melt down literally. Due to the battery in the Apple mac over heating the the computer had not been operating correctly and needed major repairs. 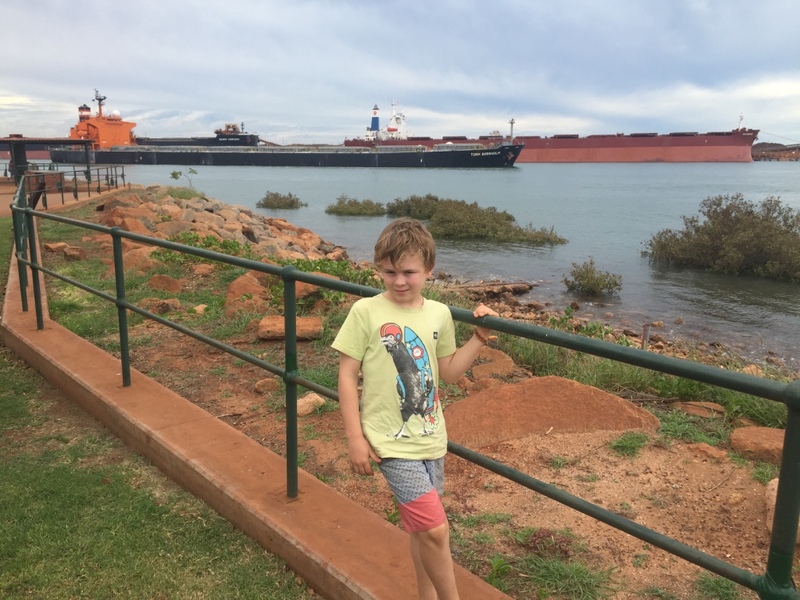 The part was ordered from Sydney and would take 3-5 days to arrive.so we headed up the coast and planned to return when the computer was fixed. 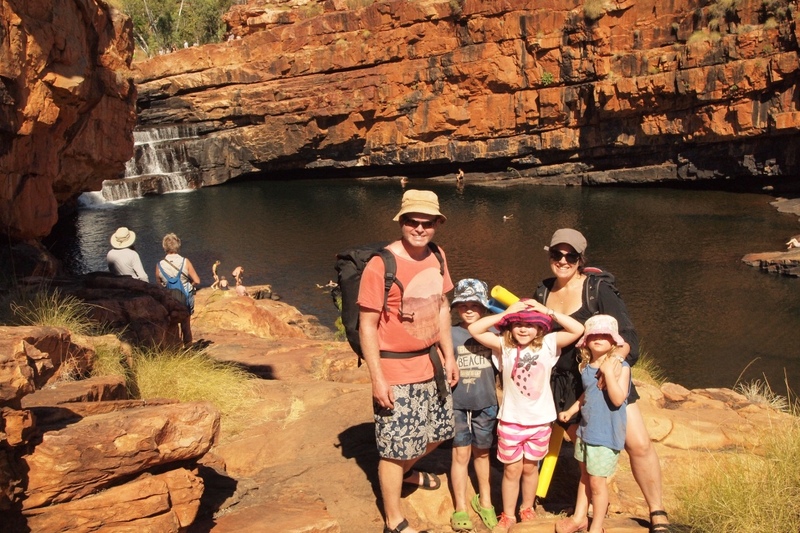 In Broome and we caught up with the two Victorian families we had met in Karijini again and the kids all had a ball in the caravan park swimming pool. 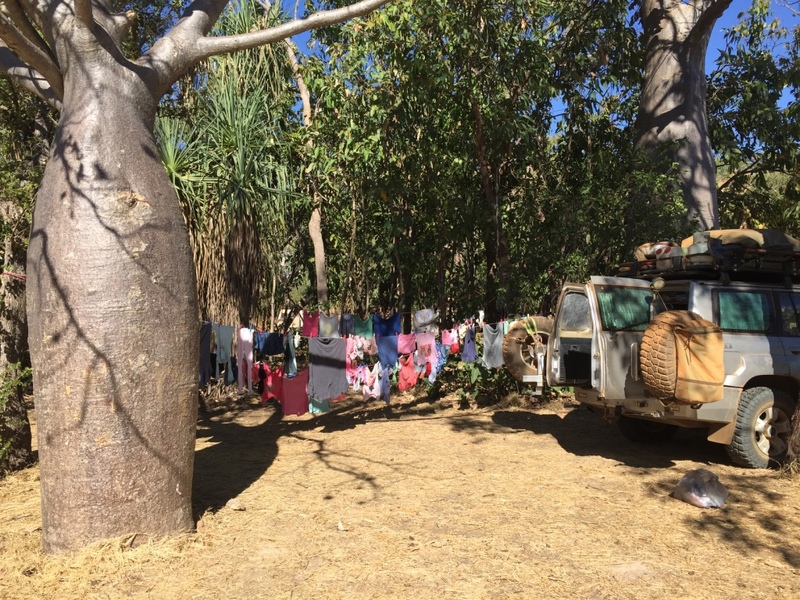 After a couple of nights hear, several loads of washing and a restock of supplies we headed out to Cape Leveque on the Dampier Peninsula. 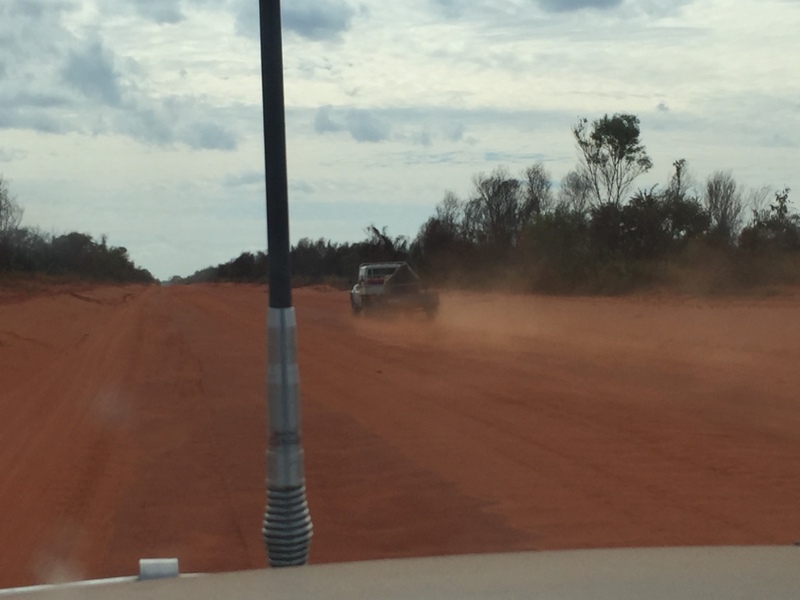 We were told the road into Cape Leveque was very rough and for 4×4 only. It was corregatedin parts, sandy and quite dusty we thought it was actually a pretty good road. 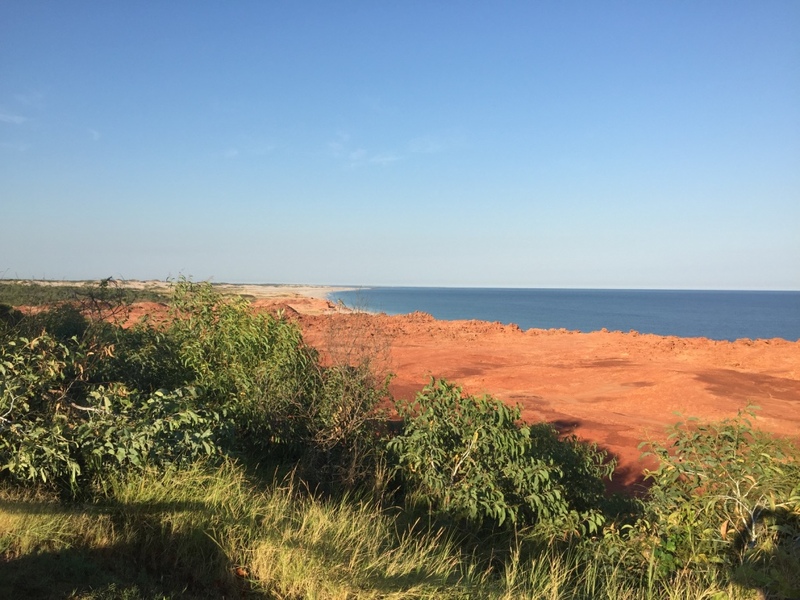 There is only 80km of unsealed road between Broome and Cape Leveque which was strange and the various communities have bitumen – it won’t be long before it is sealed all the way out. 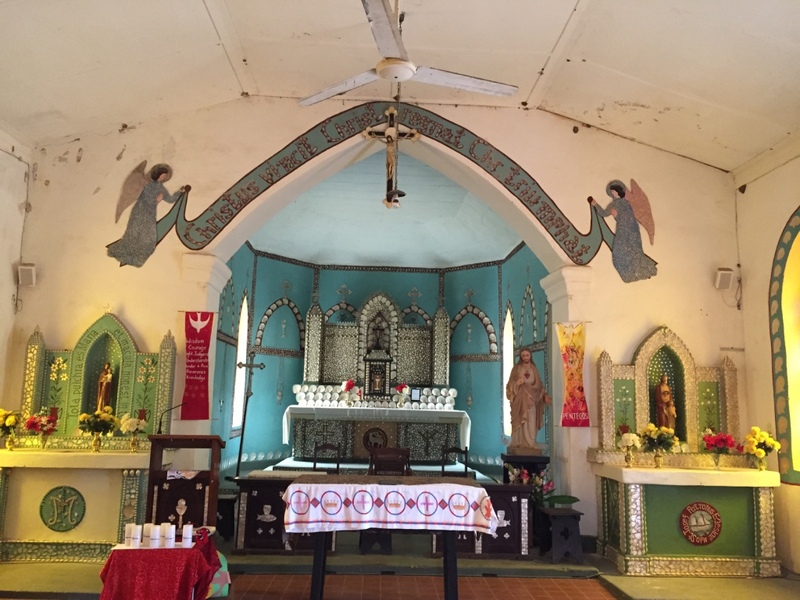 On the way up the peninsula we visited Beagle Bay where a Catholic mission was once situated and there is a beautiful old church built in 1917 and Intricately decorated with mother of pearl shell. 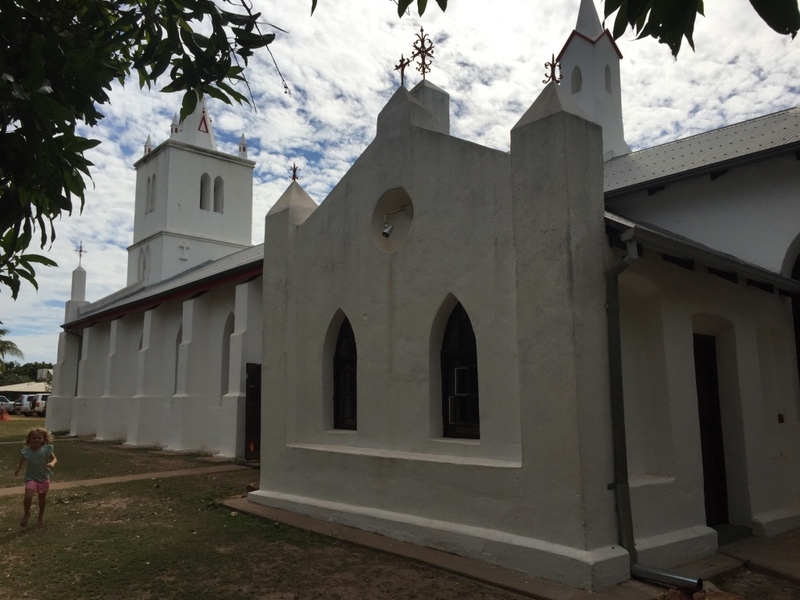 The Sacred Heart Church is still used by the community and the church is still providing education on the peninsula. 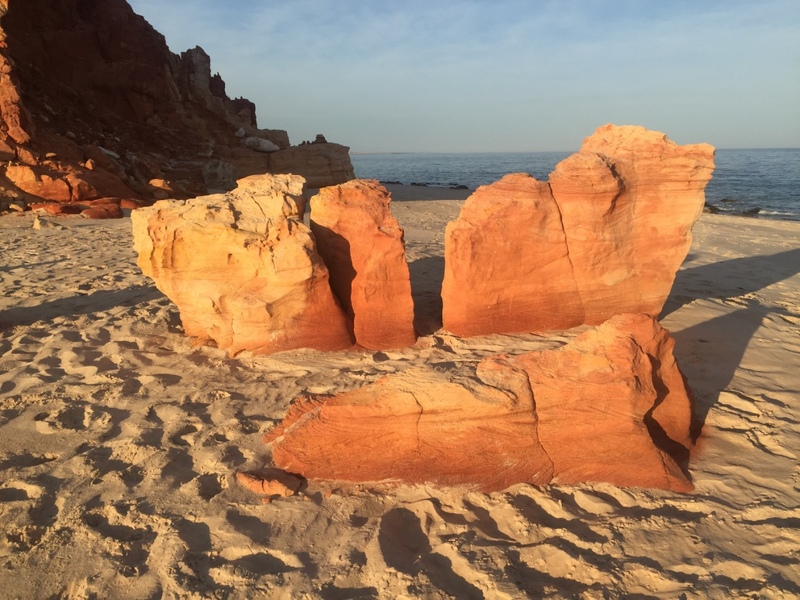 Cape Leveque is aboriginal land held under native title and there are a number of aboriginal communities on the peninsula. 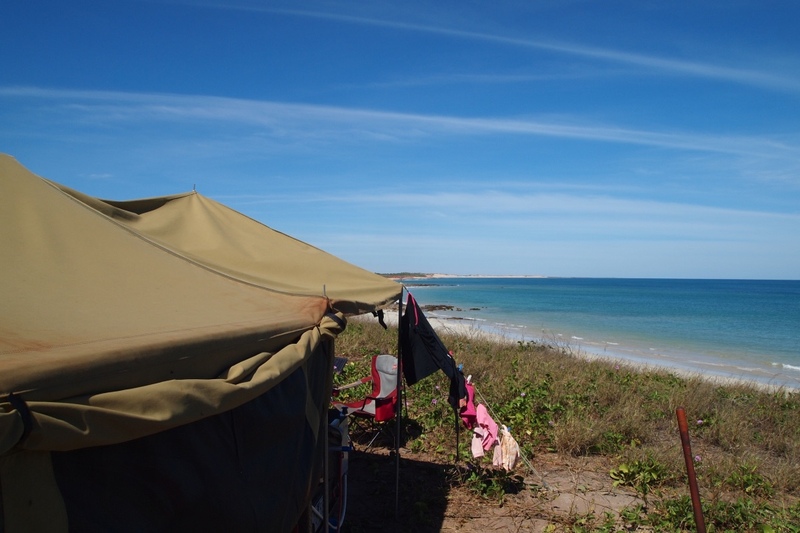 We chose to stay at Kooljaman community at the point and we booked a camp with water views over the Western Beach. 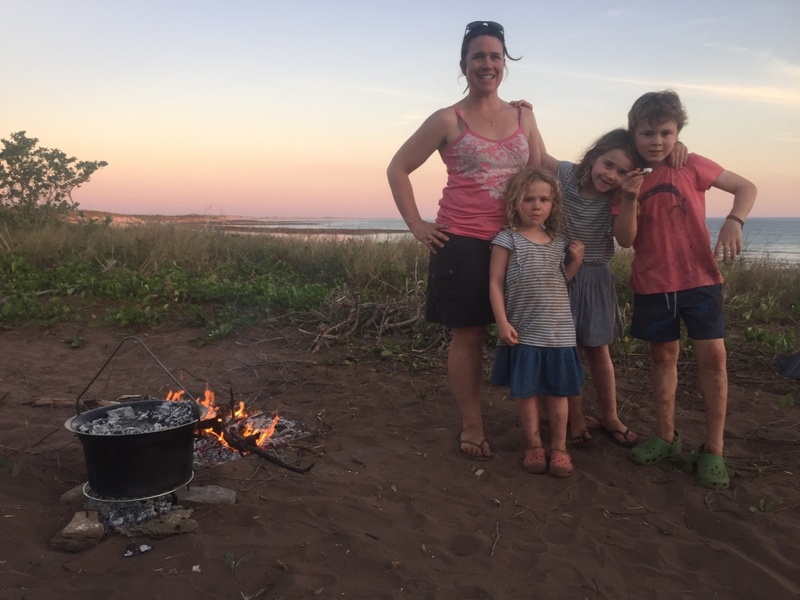 We weren’t disappointed by the views of the beautiful western sunsets but the camp is set up above the beach on the red sandstone cliffs a distance from the ocean. 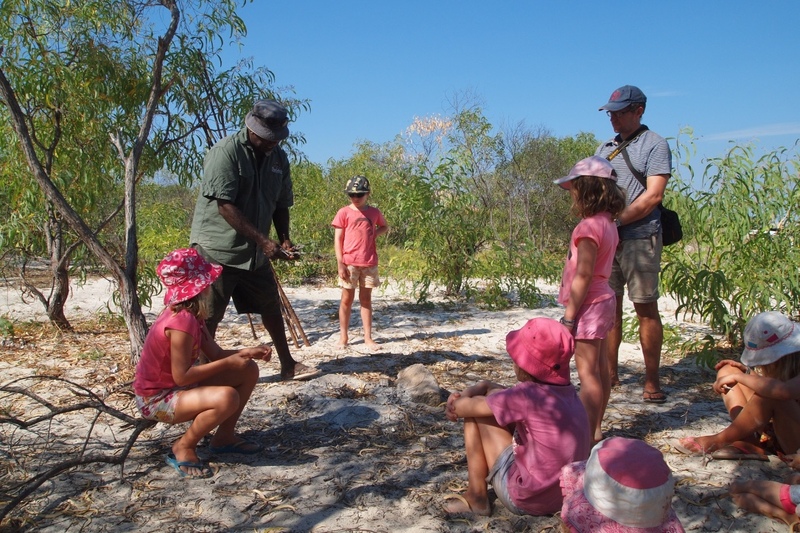 At Cape Leveque we went on a cultural tour with Bundy one of the Bardi People elders from Lombadina Aboriginal Community part of the Djarindjin Community. 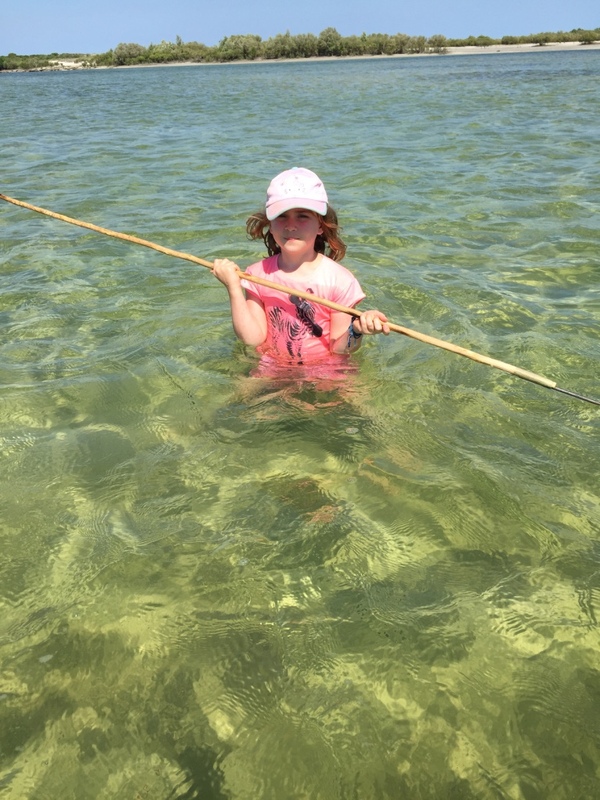 The tour was a spear making and spear fishing tour this was the traditional method of catching fish in the area and fish was the main diet for the Bardi People. 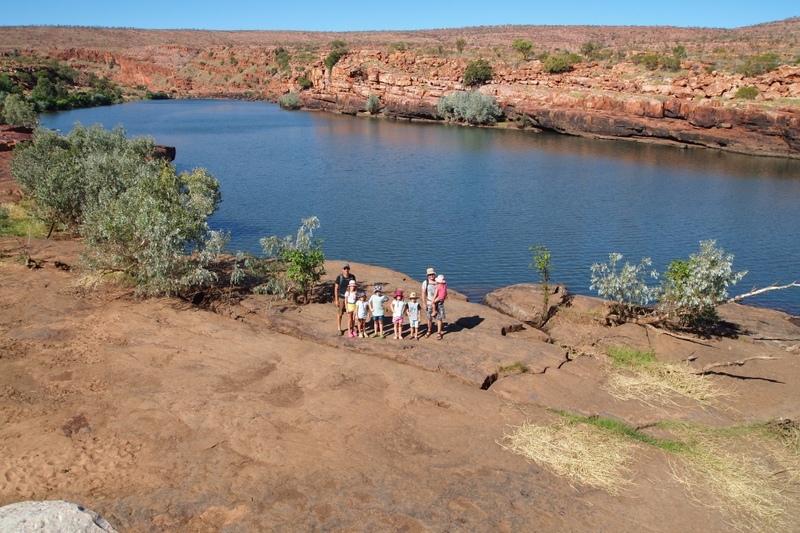 The family from Brunswick and another family were also on our tour which meant there were five adults and eight children on the tour plus a group of young aboriginal boys who came along for the fun. 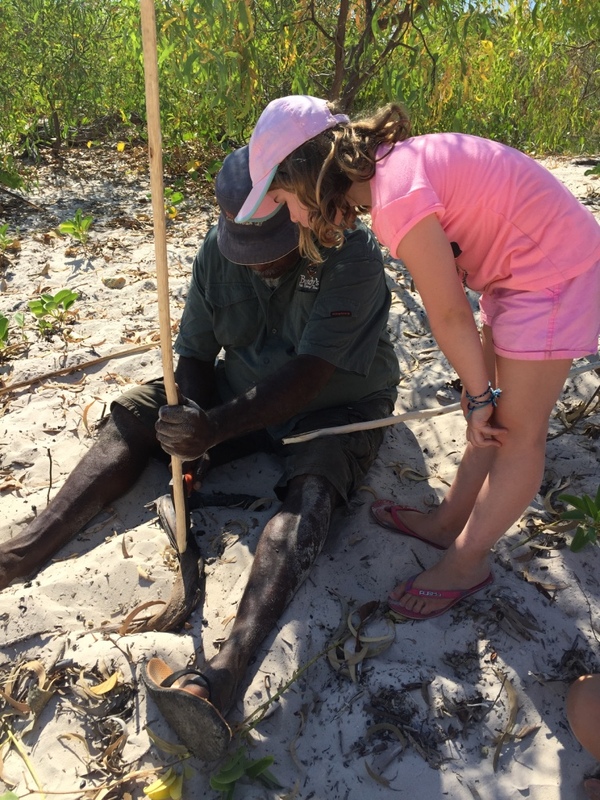 Bundy shared with us some of his peoples’ aboriginal dreamtime stories about the local water source. 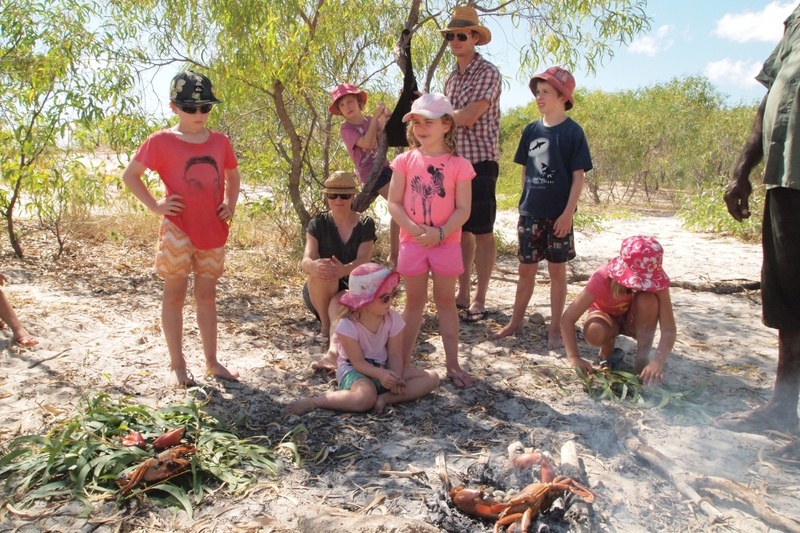 Bundy told us about how his people lived on this peninsula thousands of years ago. 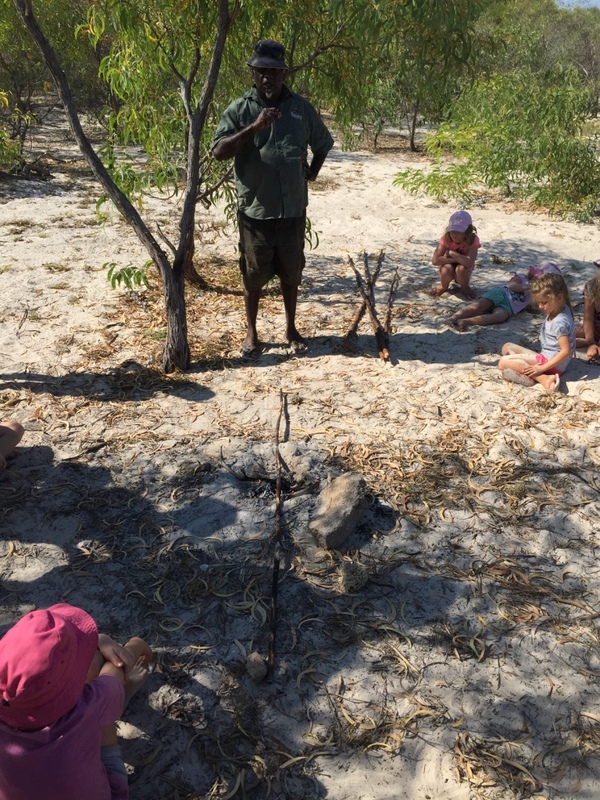 The we drove to the mouth of a creek and we all sat around a fire and Bundy showed us how to warm and straighten a stick of Wattle Tree to create a straight spear. 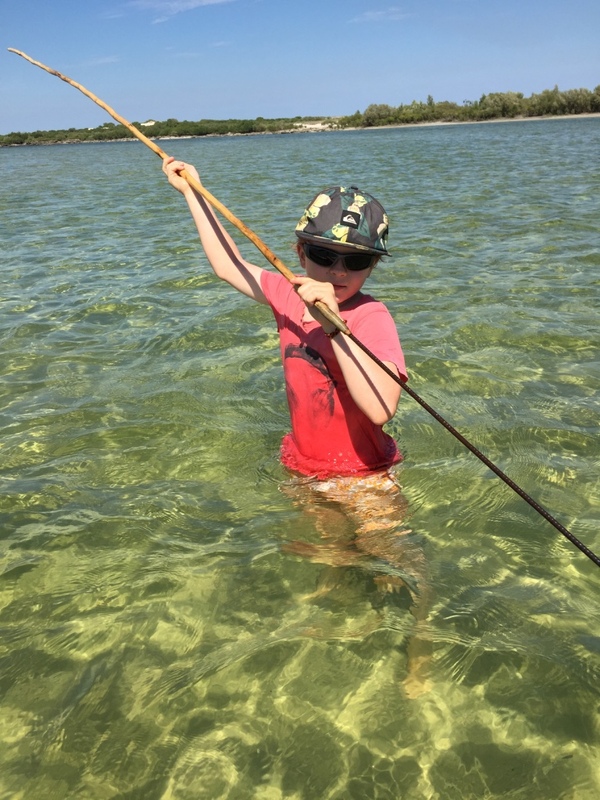 Then we attached metal spear ends and went fishing. At this point I was seriously questioning the wisdom of us all wading thru the water but we continued for a couple of hours. Most of us fully clothed! Hilarious. Unfortunately when we came back into shore the tide had washed our thongs (all five pairs away) we luckily recovered one pair and two left thongs from Aaron and Andrews thongs! 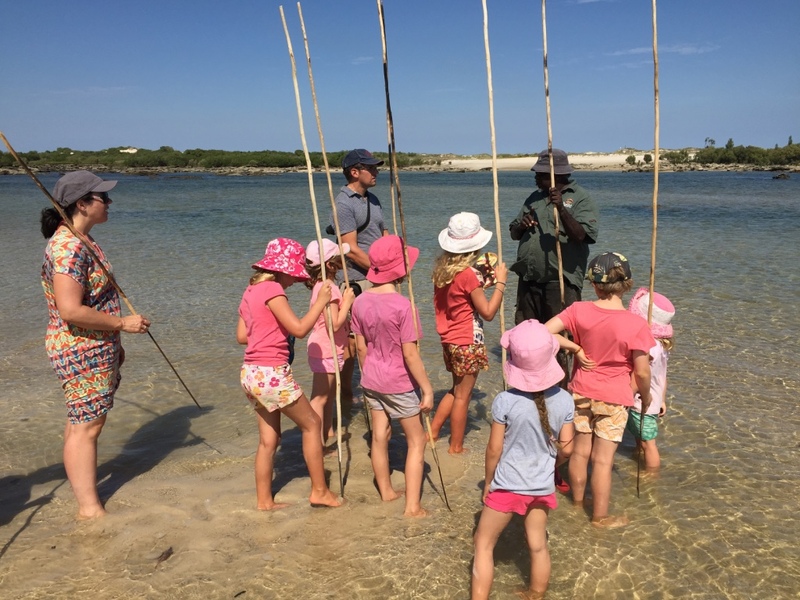 Despite the best efforts of our group no one managed to spear any fish however we were gifted the catch from the young aboriginal boys that had tagged along. 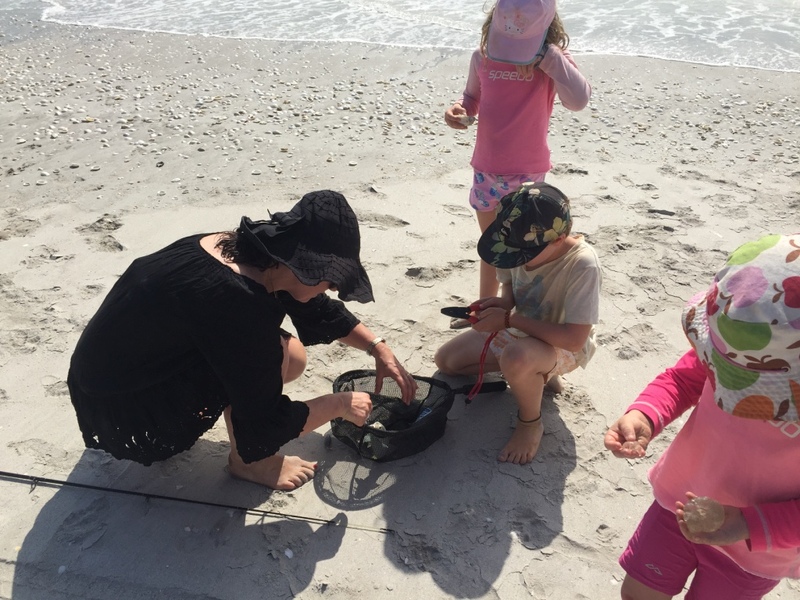 They gave us two large mud crabs, two fish and some cockles that Bundy and the kids dug up. 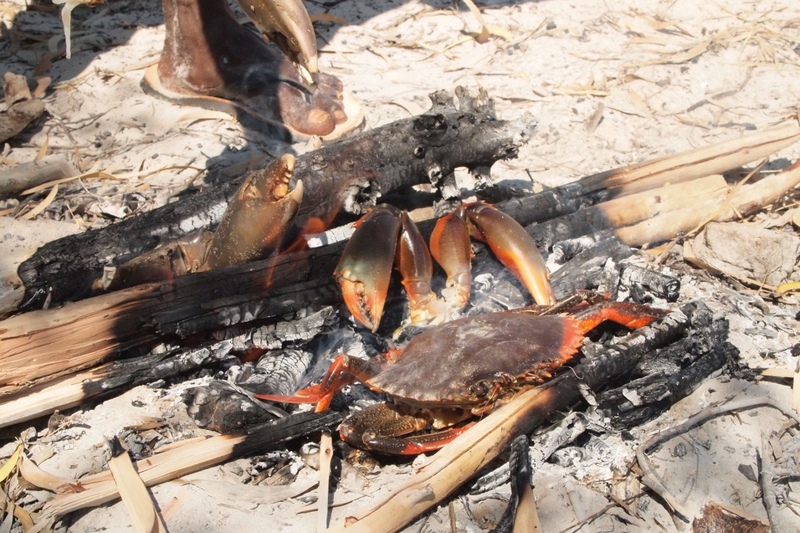 Bundy cooked these on the fire in the traditional way for us to share. 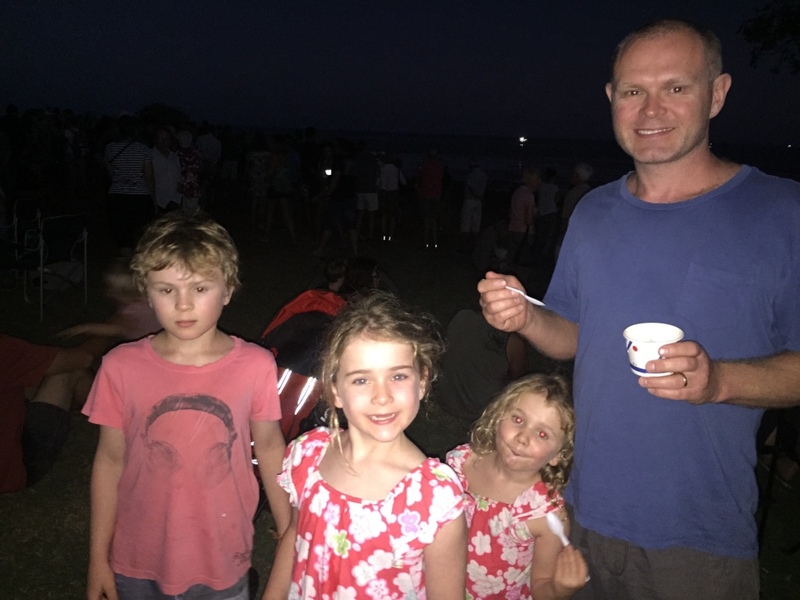 It was so fresh and delicious – the kids tried it but didn’t enjoy it as much as the adults. 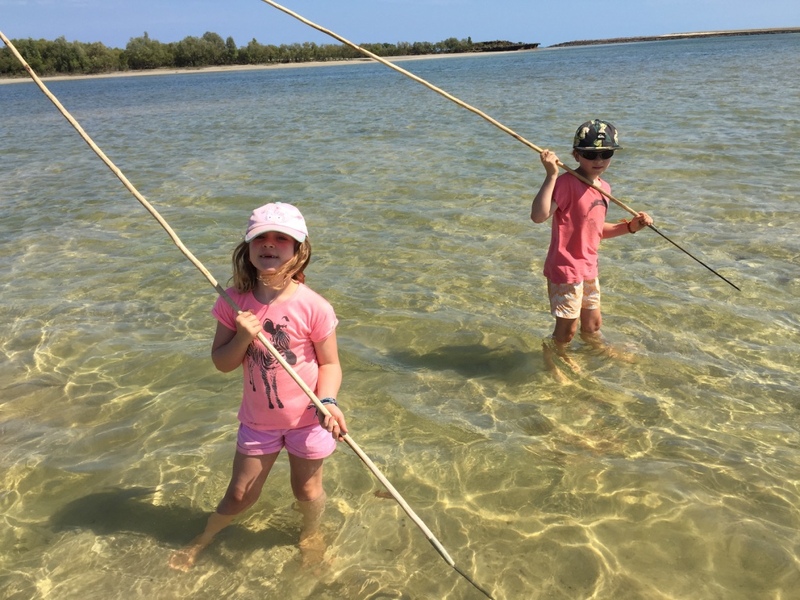 It was a fantastic day and the kids were thrilled to be the proud owners of their newly made spears. 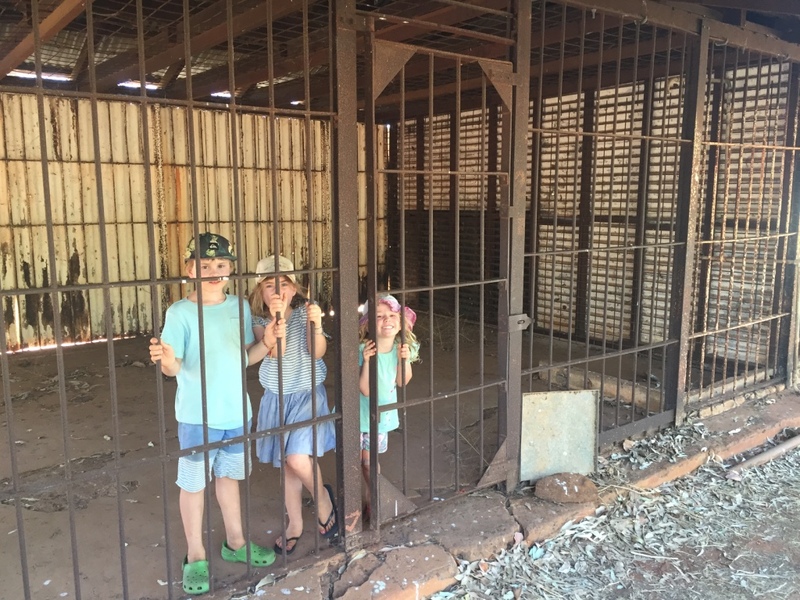 We tried to gift these back to Bundy but the three voted to keep them. (more stuff on the roof racks). 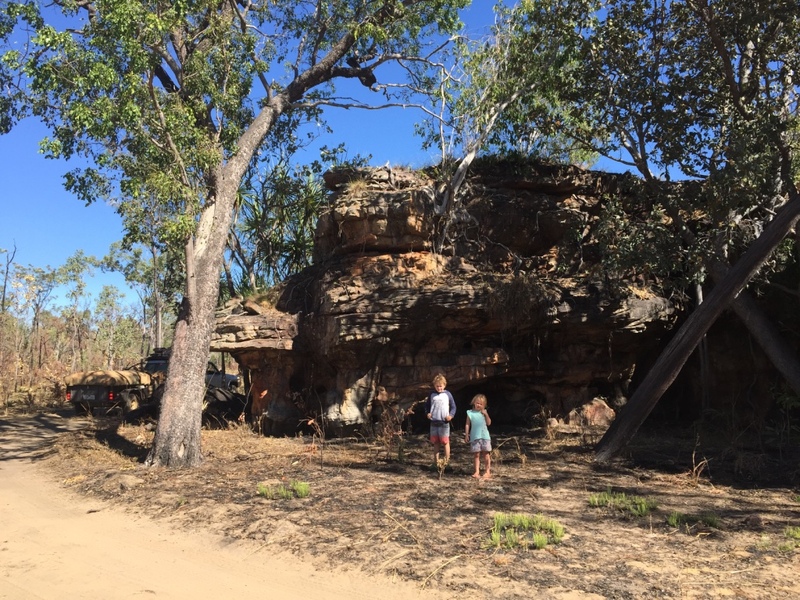 At the end of the tour Bundy took us to the site of some ancient foot prints in the rock which have been estimated to be 8000 years old and were noted in the native title claim for the Bardi People and the recognition of their long history with this area. The foot prints were pretty amazing we all thought it looked like the person was running perhaps from a fire? 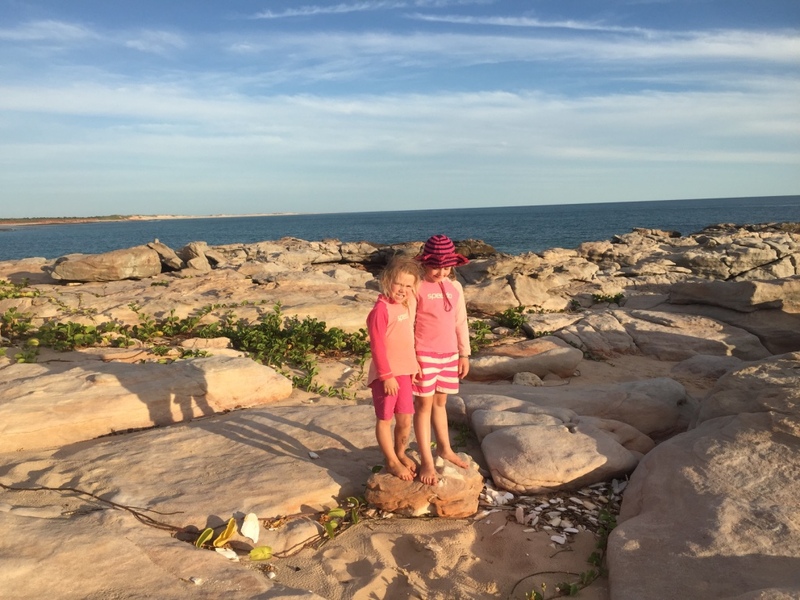 For the next few days we hung out at Cape Leveque tried using the fishing spears, swam and relaxed. 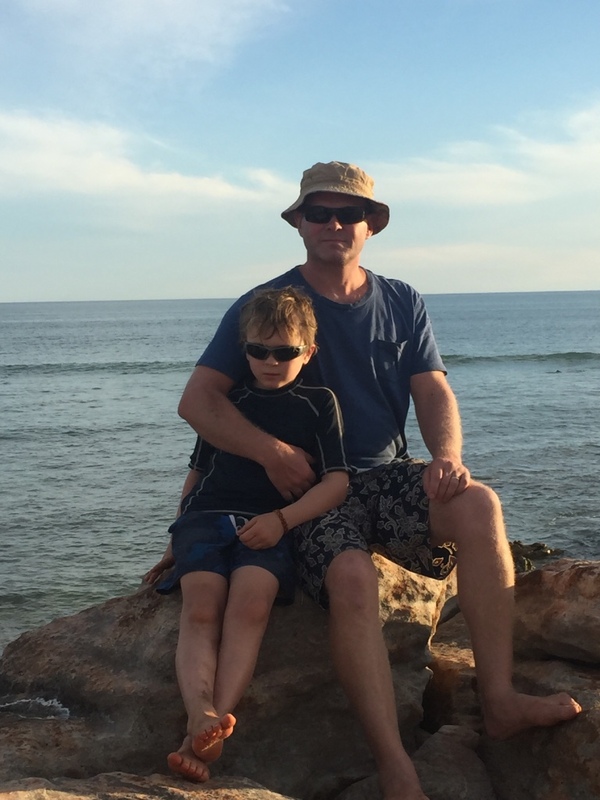 We went for walks along the amazing coastline. 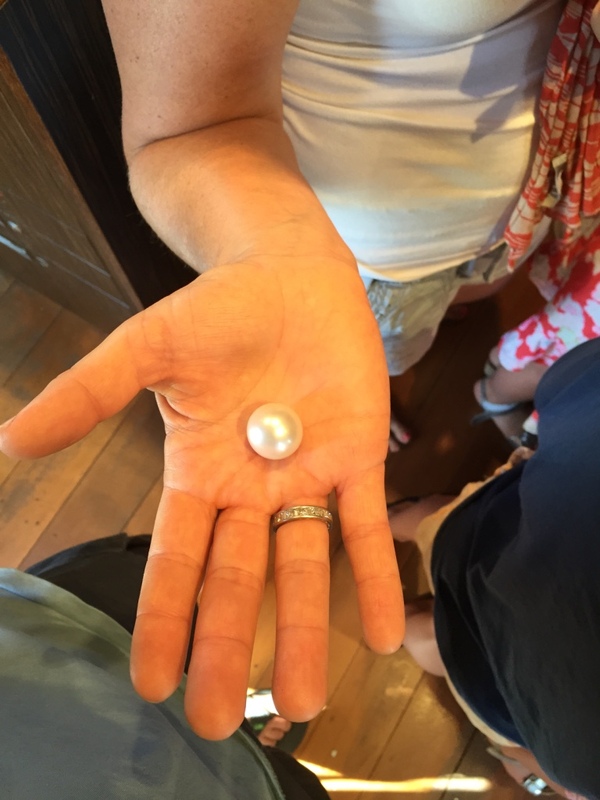 We visited the Cygnet Bay Pearl farm and learned all about the cultured pearl farm business. It was really interesting to see the science behind the growing of thousands of pictada oysters to grow cultured pearls. We opened a shell only to find that the pearl produced was of little or no value. 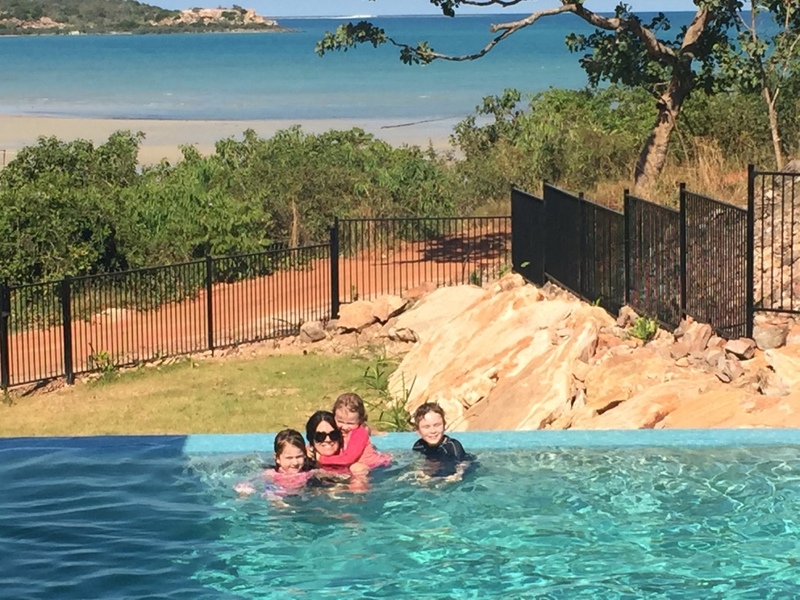 After the tour of the pearl farm we had lunch at the café and swam in the newly opened pool. 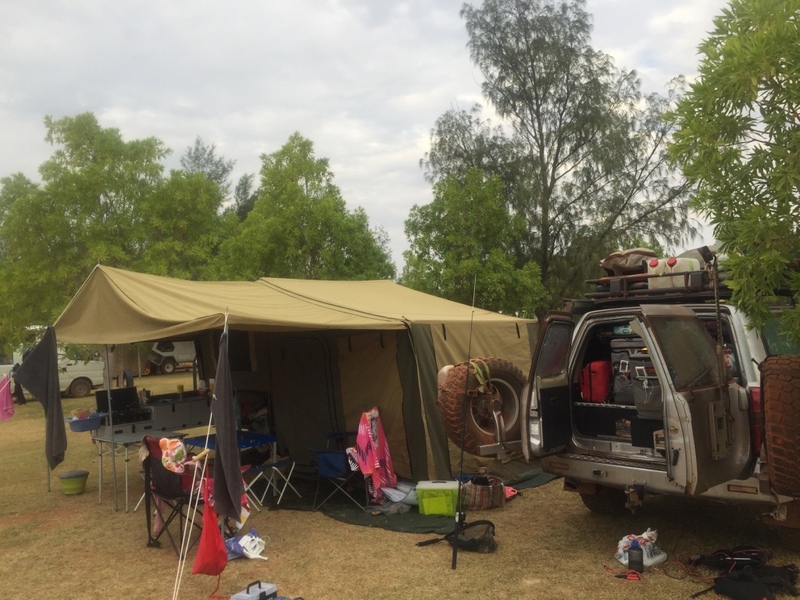 There is accommodation and camping available at the pearl farm but the camps we checked are set in the bush with no views of the water but looked good. Cool Boat with wheels drove itself out of the water! 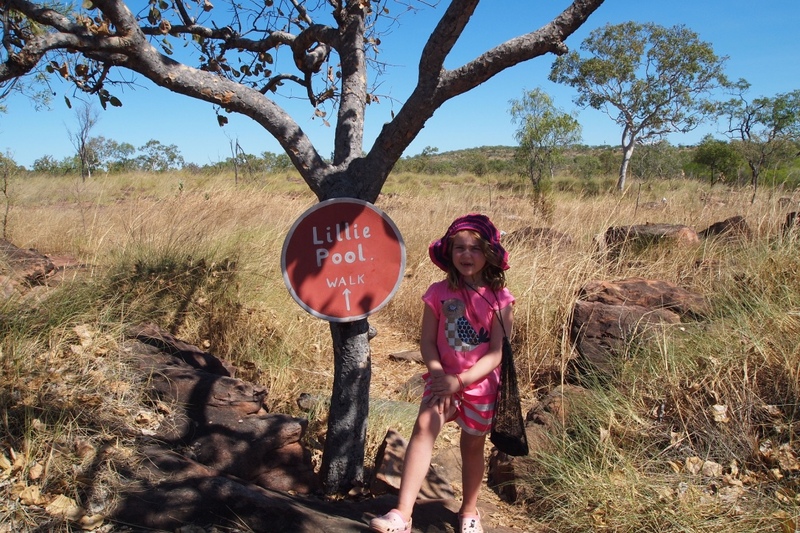 We also visited One Arm Point ( we wondered if named so due to an unfortunate incident with a crocodile?) 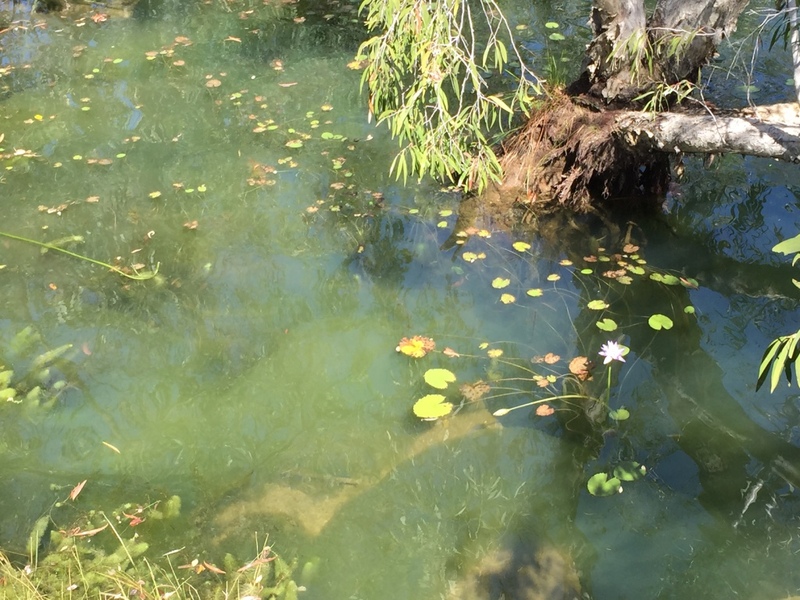 here the local community have a trocus hatchery and an aquarium which we really enjoyed visiting. 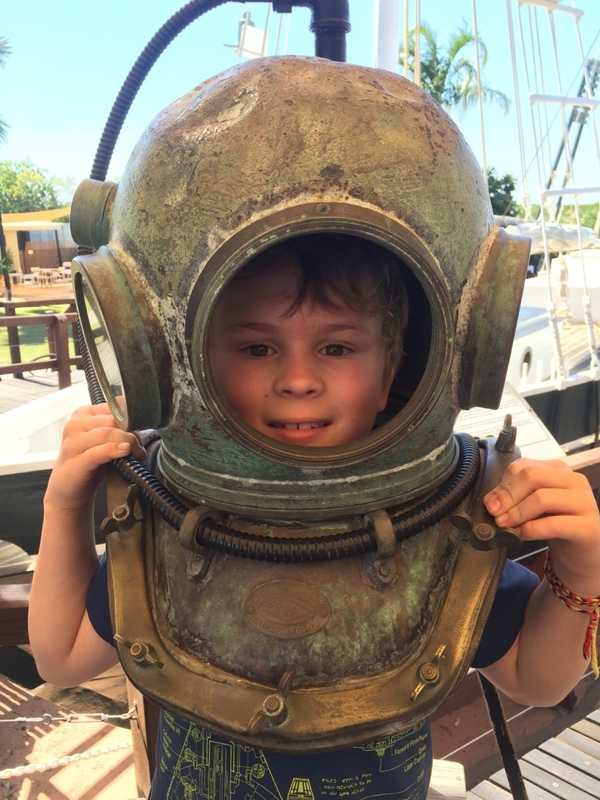 There were lots of interesting fish in the tanks and we fed the fish and a large barramundi which moved slowly around their tank until a little fish was dangled and then they lept out and grabbed their feed. 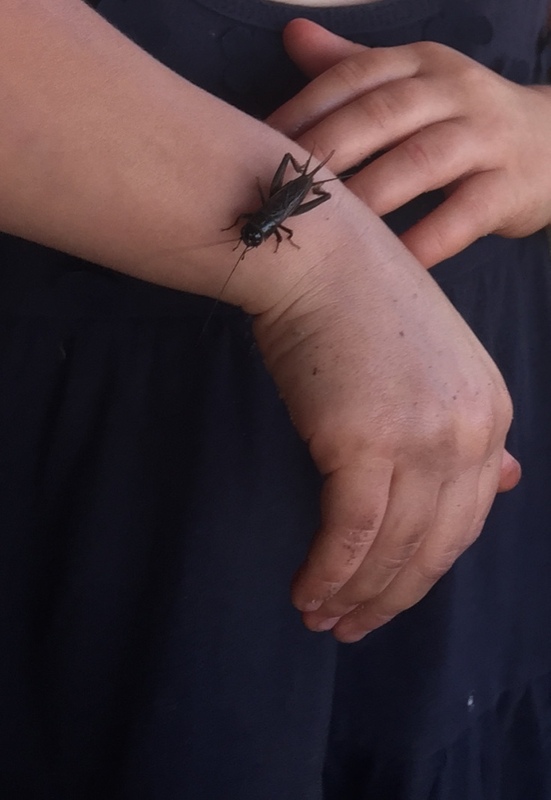 It was scary how fast they moved and gave us all a huge fright. At the hatchery they grow the trocus and then release them back into the nearby waters. 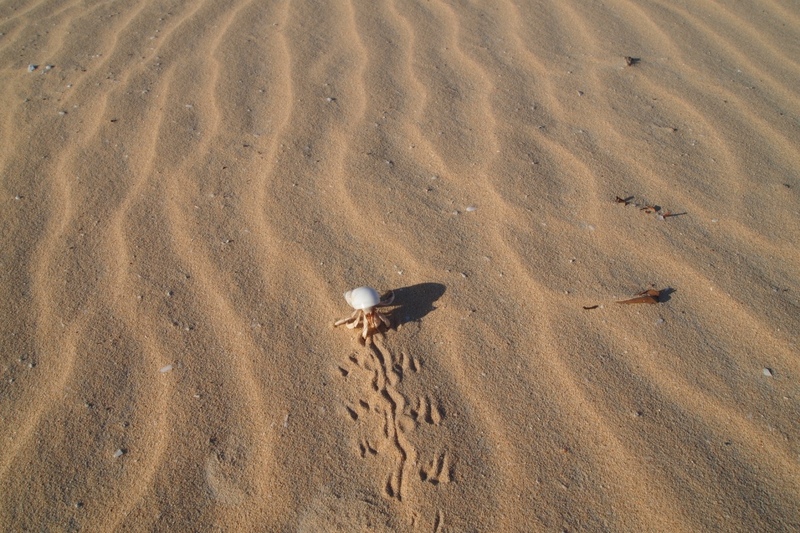 Once fully grown they then collect the shells at high tide and polish and sell the shells overseas and locally. 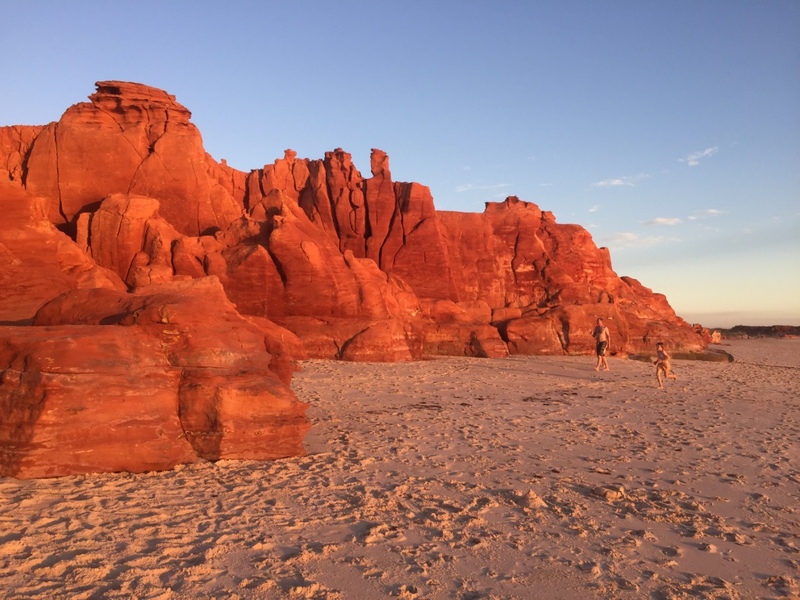 Cape Leveque was simply stunning and we really enjoyed our visit to this pristine and culturally rich part of Australia. 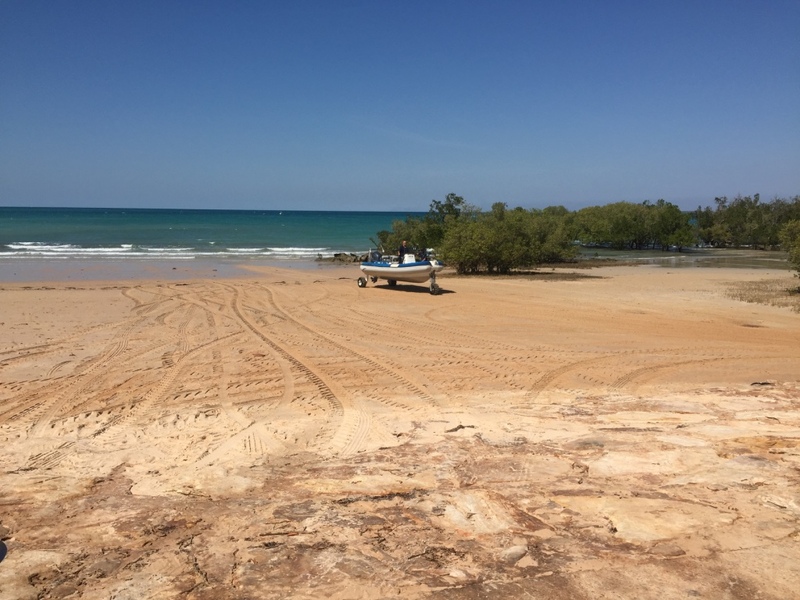 We had a brief stop over for two nights at 80 Mile Beach and saw the amazing tidal changes which can be as much as a 10metre variance between the high tide and the low tide. 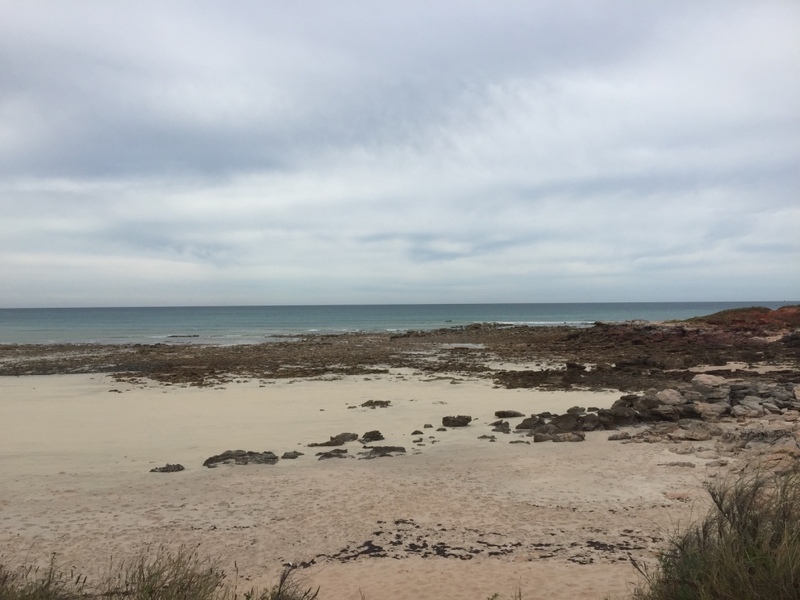 The low tide on 80 Mile Beach goes out for nearly a kilometre. 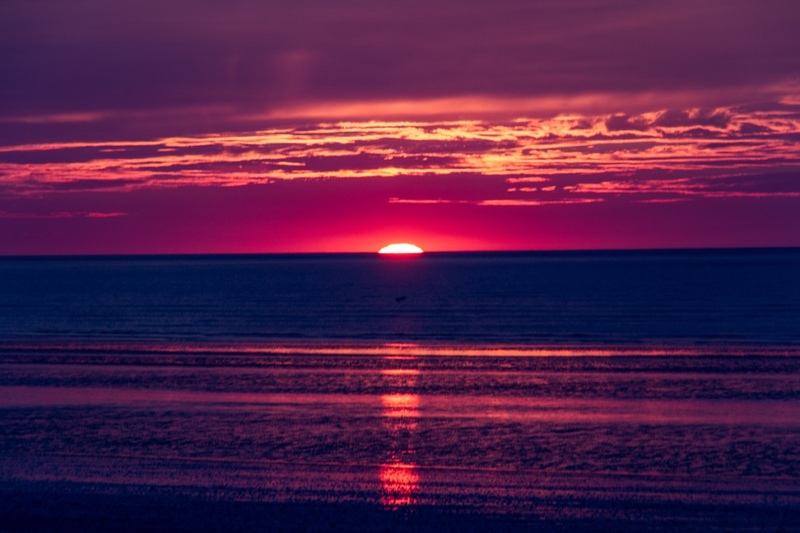 This extreme tidal movement meant the beach has sand and mud flats out for a huge distance at low light making it hard to see where land finishes and the sea starts. The tide comes in fairly quickly however at high tide the water was all murkey and not great for swimming. 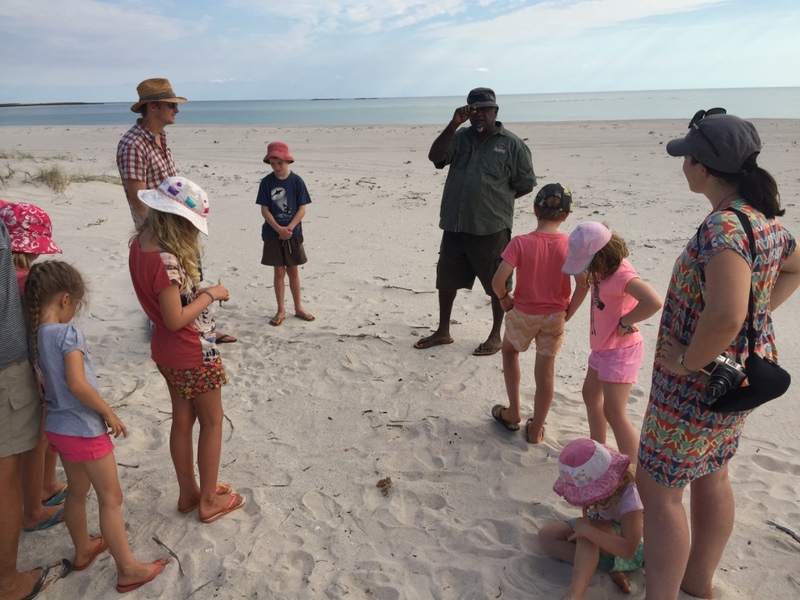 We were also told a large tiger shark had been visiting the beach over the last week so we decided not to swim. 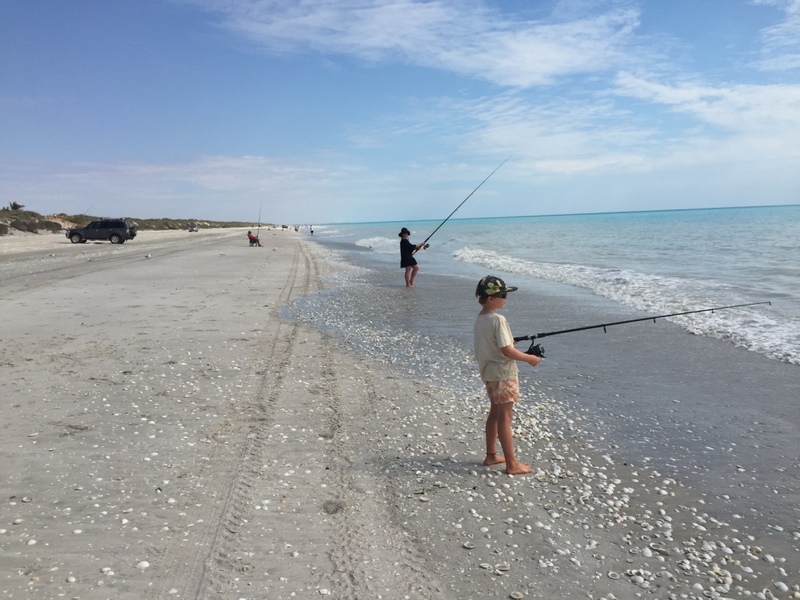 The beach is famous for fishing and the caravan park was full of fishing enthusiasts. 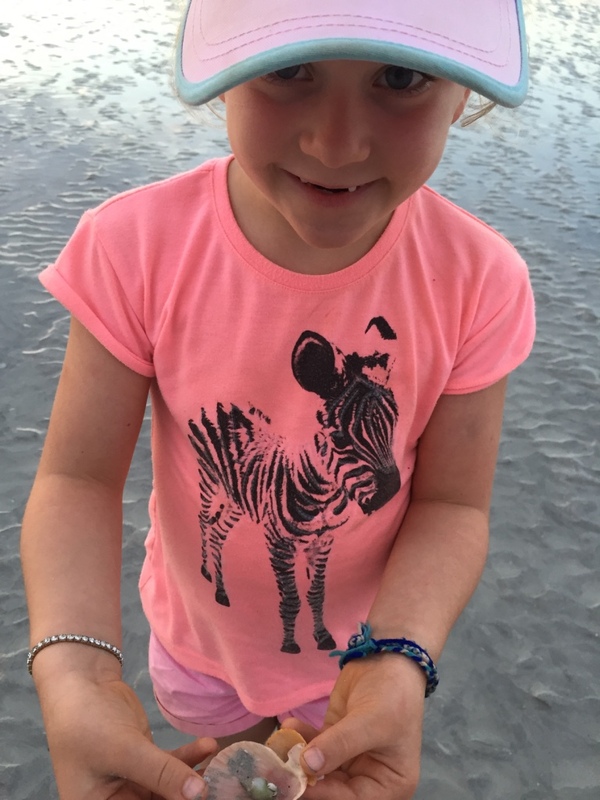 We enjoyed walking on the beach which had thousands of shells and lots of hermit crabs. 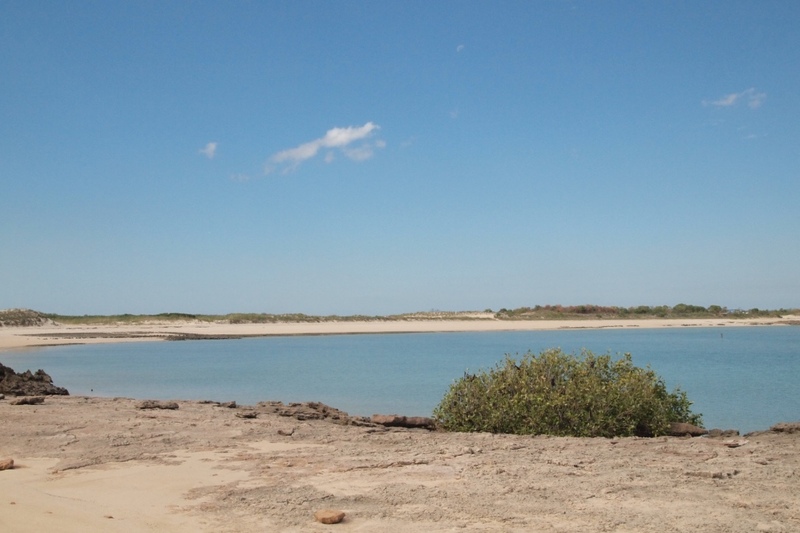 It is a beautiful spot but unless you are a fishing enthusiast not a place to stay for too long. 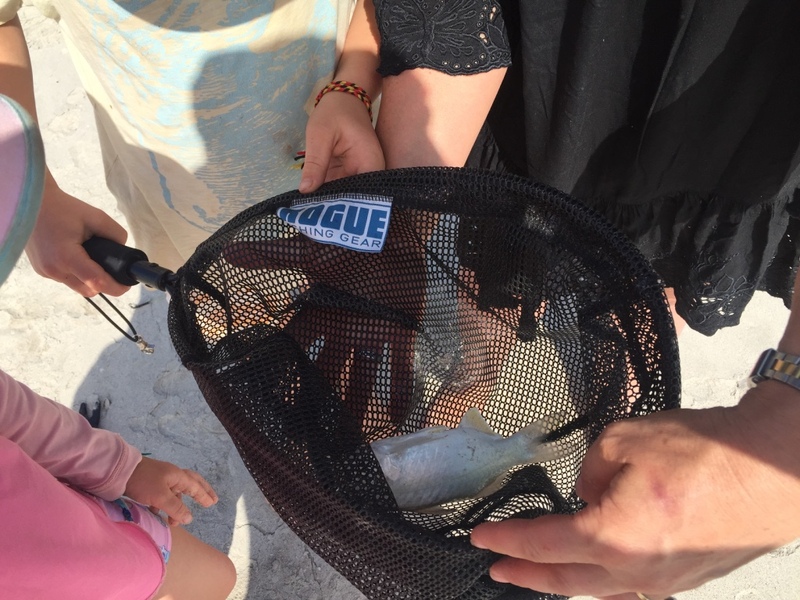 We were certain that we might catch a salmon here (often they are caught right off the beach) but we only caught a small cat fish which we kissed for luck and threw back to the sea. 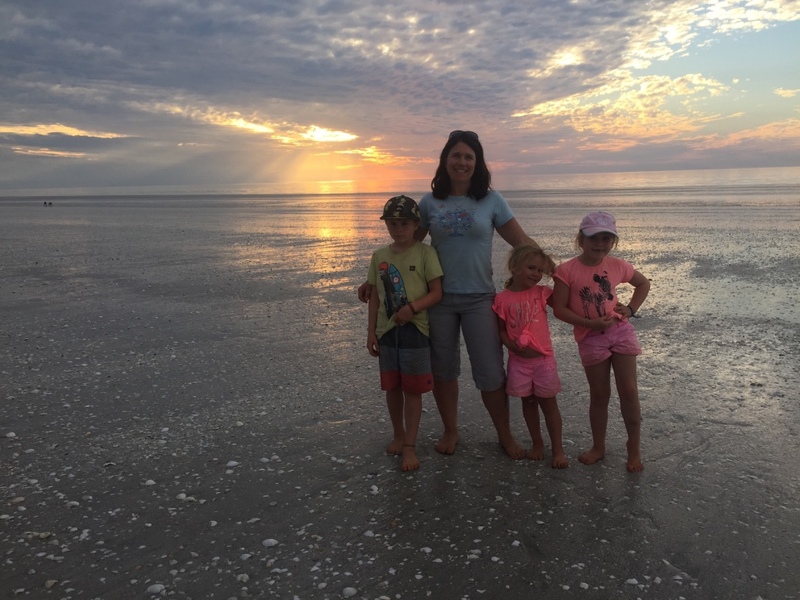 We did enjoy two amazing sunsets here at 80 mile beach and Bianca practised riding without training wheels – she is going really well now!